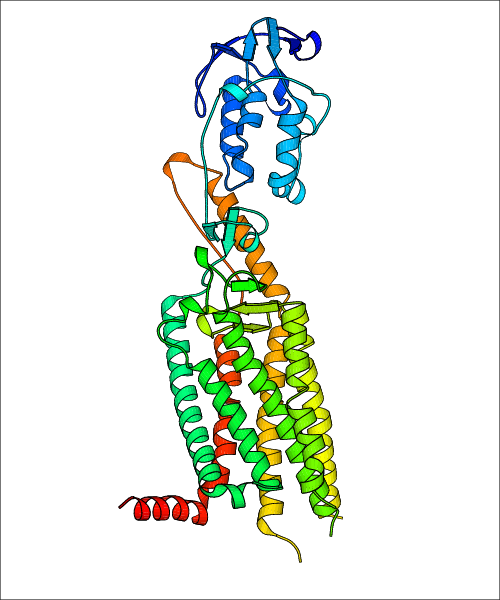 GPCR-EXP is a database that specializes in curating experimental and predicted structures of G protein-coupled receptors (GPCR). 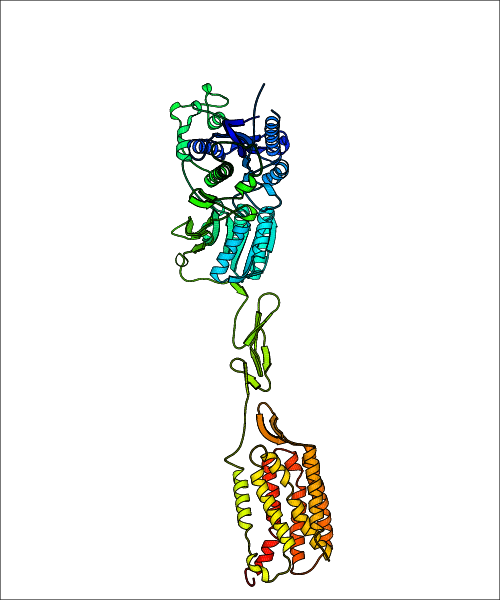 Structure-related data for experimental structures, such as resolution, publication information, and biological ligand, from the Protein Databank (PDB) are extracted and incorporated into the database. 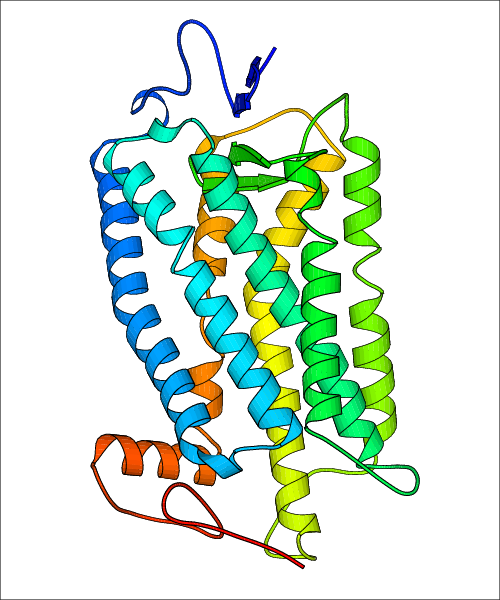 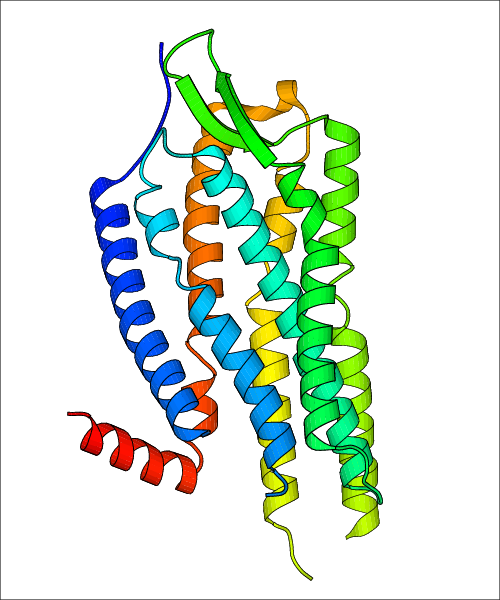 Additionally, all GPCRs from the human genome have been modelled using GPCR-I-TASSER and have been included. 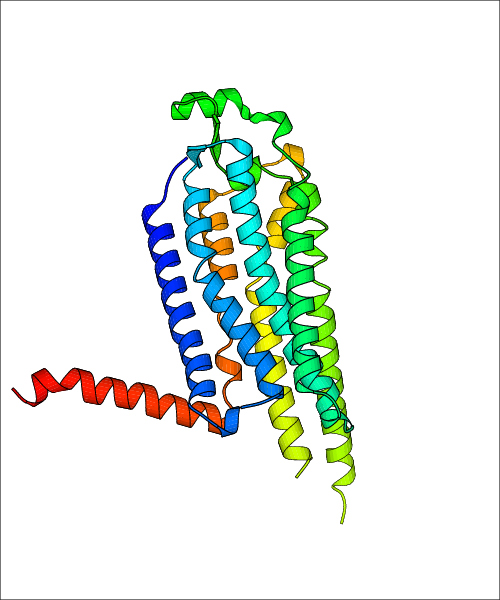 Furthermore, database statistics can be accessed to provide a glimpse into the current state of GPCR structural biology, while all PDB structures and data are freely available for download. 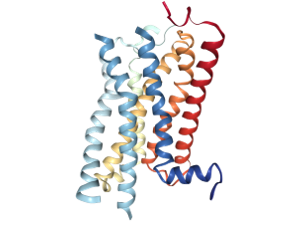 G protein-coupled receptors (GPCR) are an important superfamily of receptors that are involved in a plethora of physiological functions. 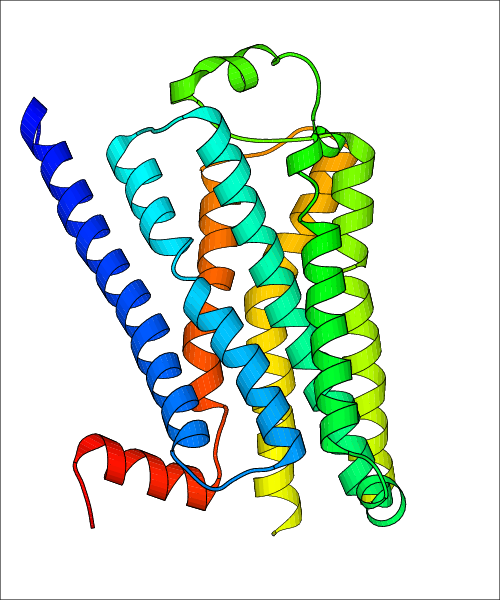 Perhaps not surprisingly, they have been implicated in many diseases, such as cancer and diabetes. 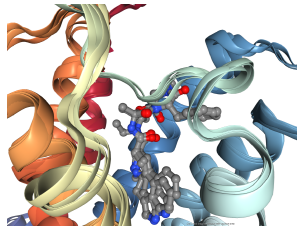 Having the 3D structure of these receptors plays an enormous role in elucidating its function and medical relevance, as well as facilitating structure-based drug design. 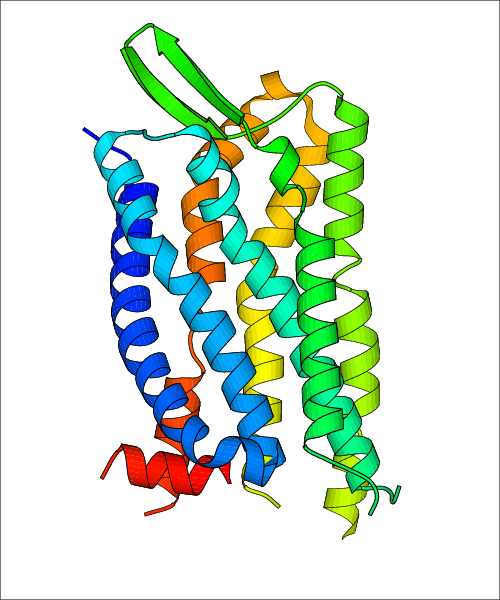 In order to address this need, GPCR-EXP database is developed to comprehensively collects and curates data about all known GPCR structures. 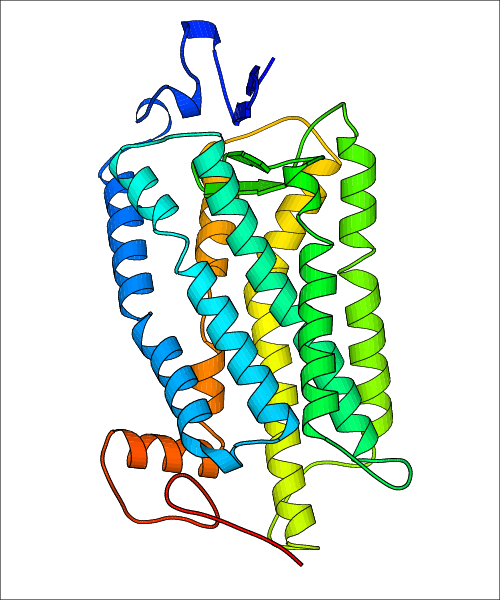 GPCR-EXP is designed primarily to be browsed by the user and is organized into two major areas: 1. Experimental PDB structures, and 2. 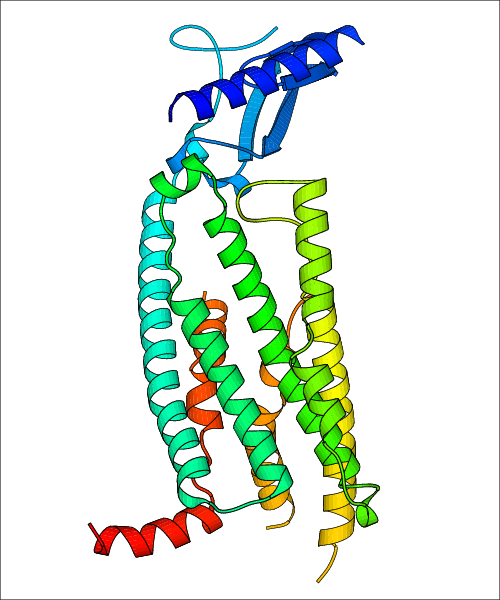 Predicted Structures for the Human Genome. GPCRs are stratified into Class A, Class B, Class C, and Class F for both areas, while predicted structures have the additional categories of 'Other' and 'Putative'. 'Other' GPCRS are experimentally verified but do not belong in the other classes, and 'Putative' GPCRs are those that have not yet been experimentally validated. 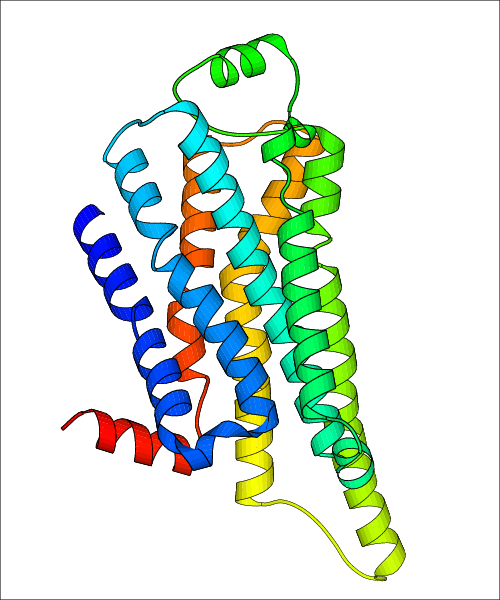 GPCR structures can be browsed by class. 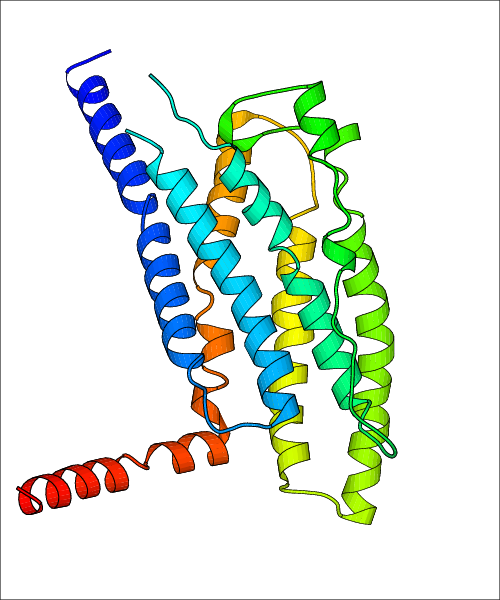 Furthermore, users have the option to browse all structures for either major area all at once in one table. Data for experimental structures are grouped by GPCR if browsing by class. 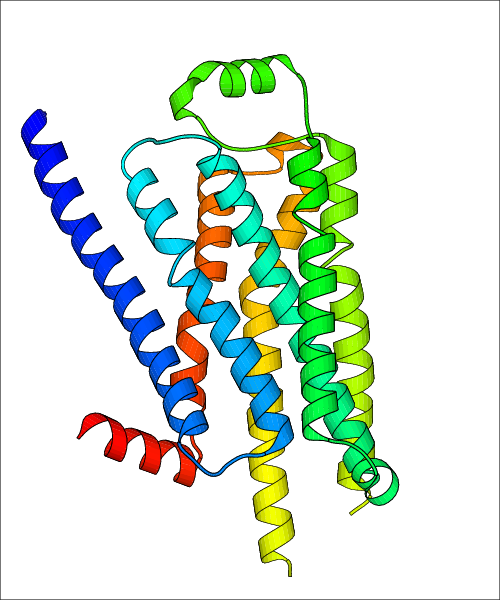 For example, all available PDB structures for the 5-hydroxytryptamine receptor 1B are lumped into the same table. 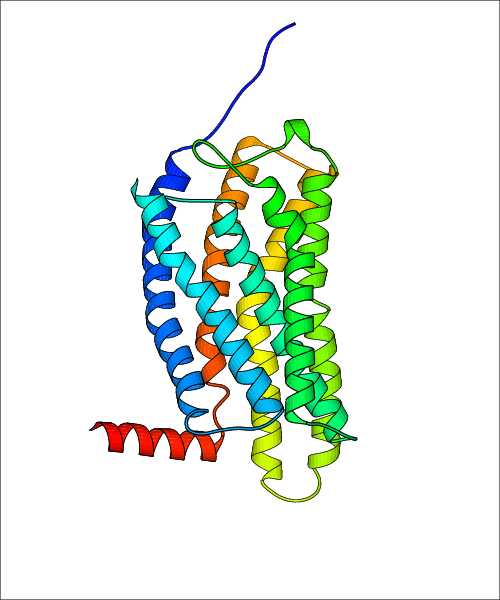 As shown in Figure 1, each PDB structure is represented by one row, where general information is given in each column. 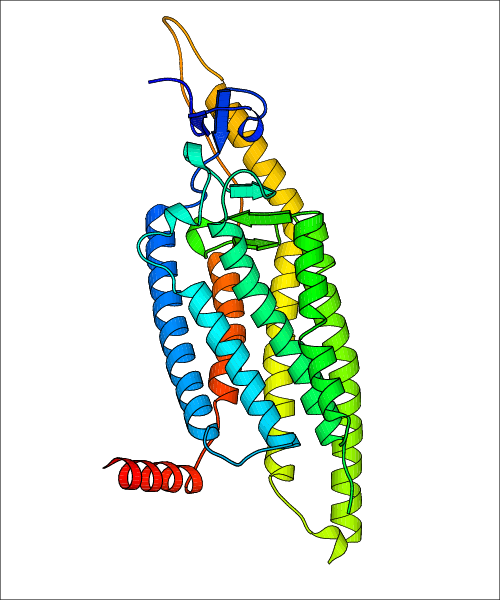 The user can view pre-superposed structures by clicking on 'Overlay Structures'. 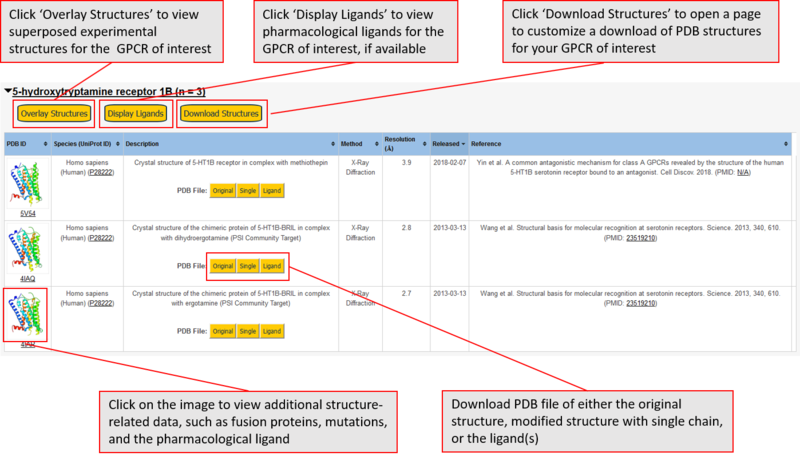 Clicking on 'Display Ligands' will allow the user to view all applicable pharmacological ligands for the structures of the GPCR, whiel clicking on 'Download Structures' provides a customizable download of PDB files. 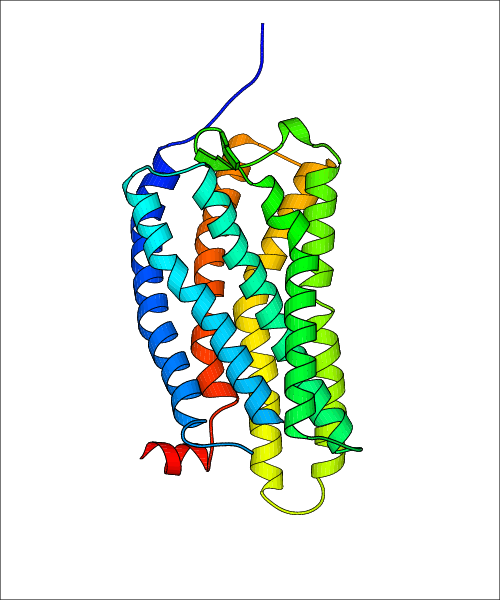 Clicking on the image of the GPCR structure will lead to additional structural and functional data about the PDB structure. 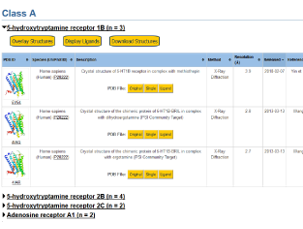 Lastly, single PDB files can be downloaded from the table of either original structure, single chain structure, or ligand. 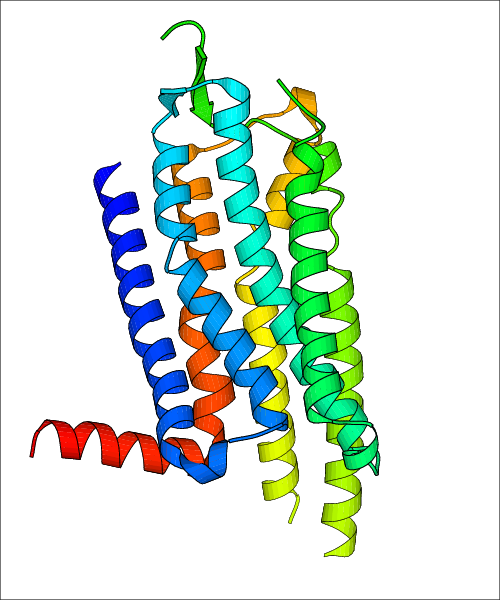 Data for predicted structures are grouped by sub-class for Class A GPCRs but grouped together for the other classes. 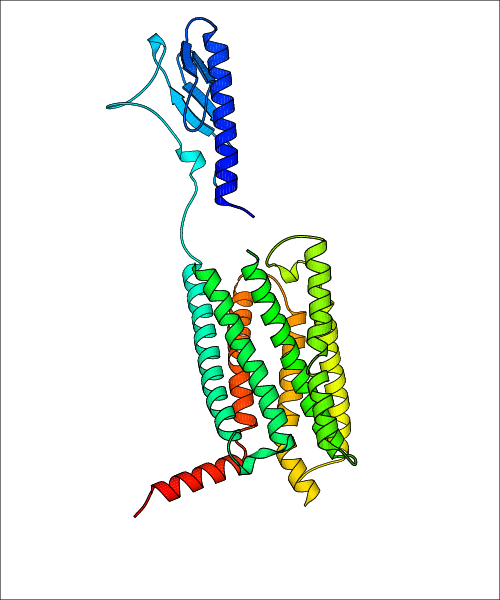 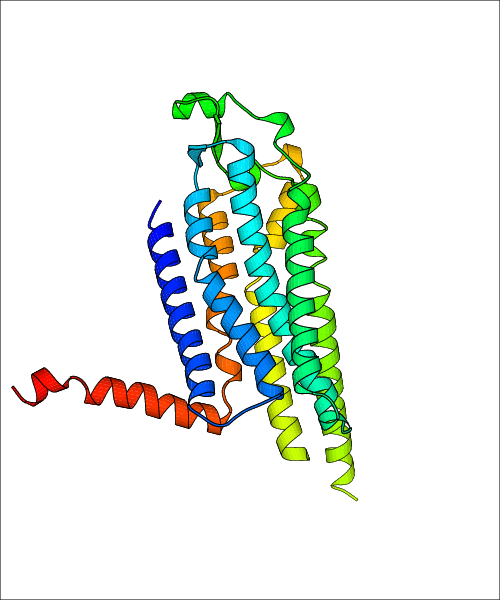 Figure 2 shows a a grouping of the Class A Acetylcholine receptors, where each row represents a GPCR. 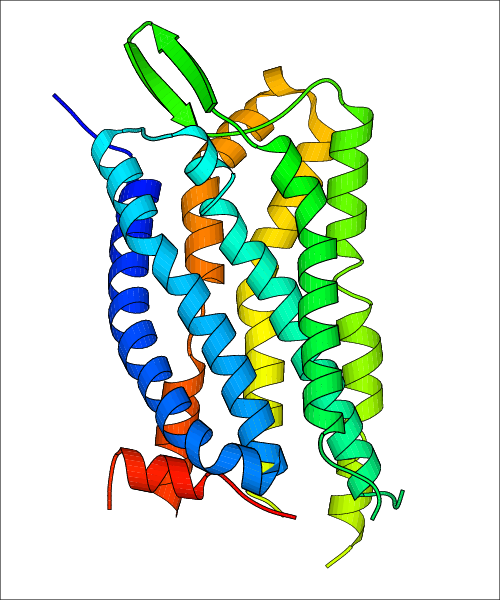 General information, such as name and prediction statistics, are given in the columns. 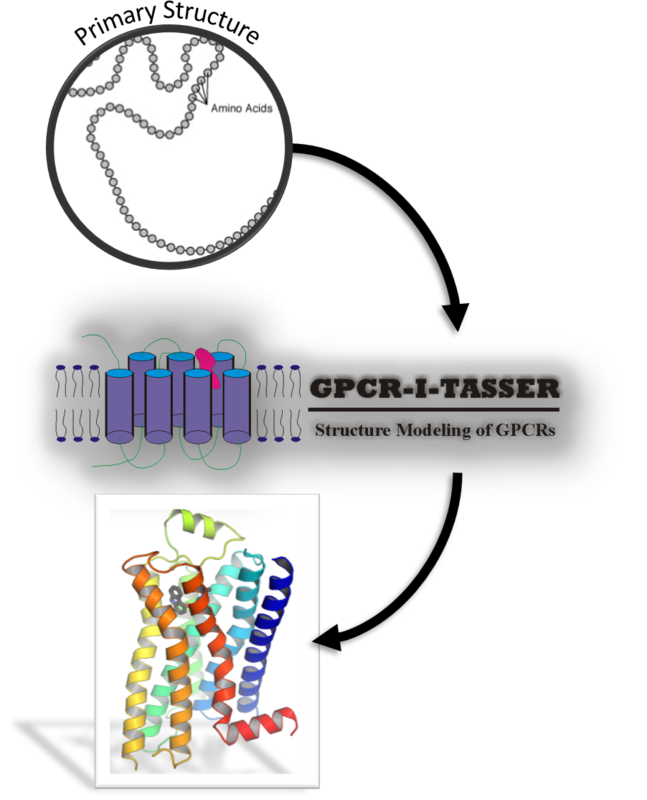 The user can click on 'Detailed Data' to access a more comprehensive results page generated by GPCR-I-TASSER. Wallace Chan, Chengxin Zhang, Mohamed Said, S.M. 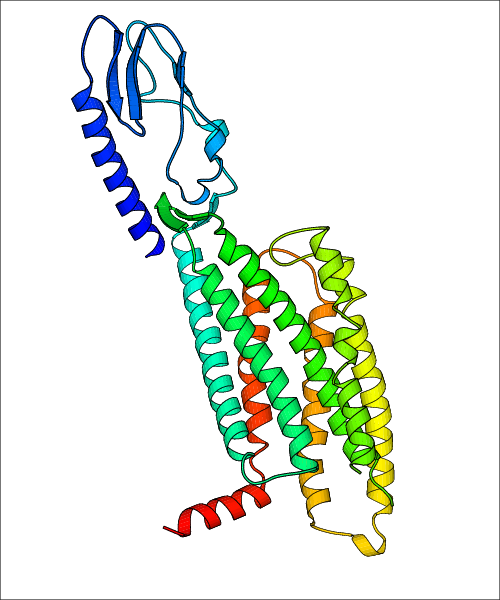 Mortuza, Yang Zhang. 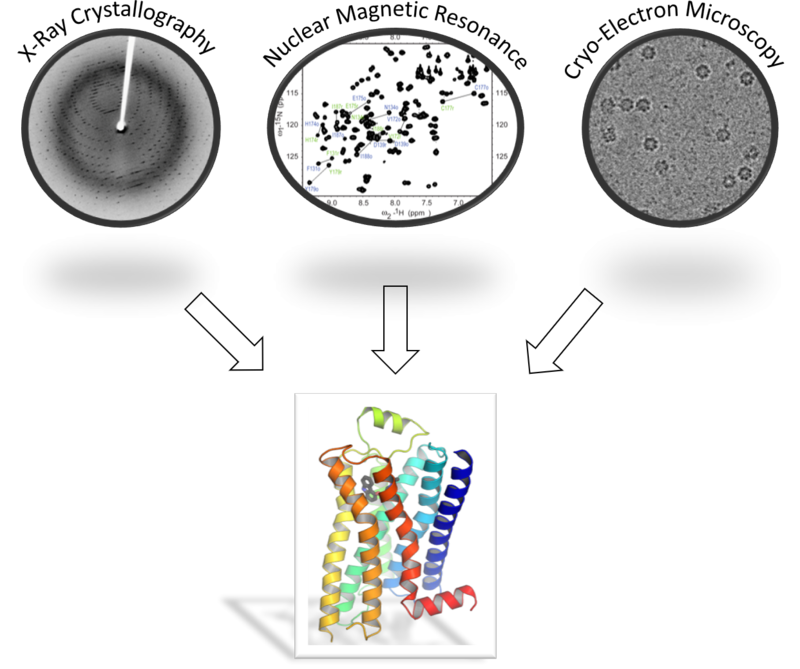 GPCR-EXP: A semi-manually curated database for experimentally-solved and predicted GPCR structures. 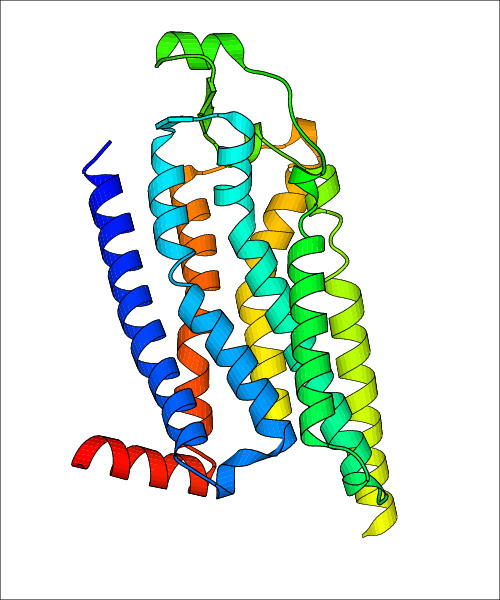 (2018) In preparation. 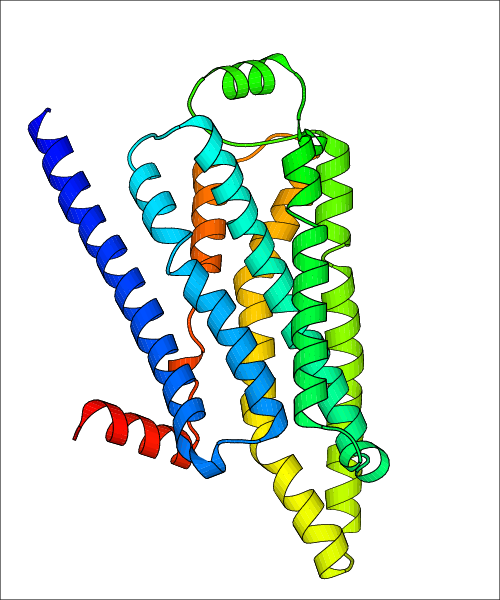 GPCRs of the same kind (i.e. mu opioid receptor) are superposed irrespective of species. 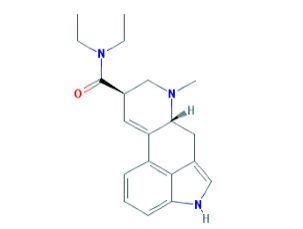 Includes ligands, as well. 4NC3 Homo sapiens (Human) (P41595) Crystal structure of the 5-HT2B receptor solved using serial femtosecond crystallography in lipidic cubic phase. 5OLG Homo sapiens (Human) (P29274) Structure of the A2A-StaR2-bRIL562-ZM241385 complex at 1.86A obtained from in meso soaking experiments. 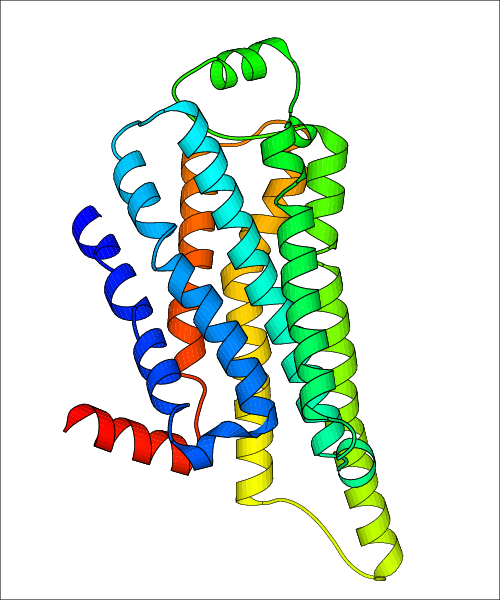 5OLO Homo sapiens (Human) (P29274) Structure of the A2A-StaR2-bRIL562-Tozadenant complex at 3.1A obtained from in meso soaking experiments. 5OM1 Homo sapiens (Human) (P29274) Structure of the A2A-StaR2-bRIL562-Compound 4e complex at 2.1A obtained from in meso soaking experiments (1 hour soak). 5OLV Homo sapiens (Human) (P29274) Structure of the A2A-StaR2-bRIL562-LUAA47070 complex at 2.0A obtained from in meso soaking experiments. 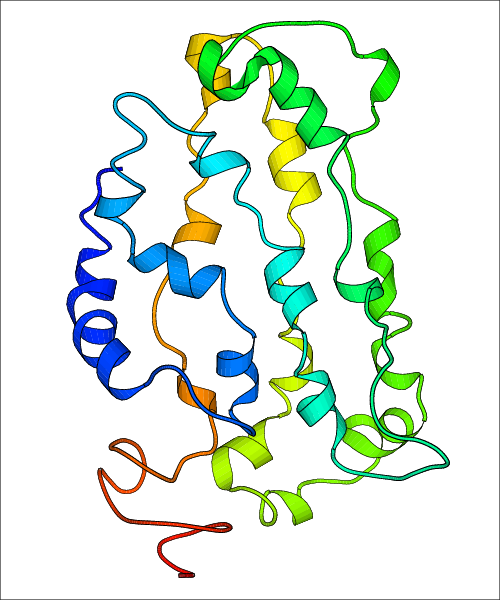 5OLZ Homo sapiens (Human) (P29274) Structure of the A2A-StaR2-bRIL562-Compound 4e complex at 1.9A obtained from bespoke co-crystallisation experiments. 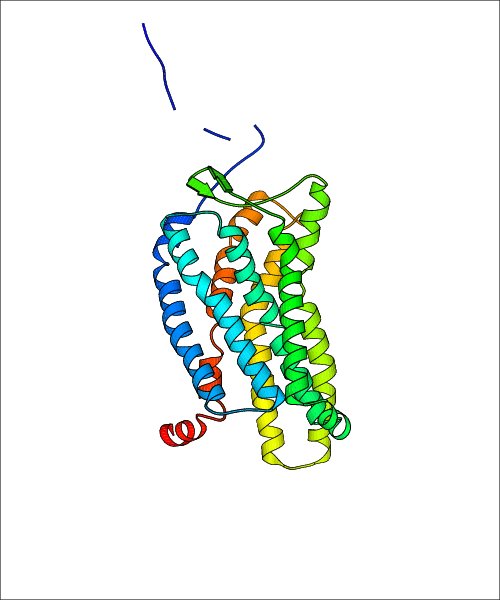 5OLH Homo sapiens (Human) (P29274) Structure of the A2A-StaR2-bRIL562-Vipadenant complex at 2.6A obtained from in meso soaking experiments. 5OM4 Homo sapiens (Human) (P29274) Structure of the A2A-StaR2-bRIL562-Compound 4e complex at 1.86A obtained from in meso soaking experiments (24 hour soak). 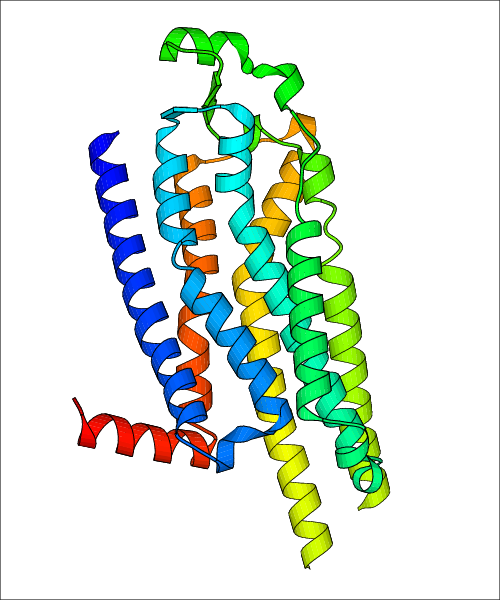 3EML Homo sapiens (Human) (P29274) The 2.6 A Crystal Structure of a Human A2A Adenosine Receptor bound to ZM241385. 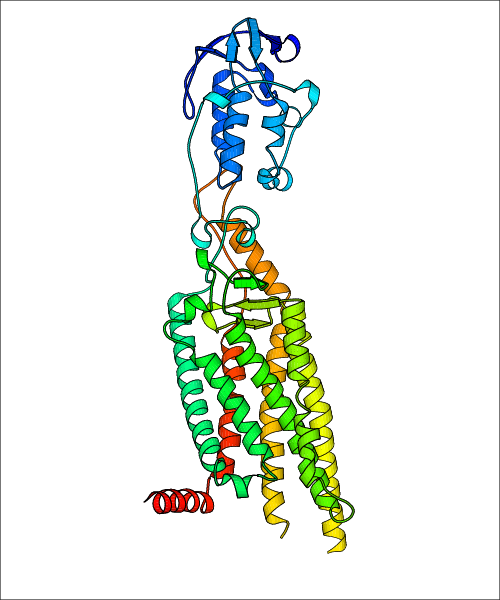 2RH1 Homo sapiens (Human) (P07550) High resolution crystal structure of human B2-adrenergic G protein-coupled receptor. 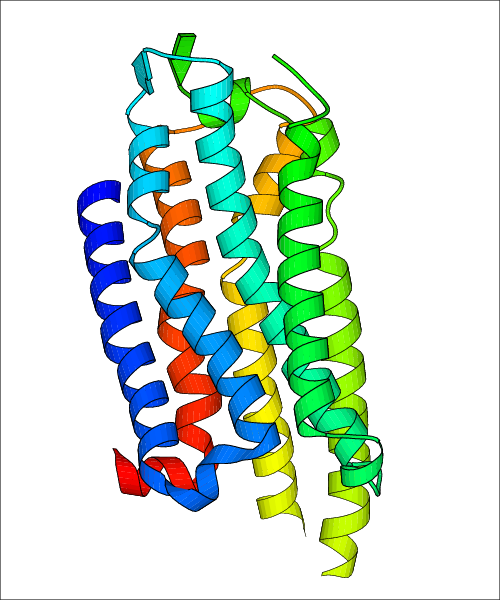 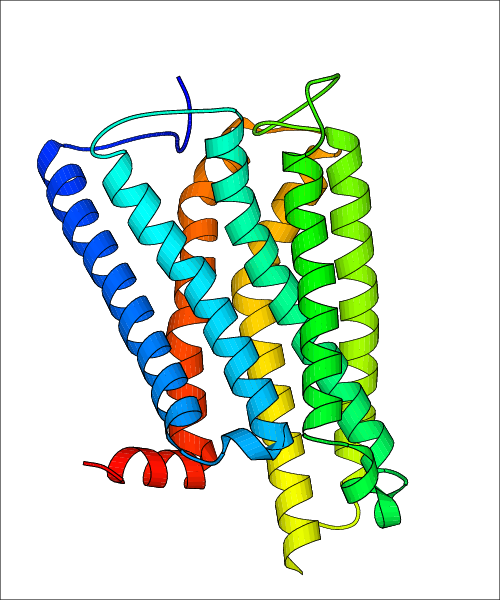 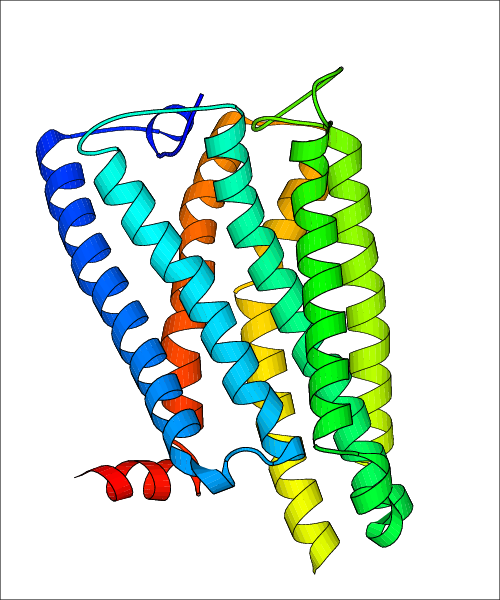 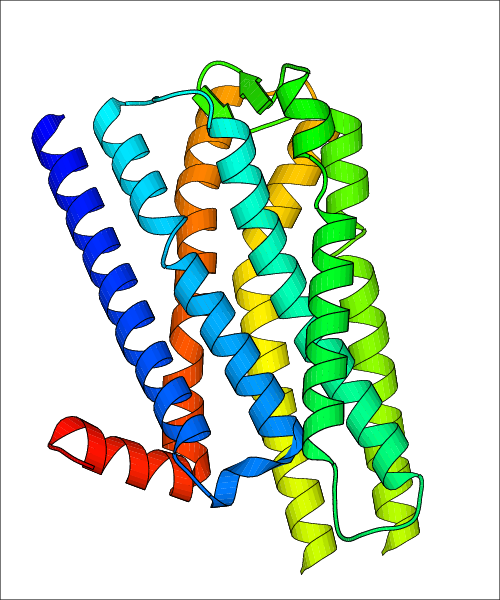 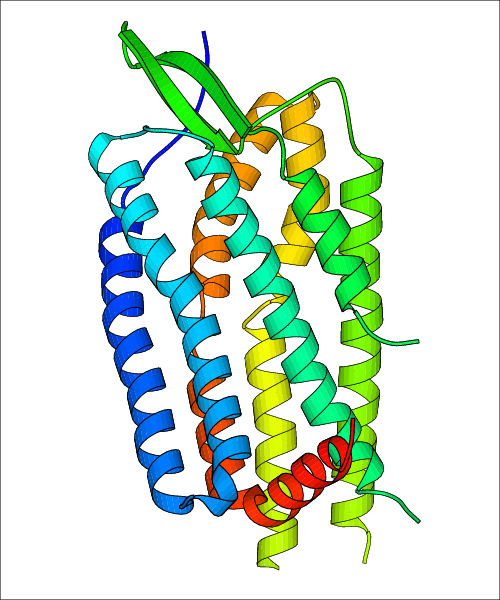 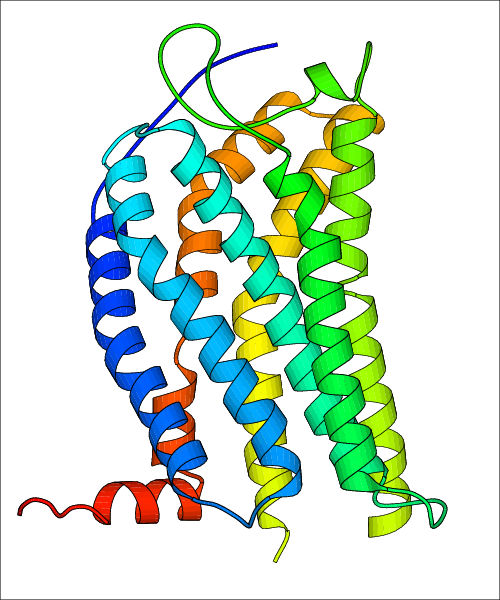 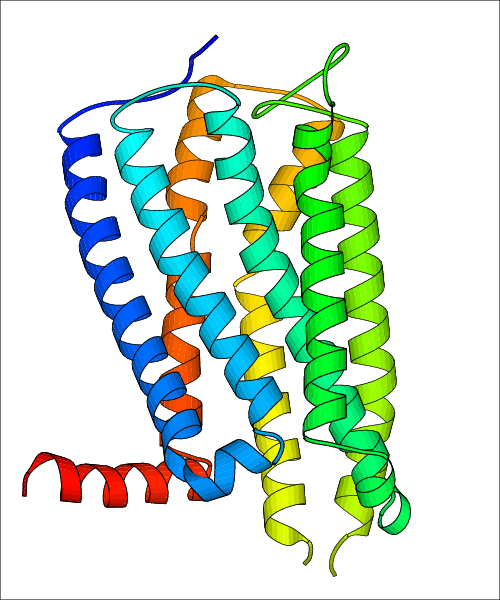 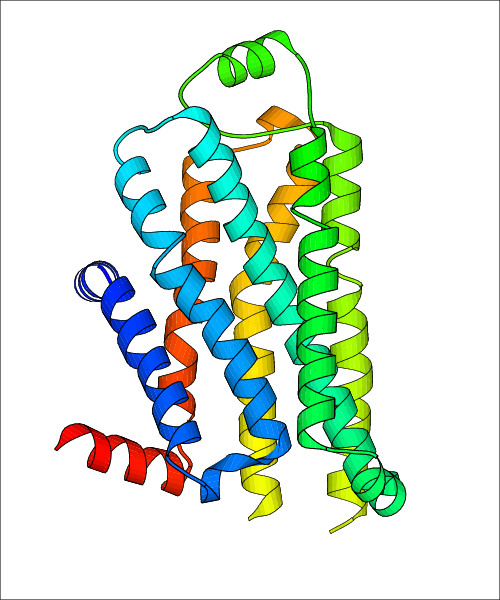 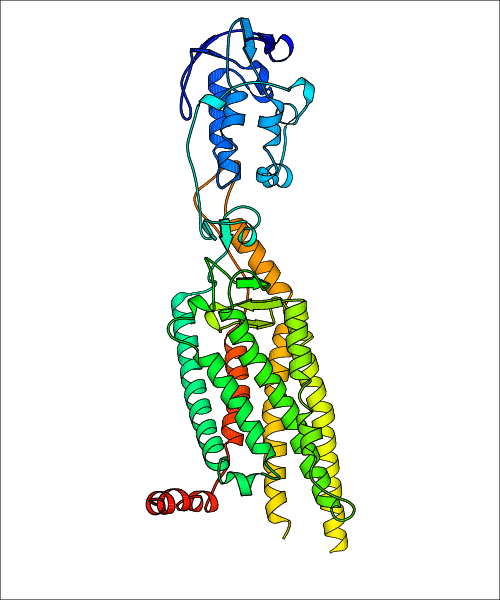 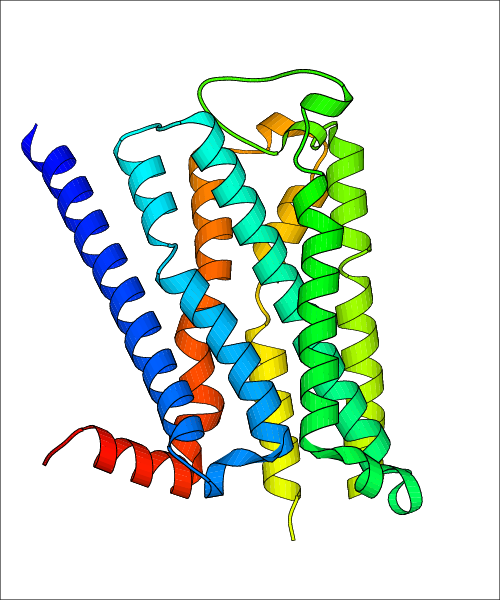 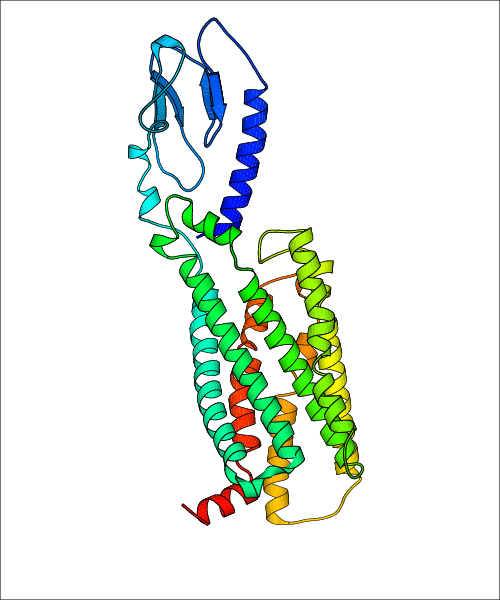 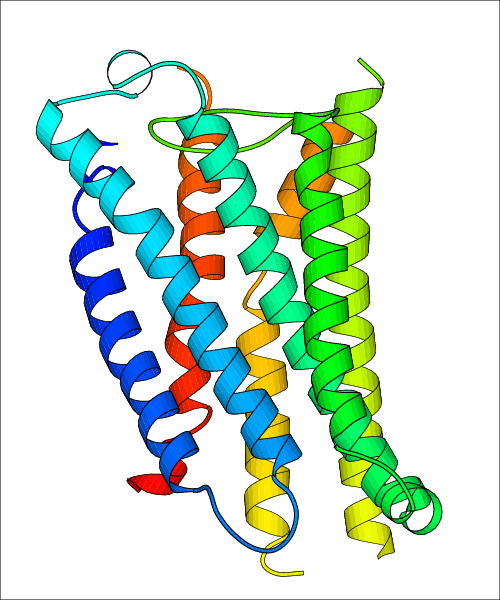 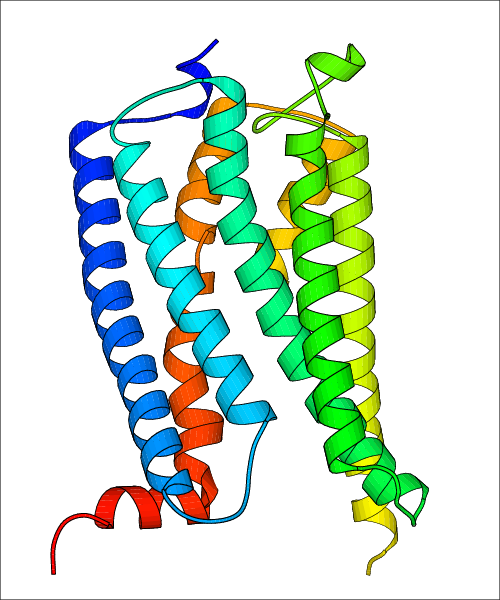 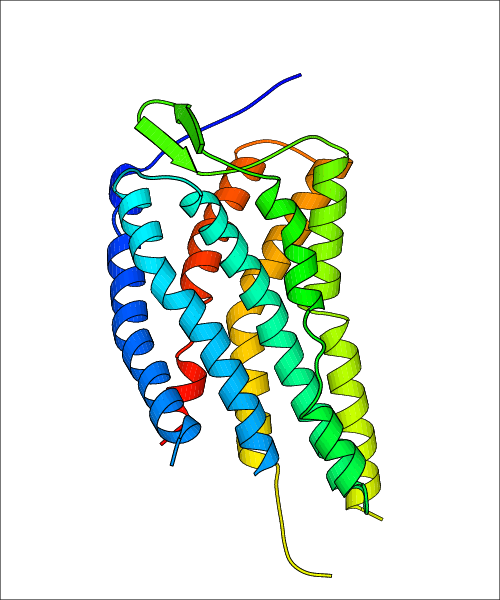 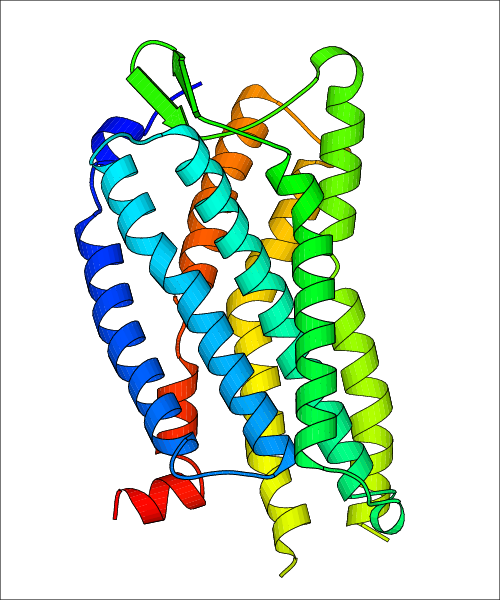 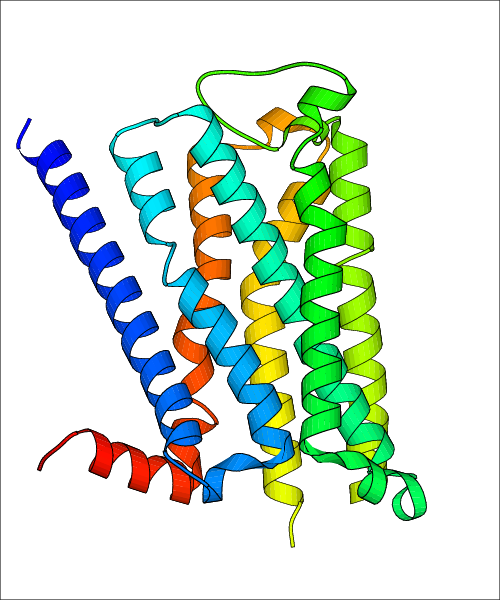 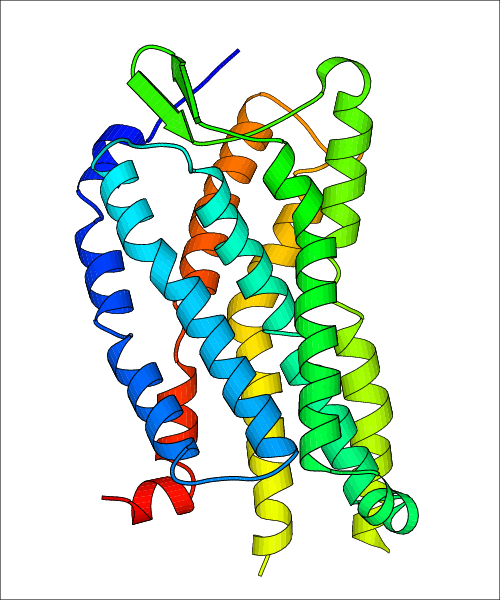 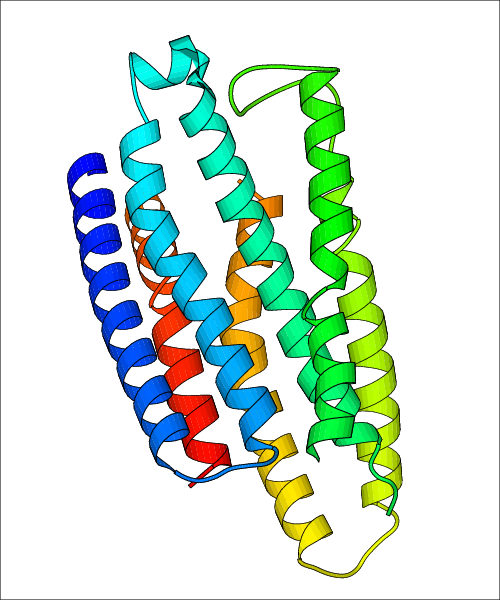 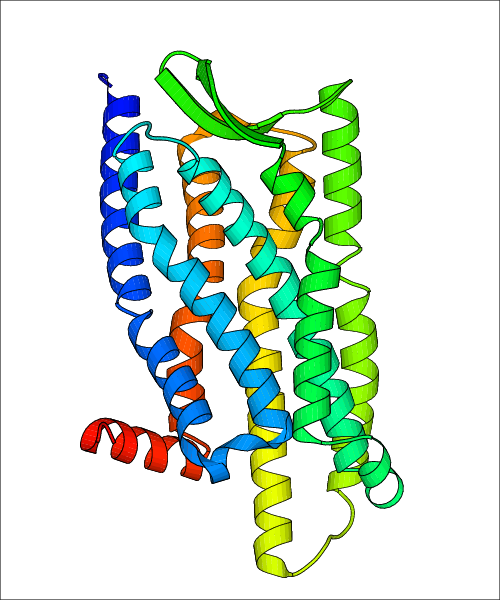 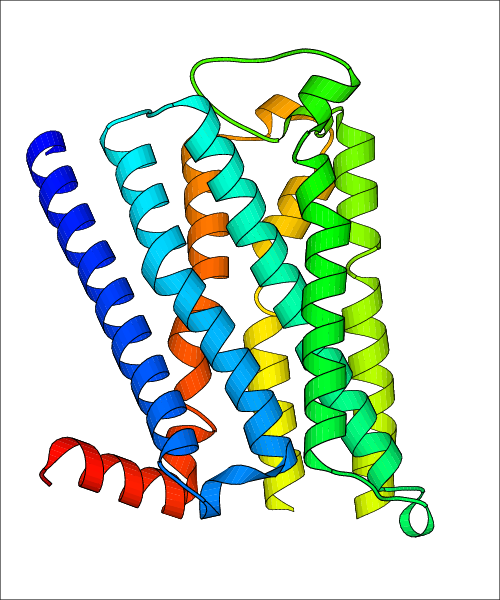 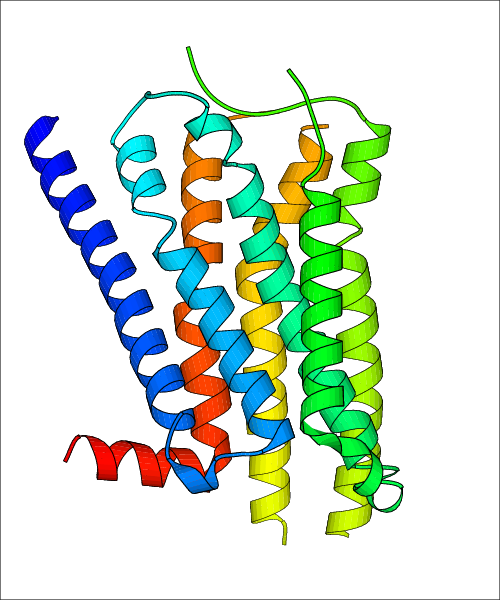 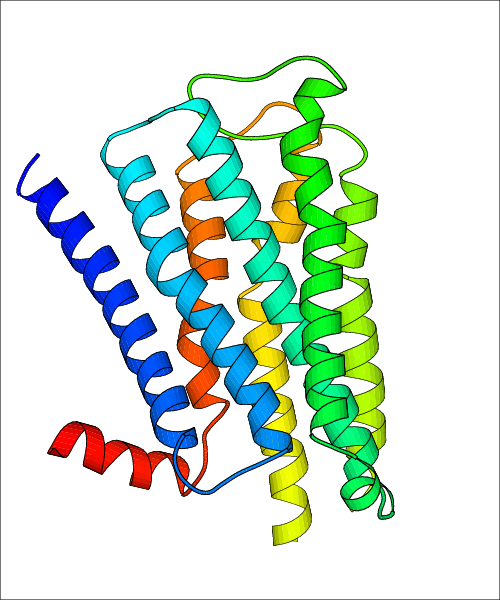 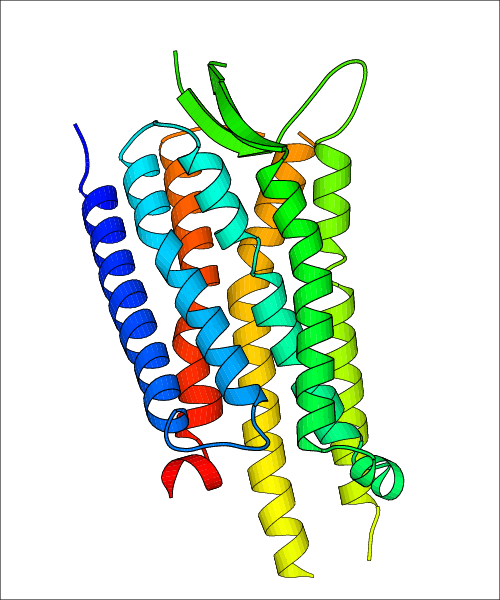 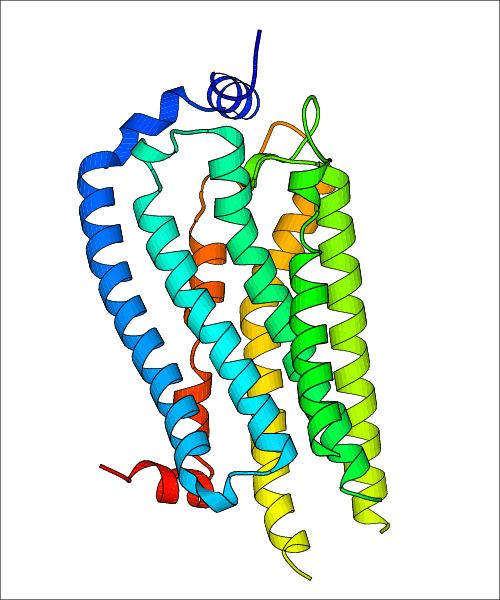 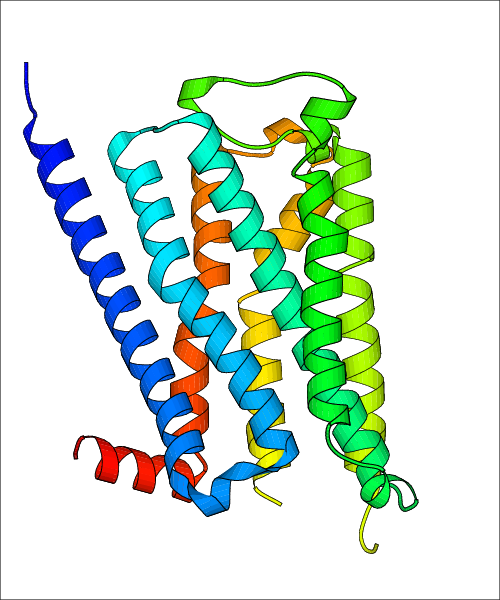 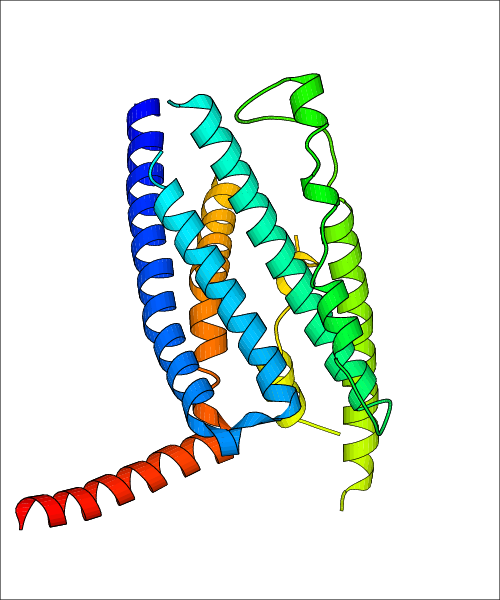 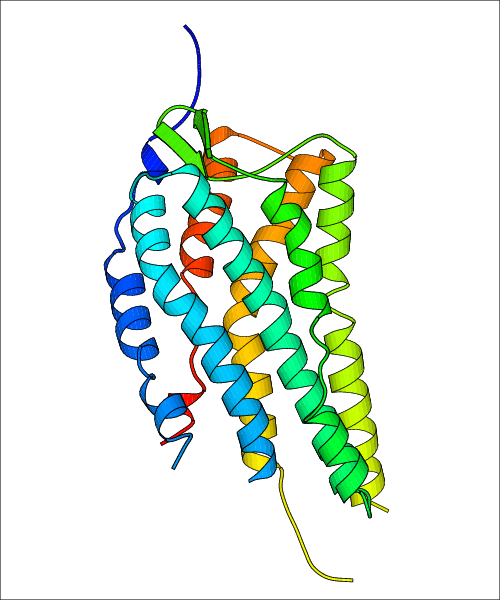 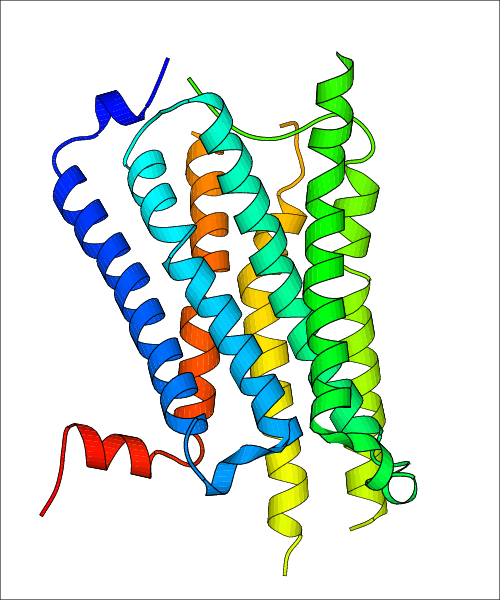 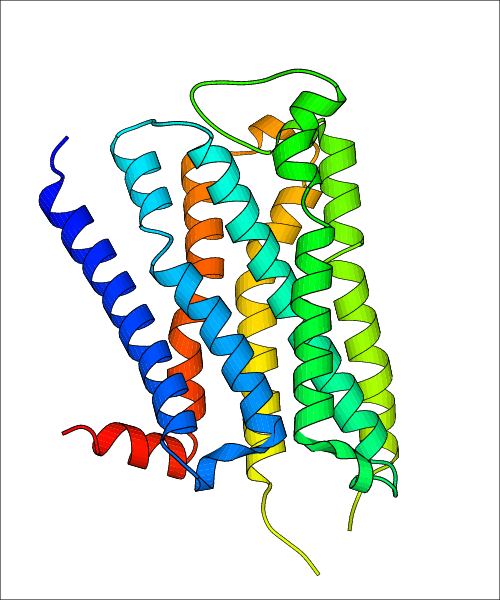 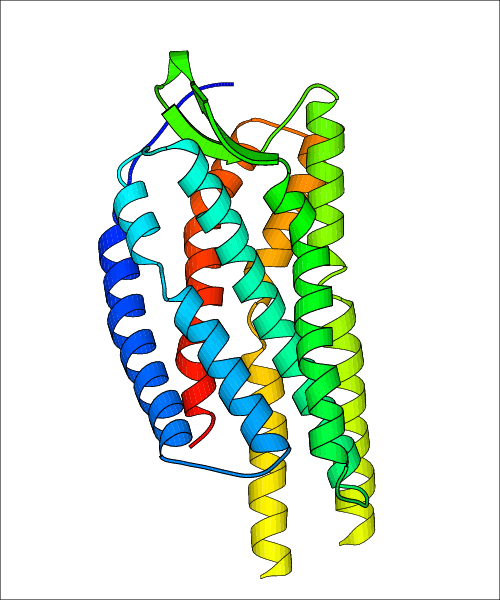 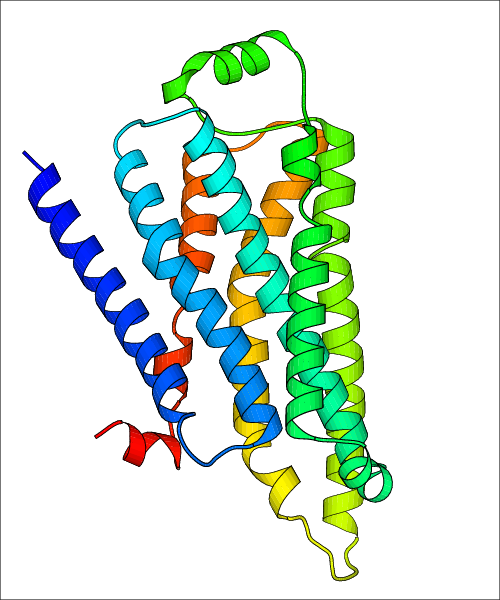 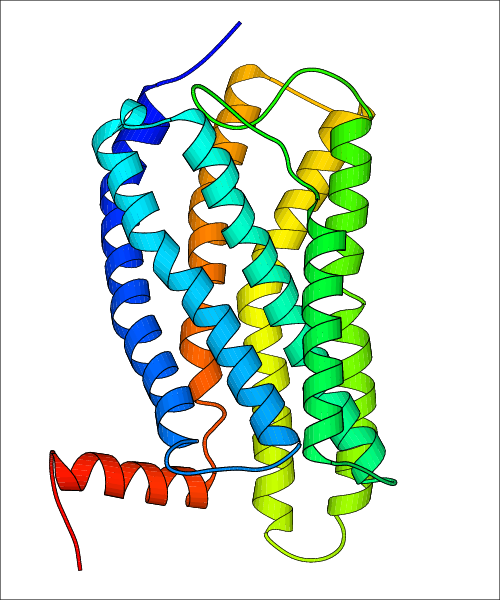 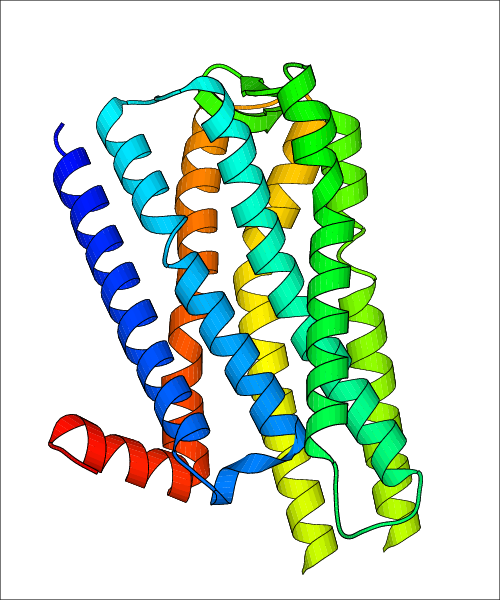 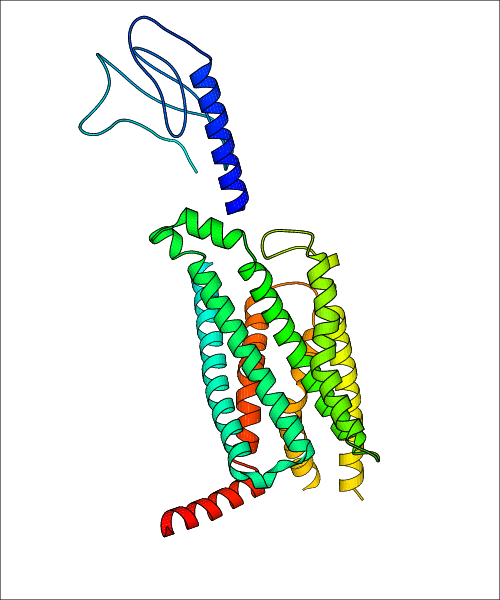 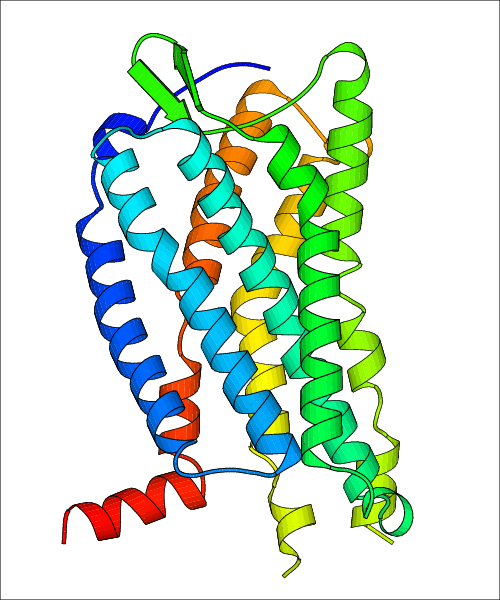 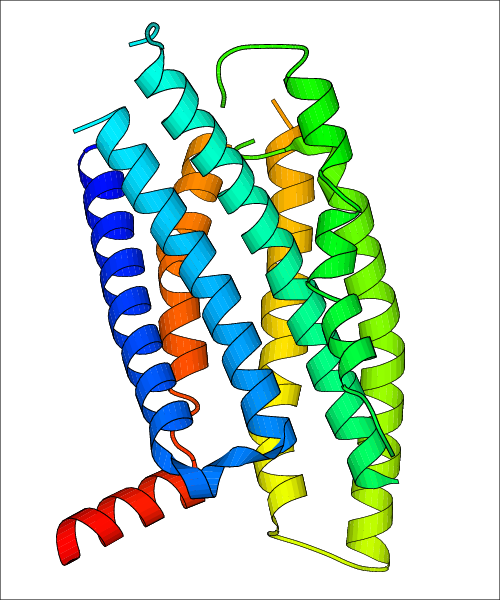 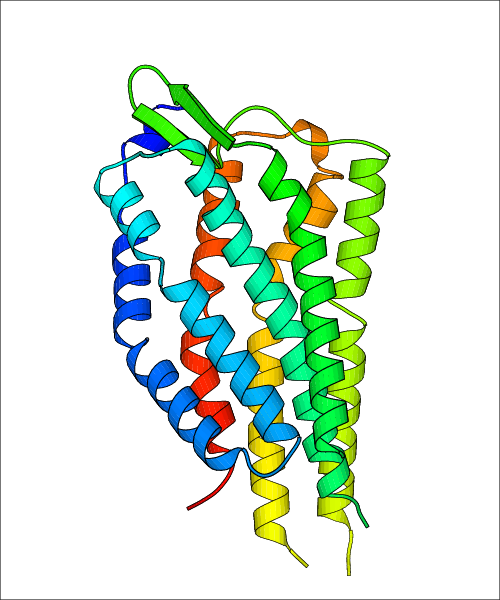 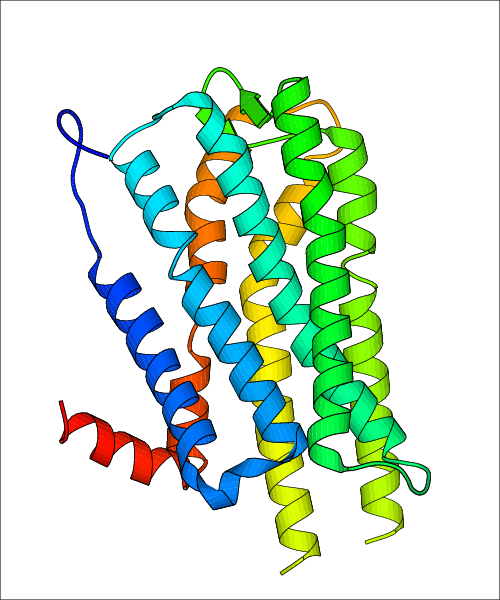 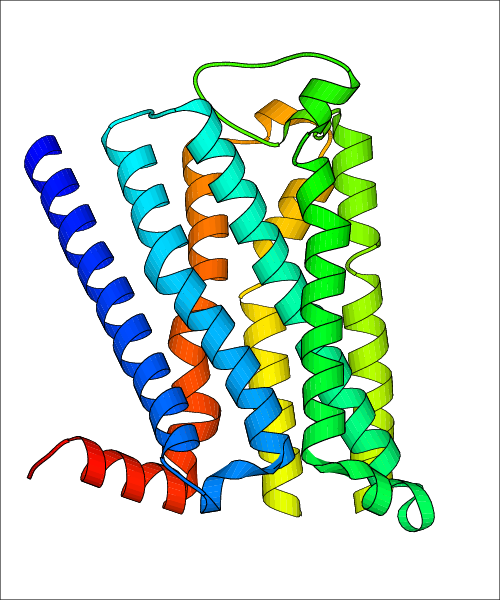 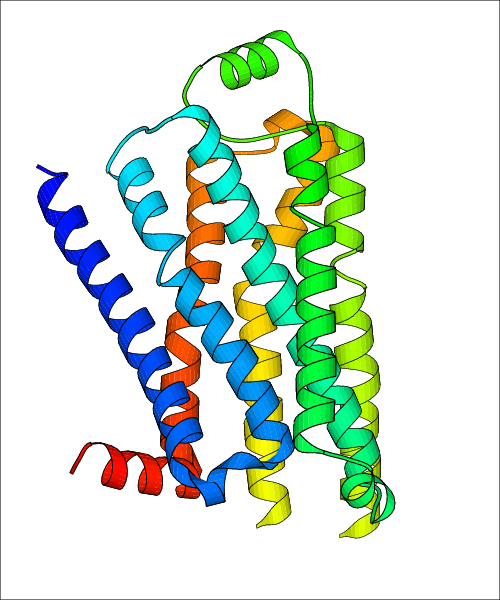 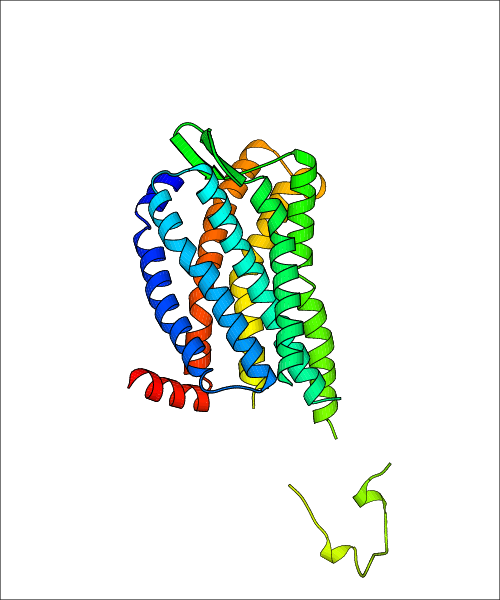 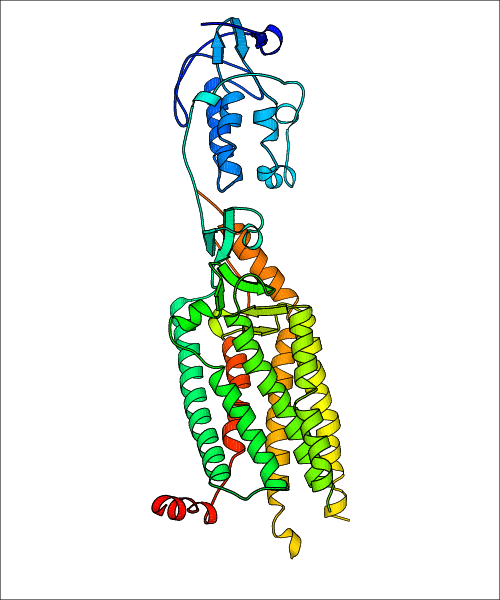 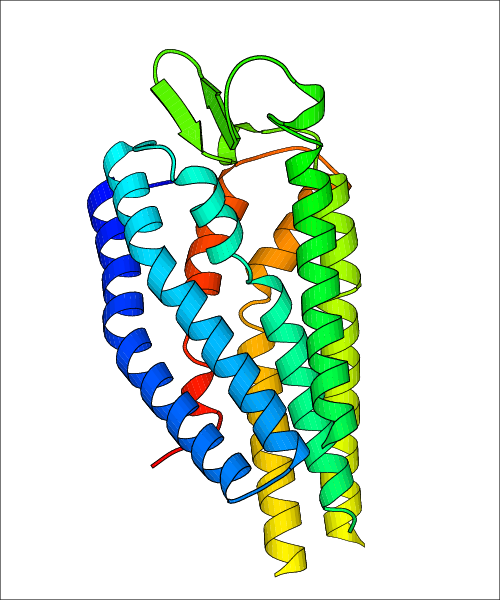 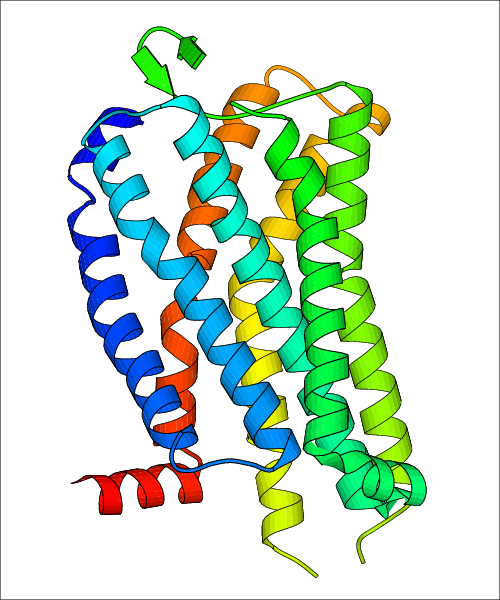 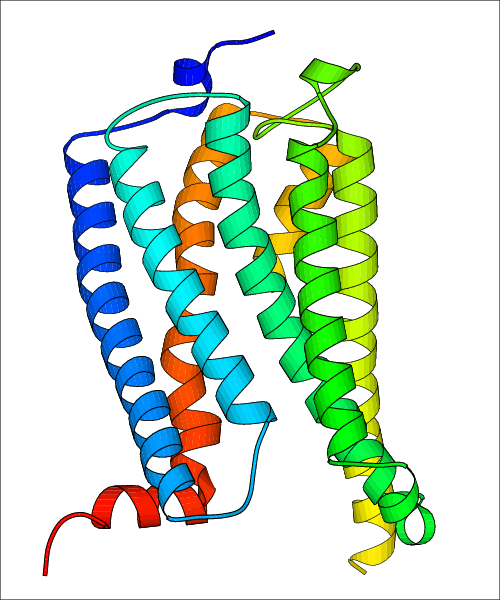 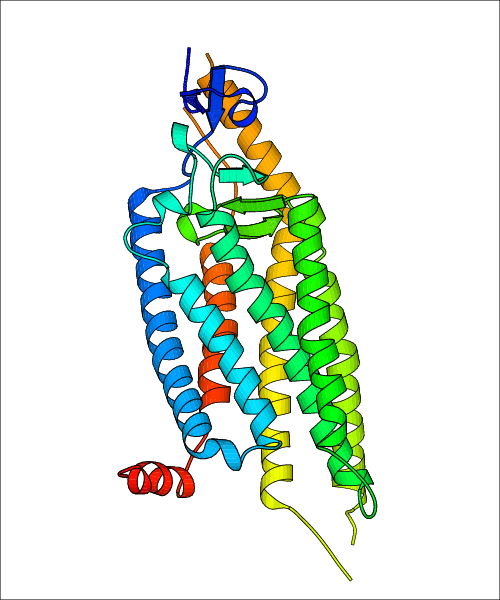 3D4S Homo sapiens (Human) (P07550) Cholesterol bound form of human beta2 adrenergic receptor. 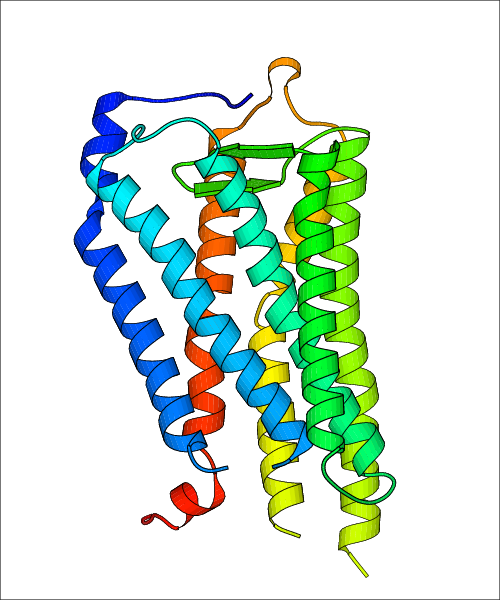 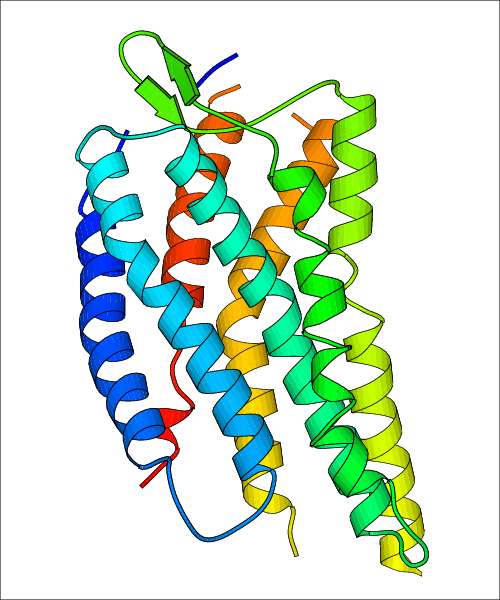 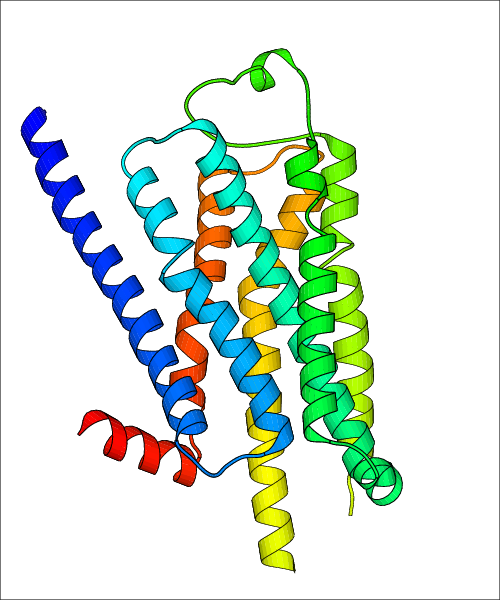 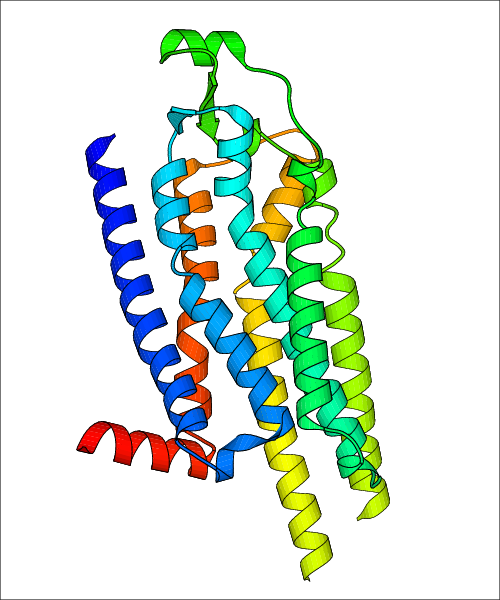 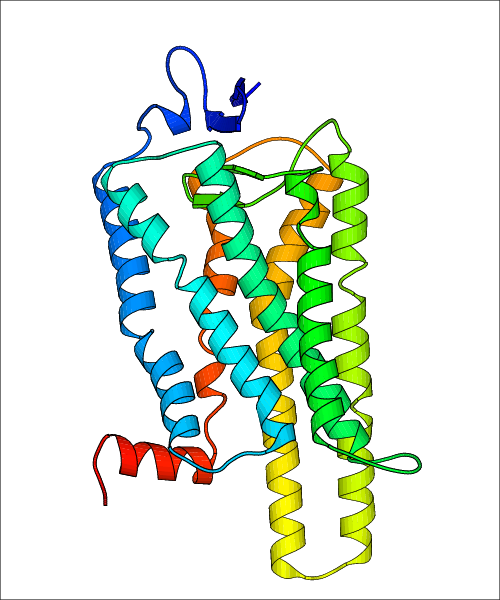 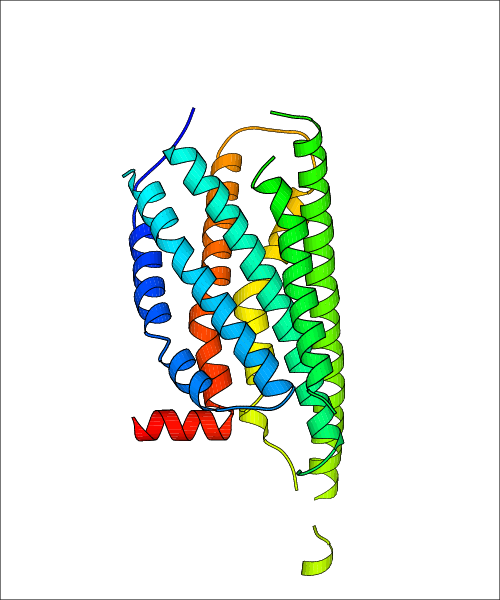 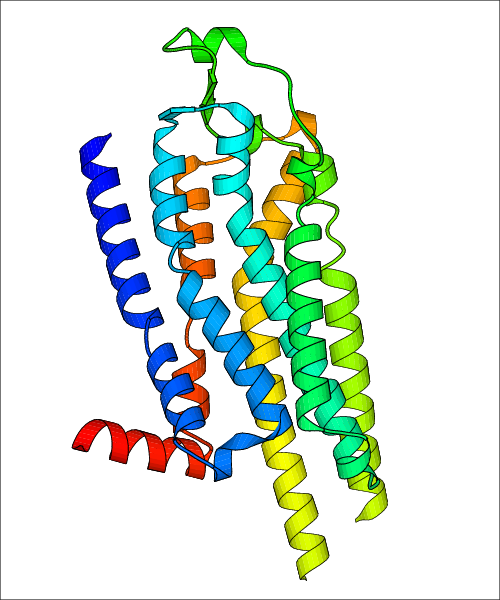 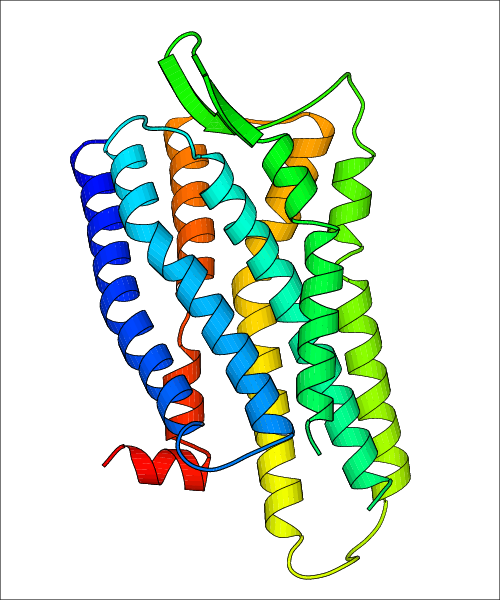 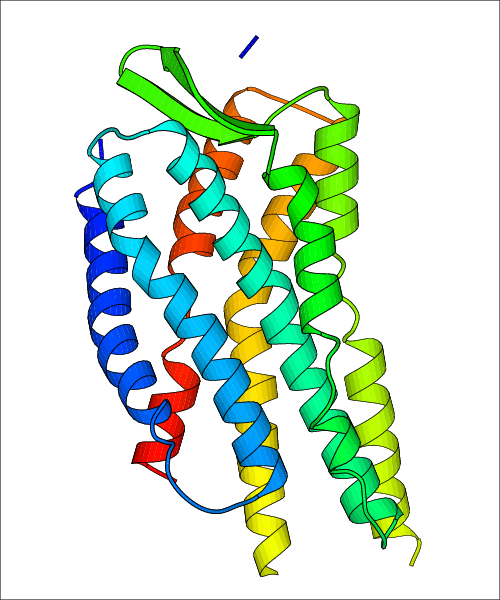 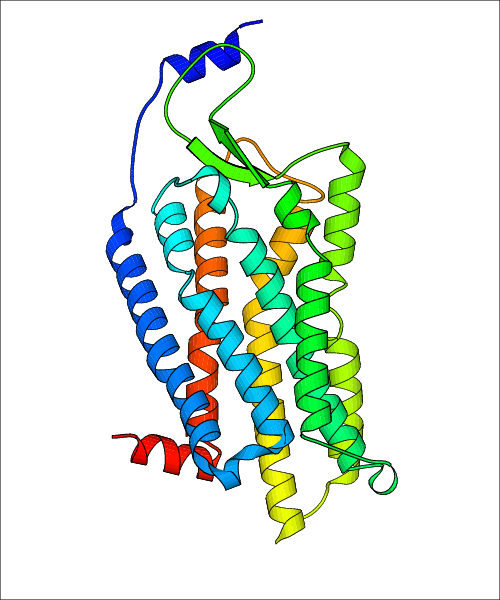 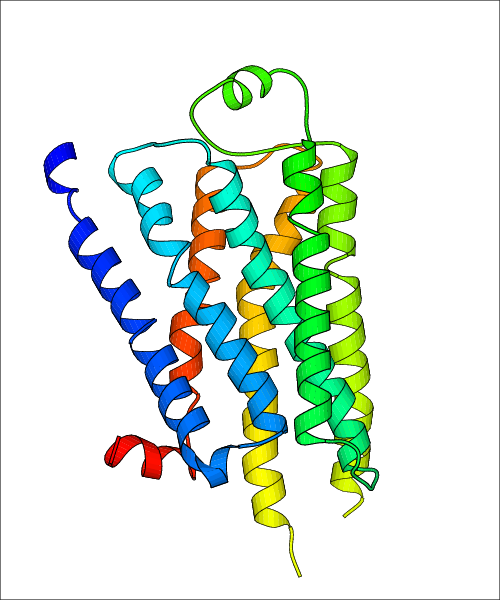 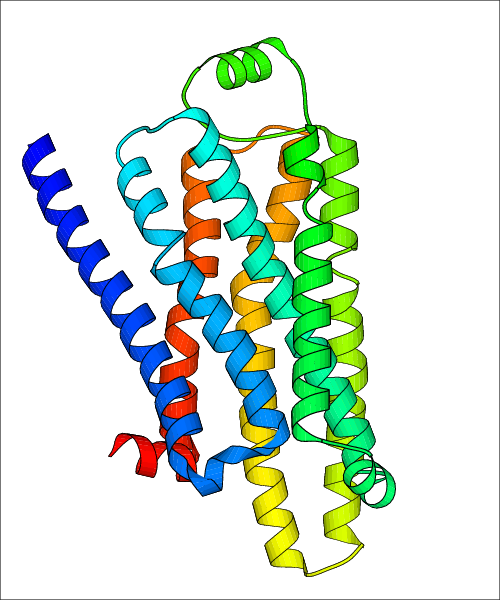 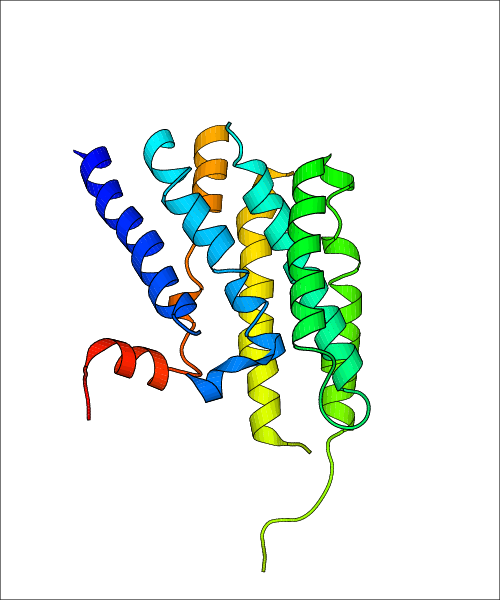 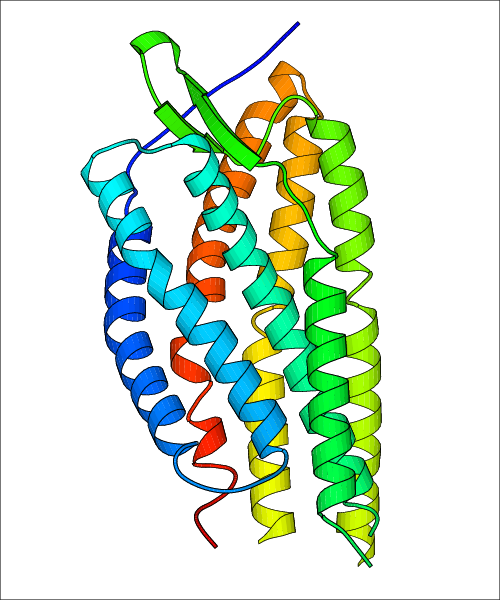 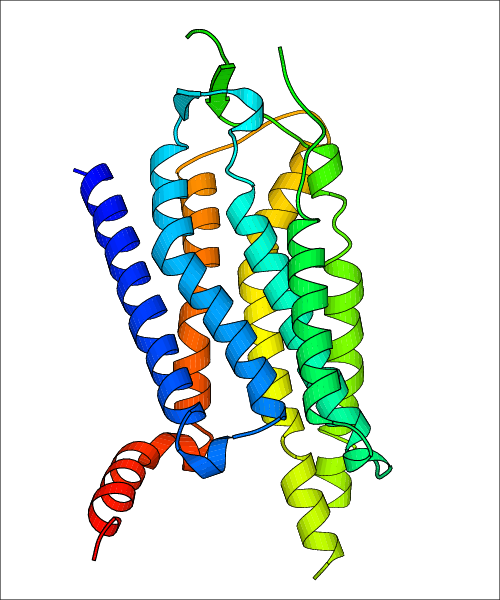 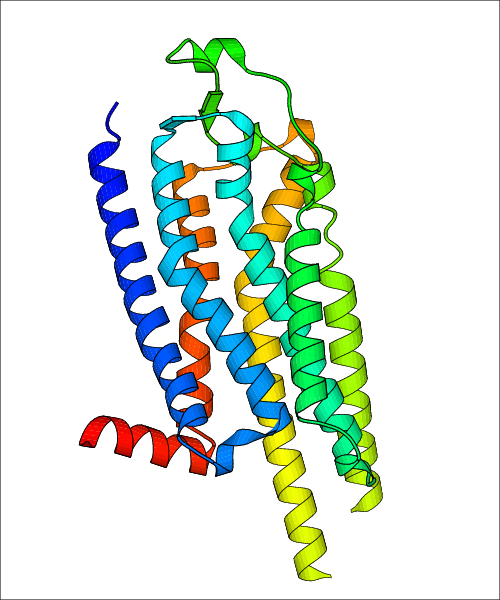 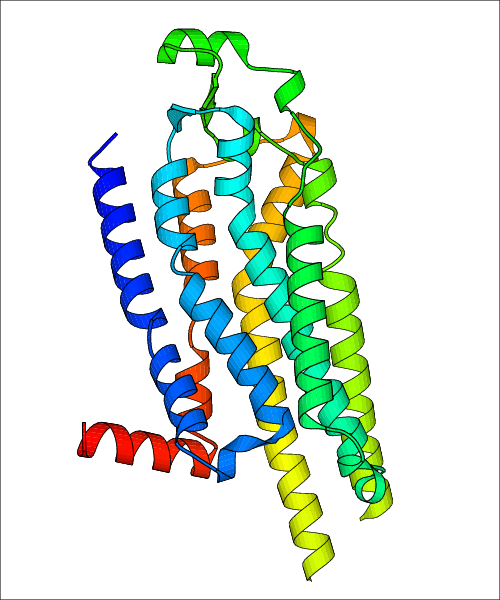 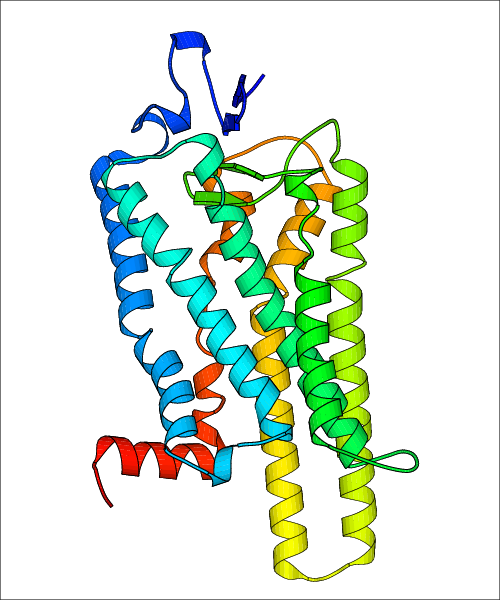 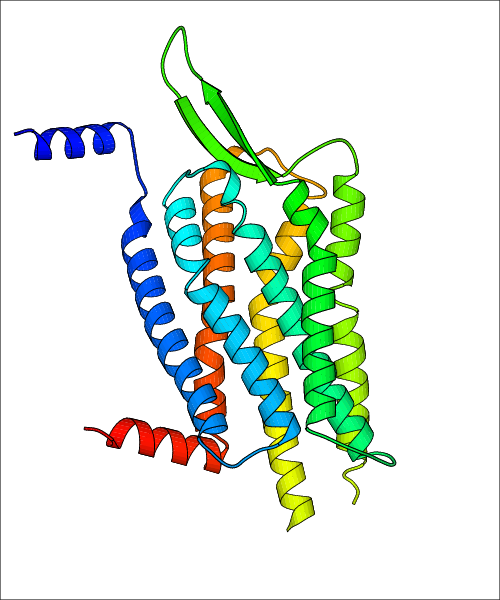 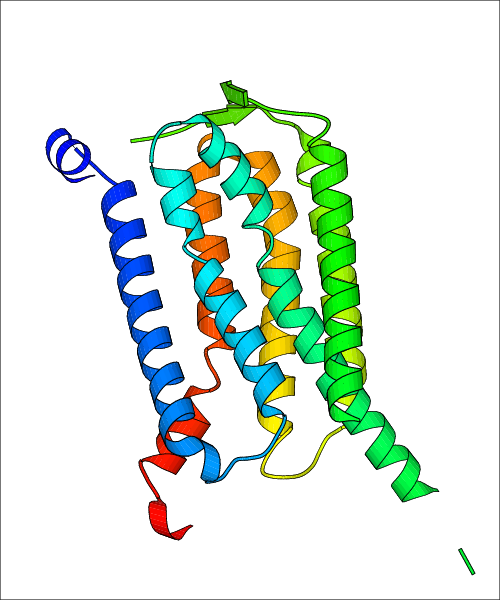 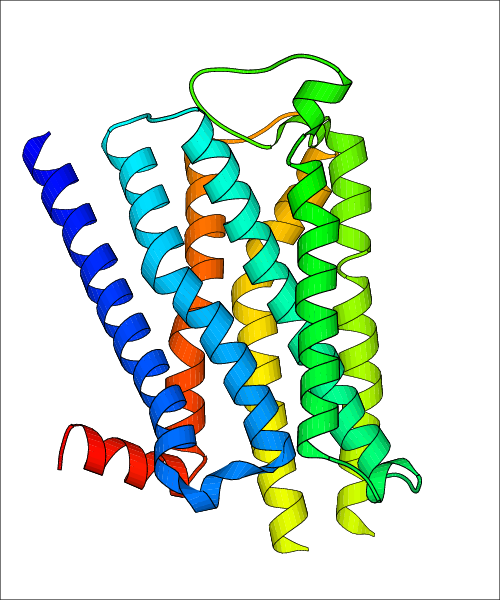 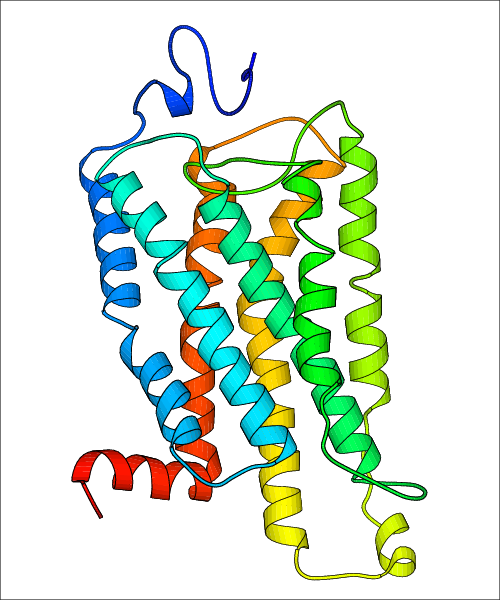 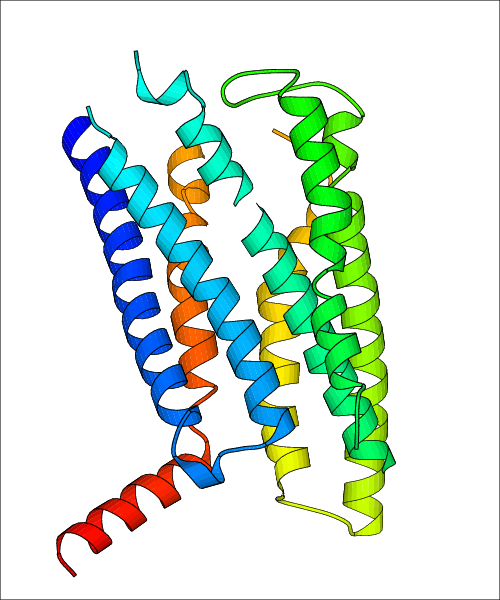 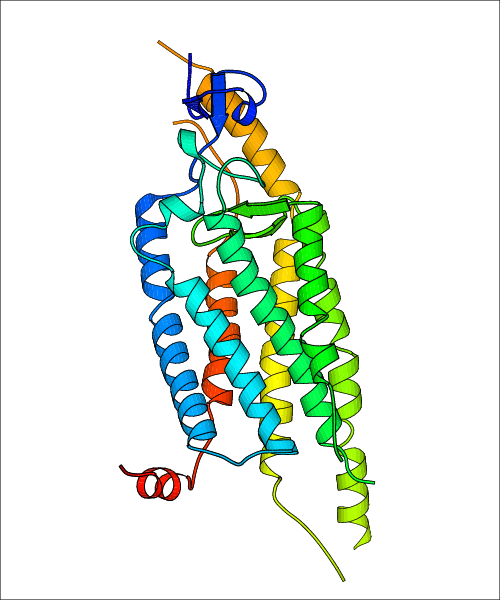 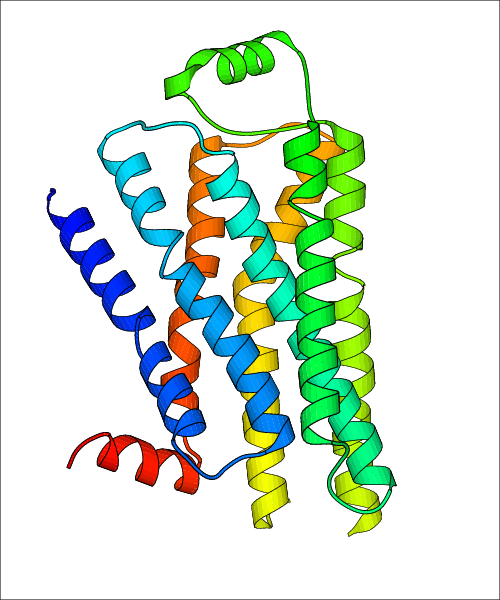 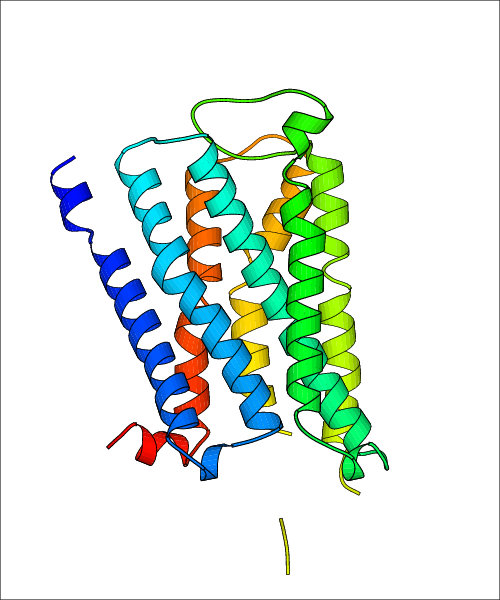 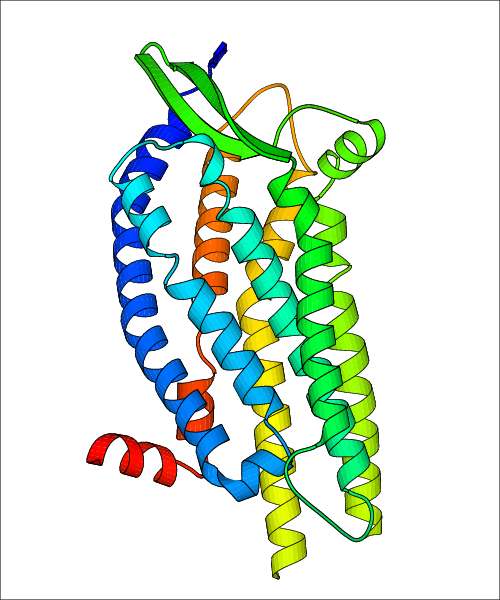 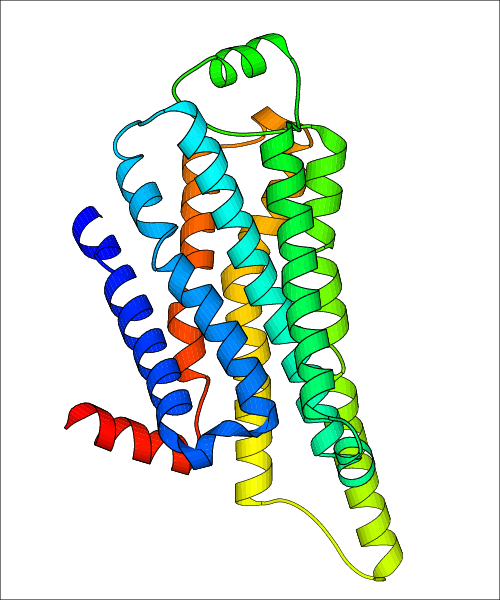 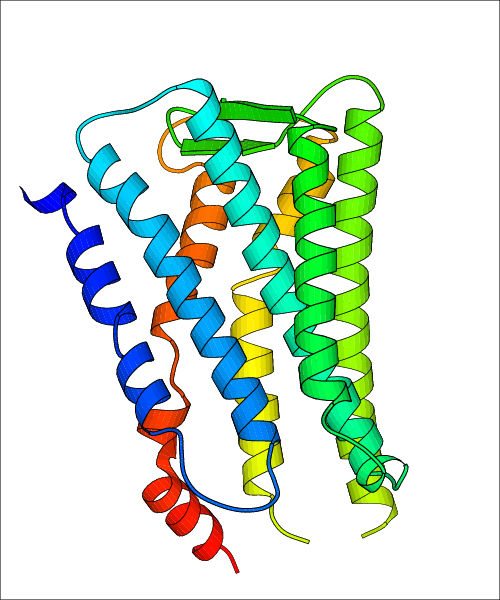 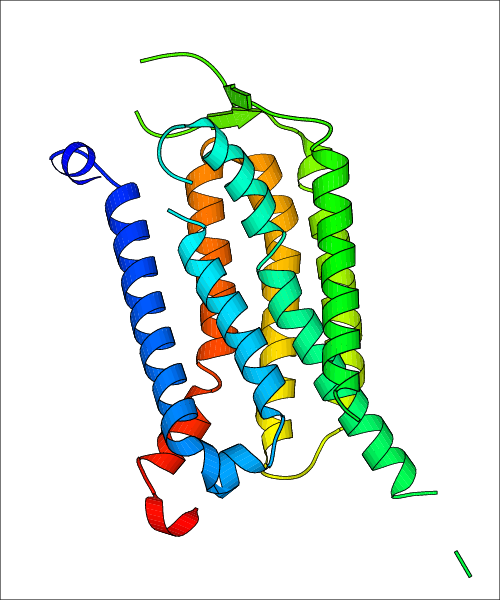 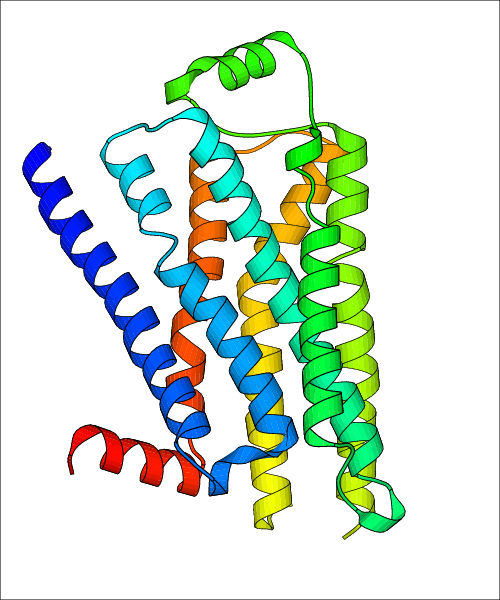 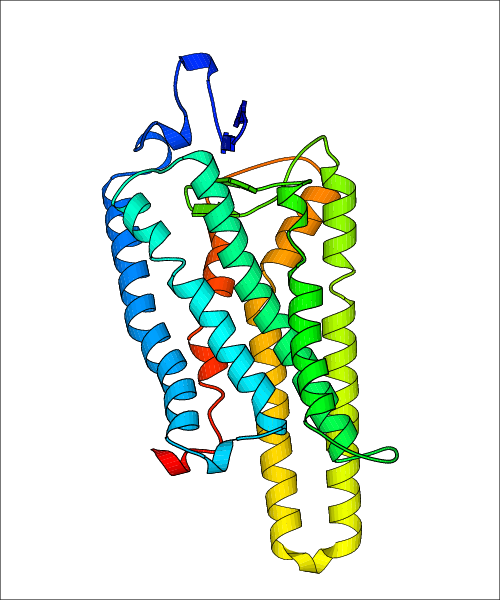 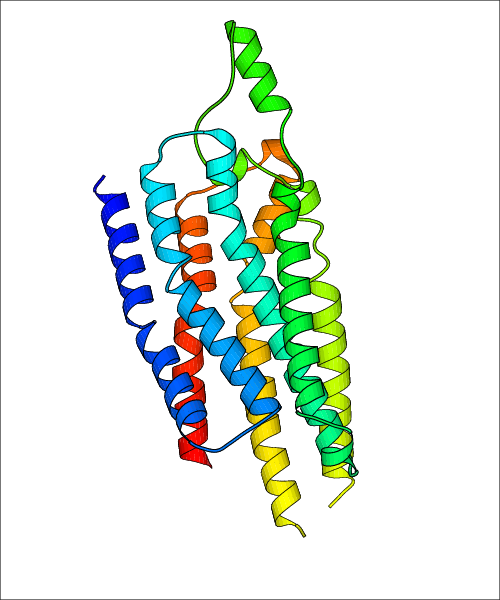 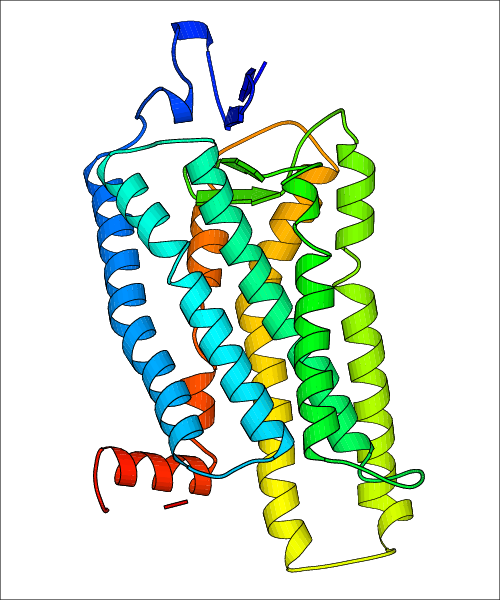 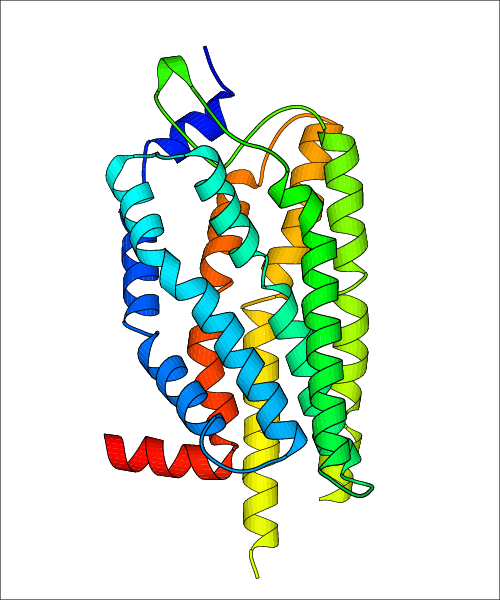 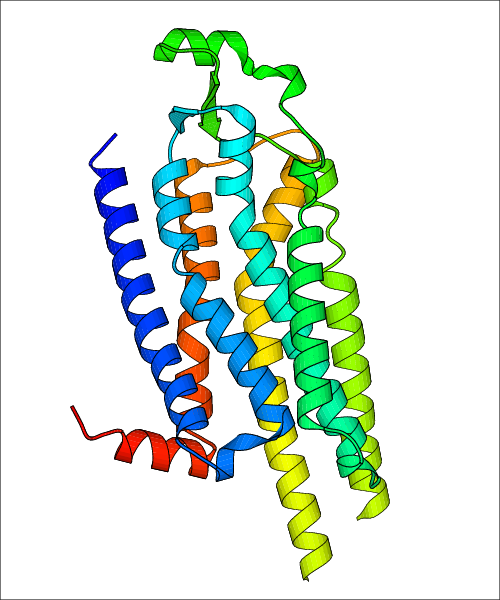 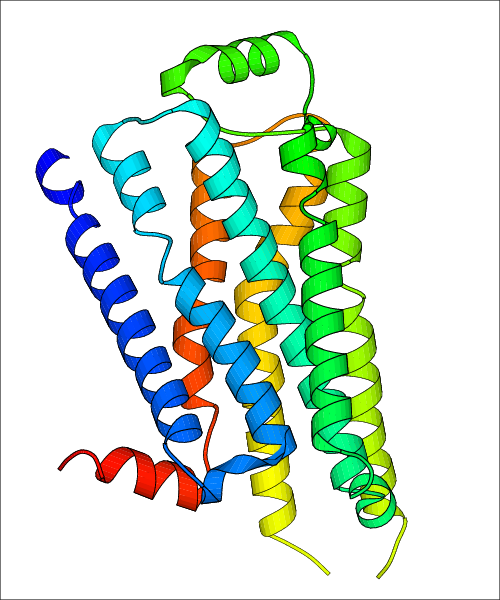 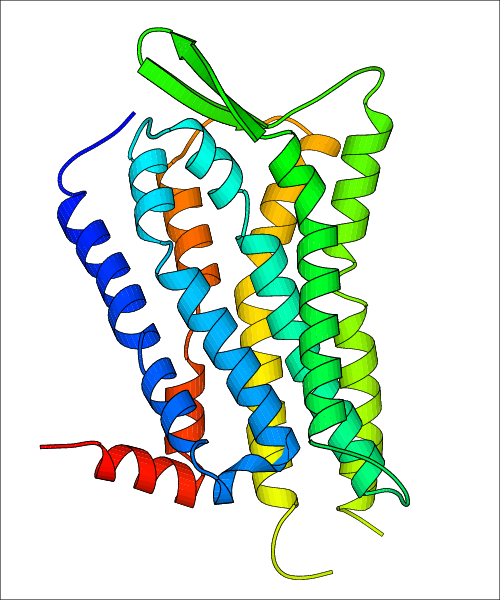 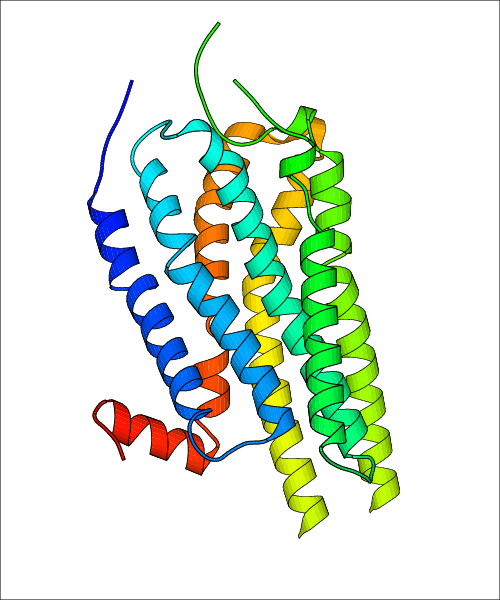 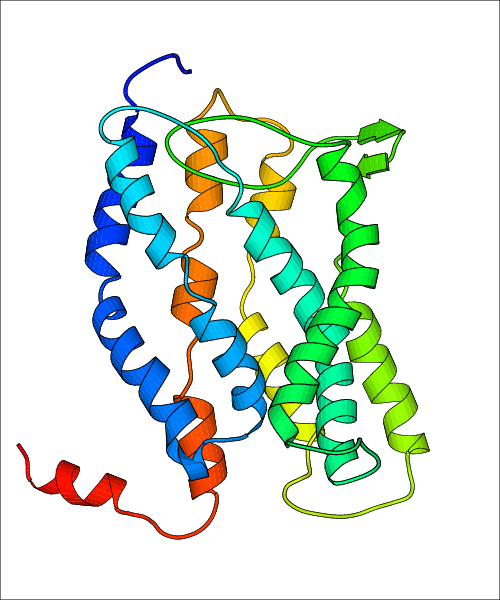 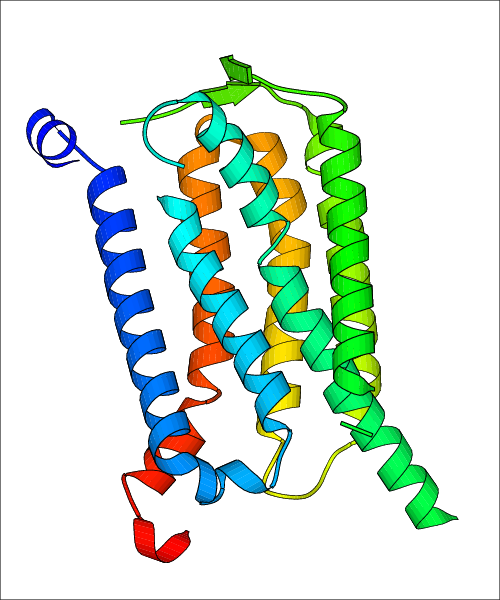 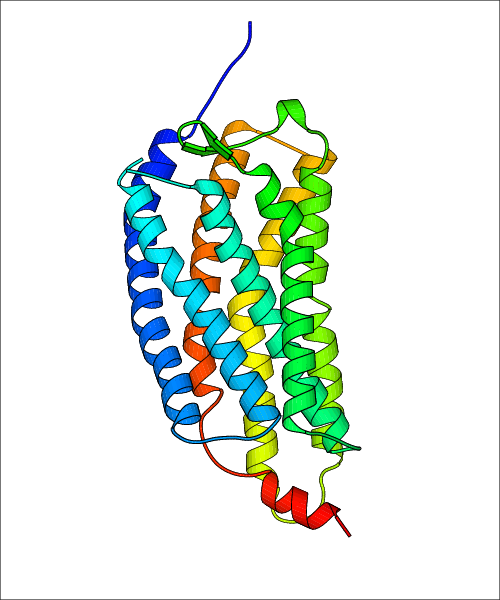 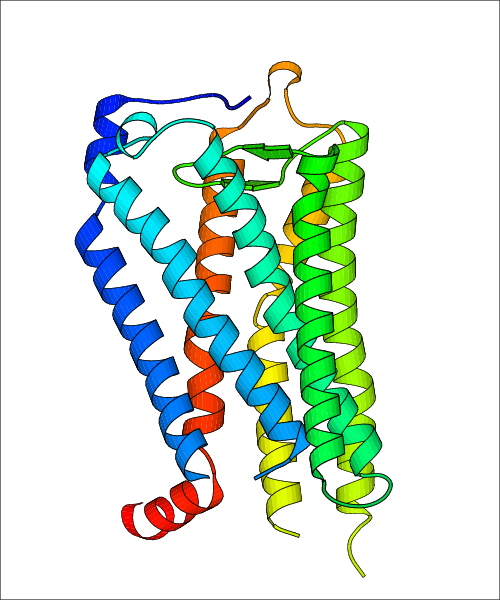 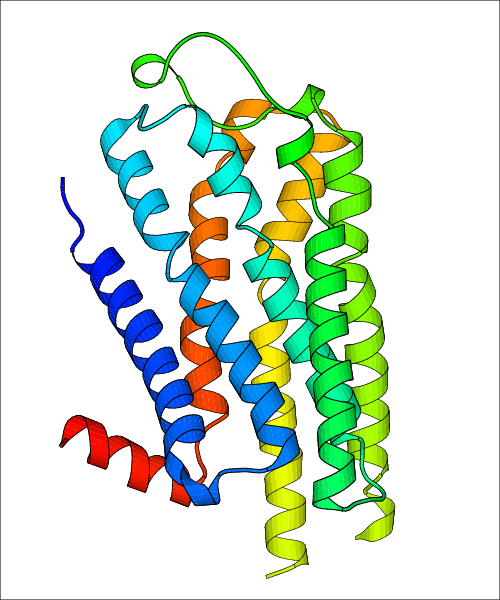 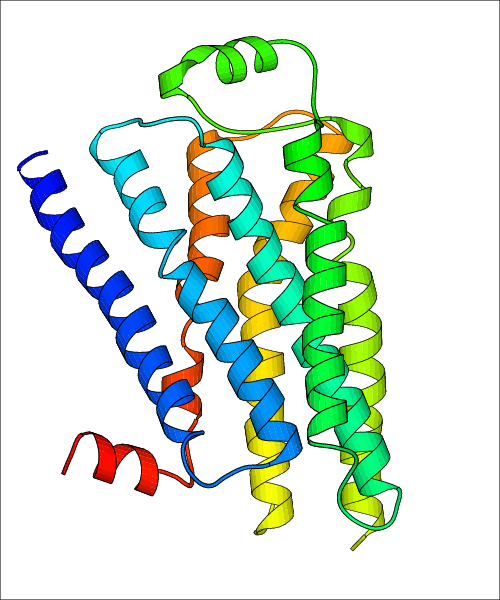 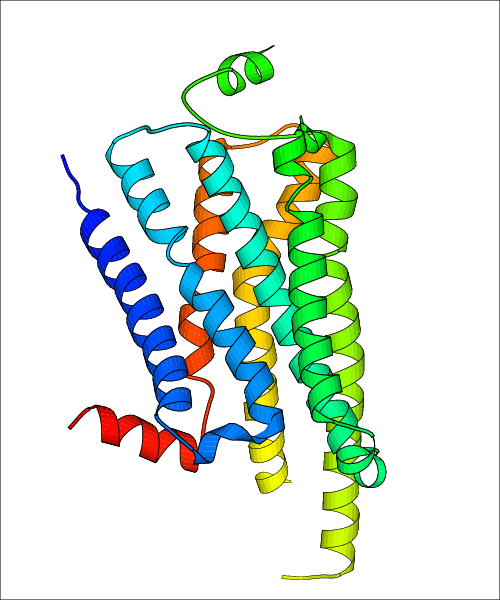 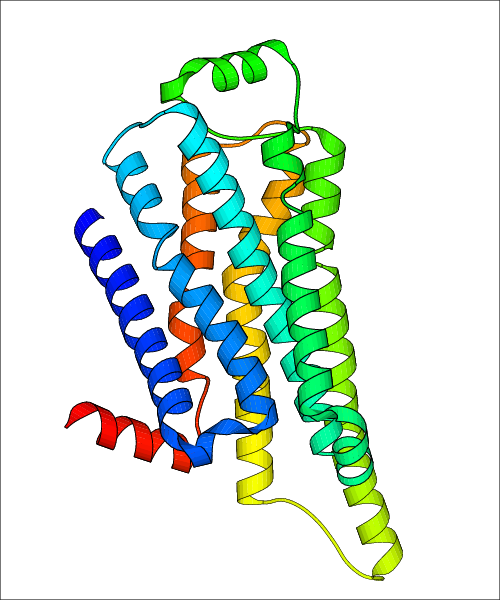 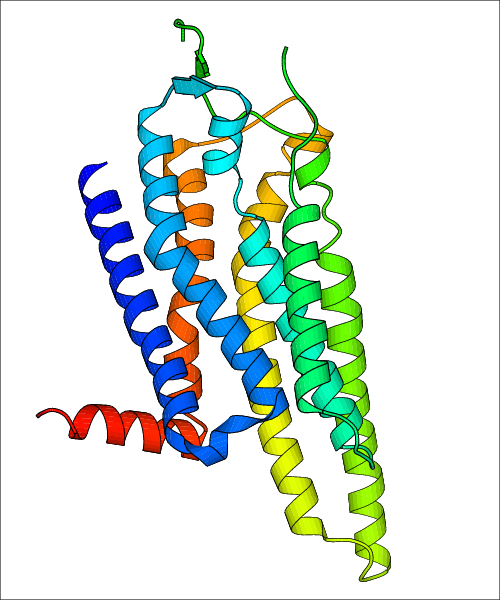 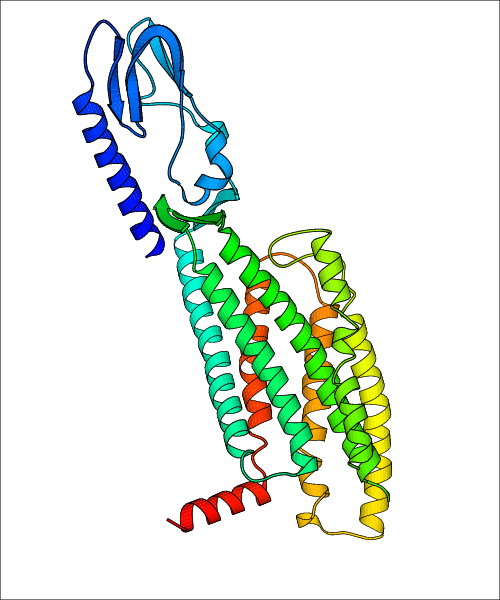 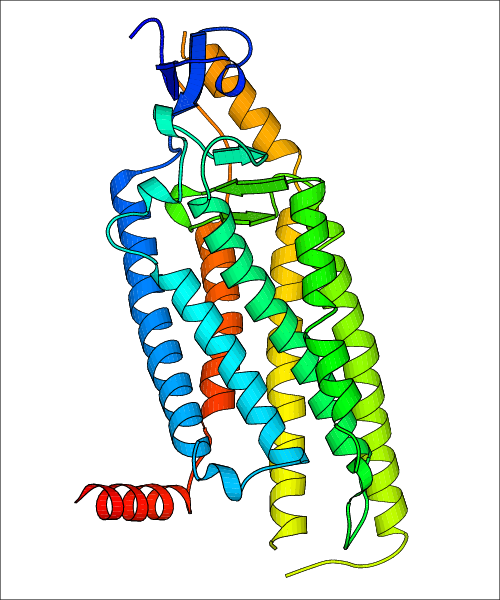 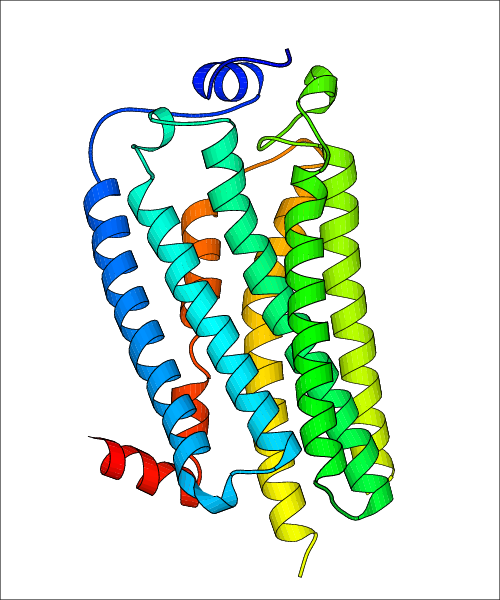 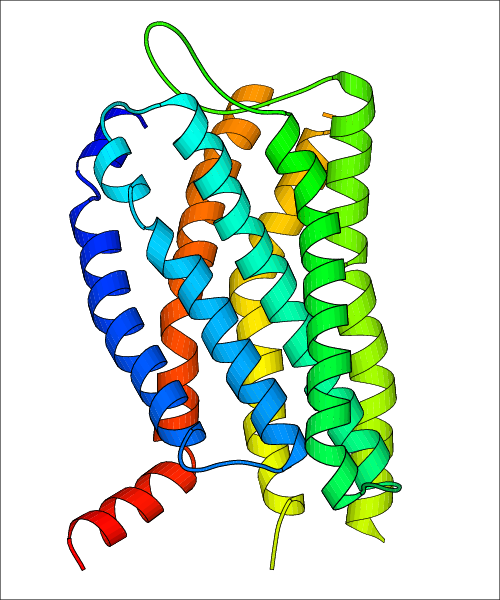 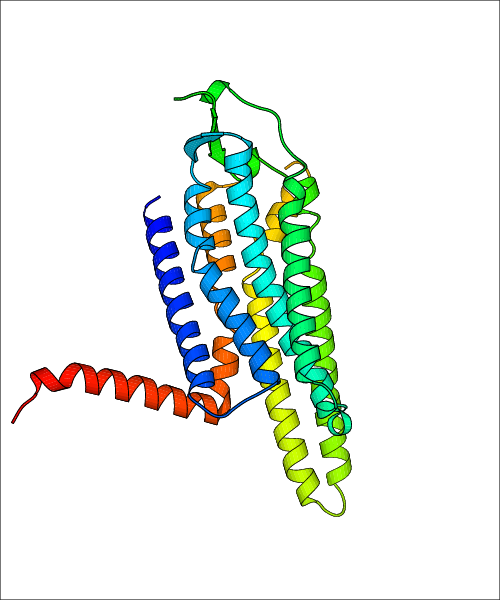 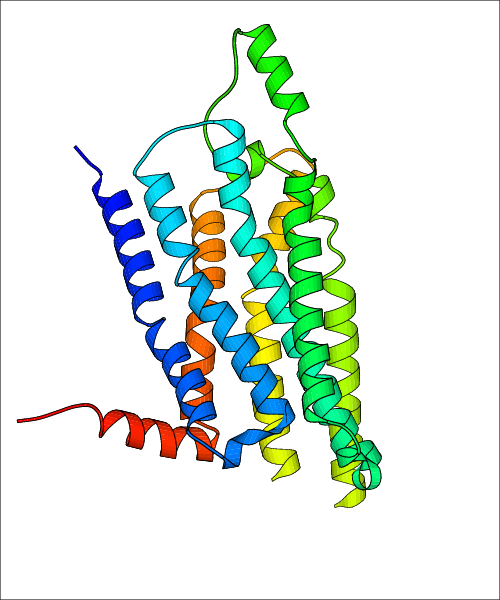 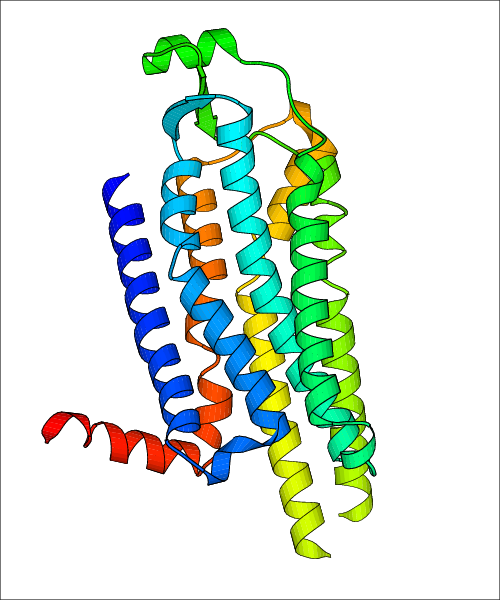 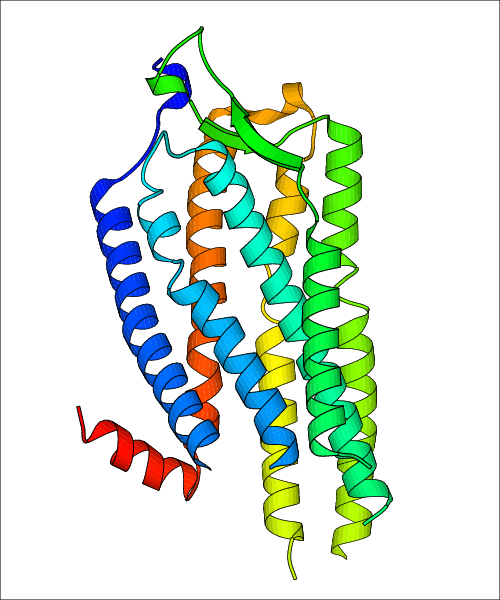 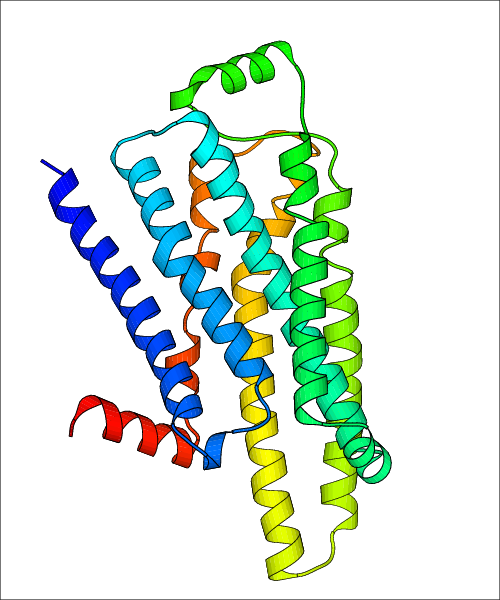 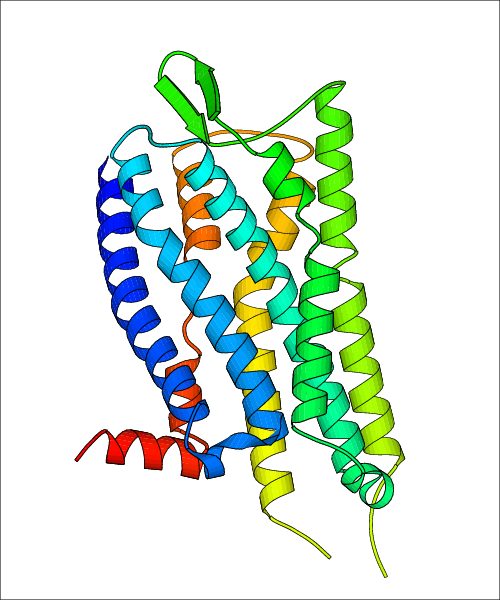 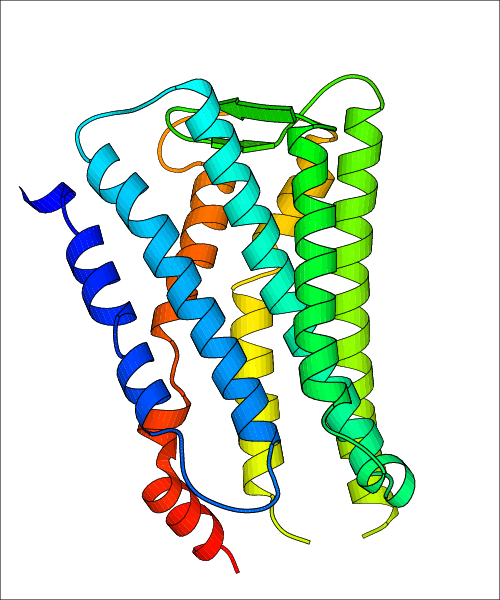 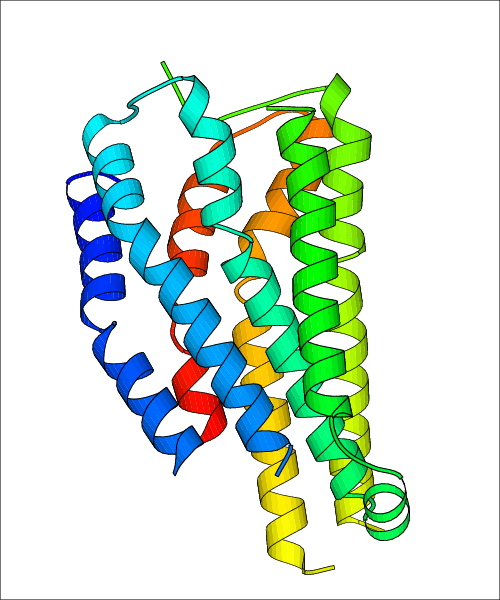 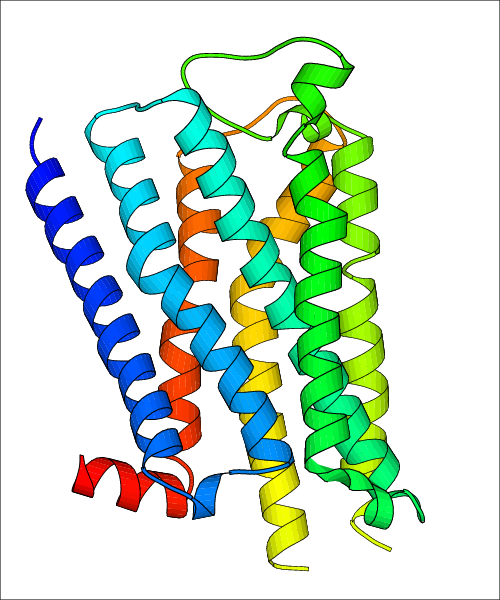 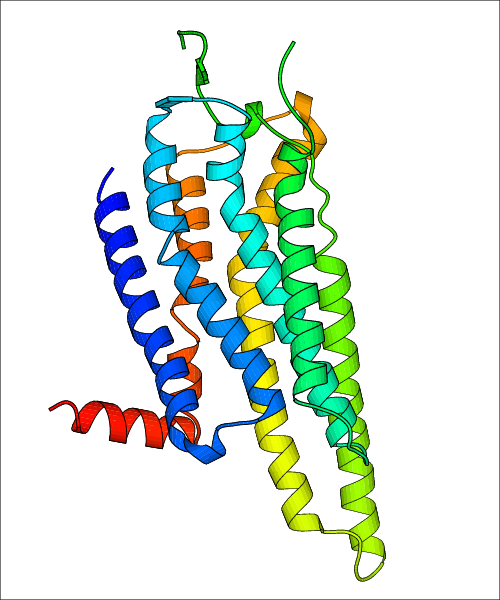 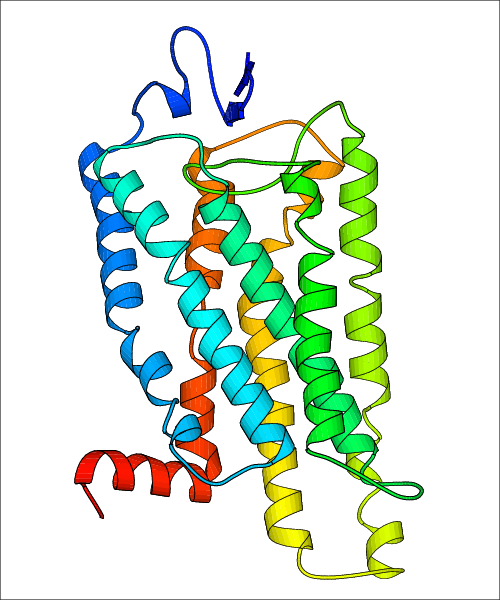 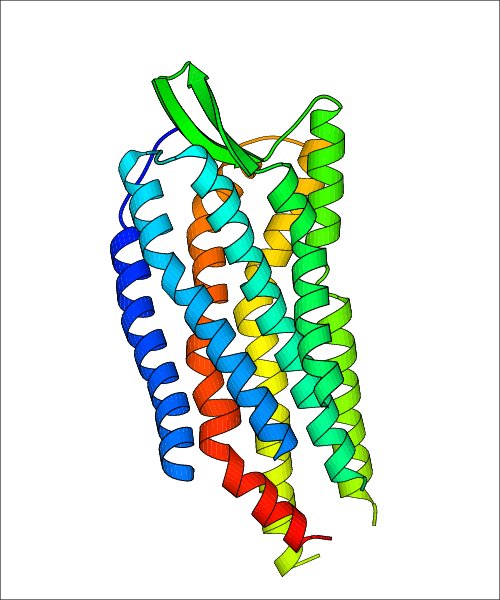 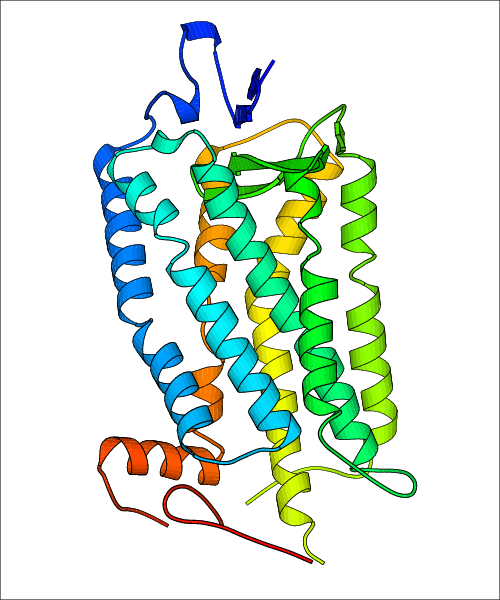 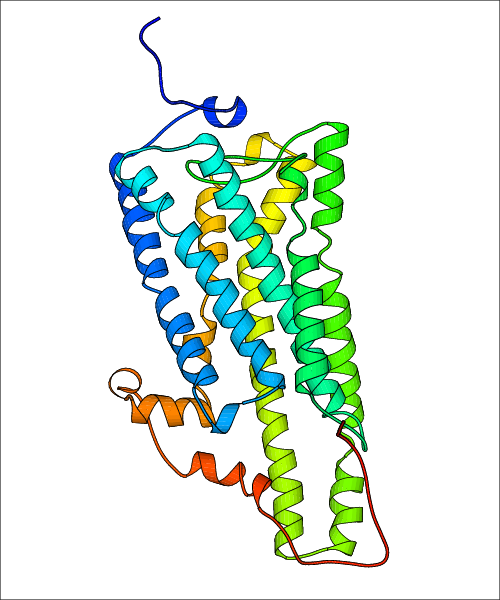 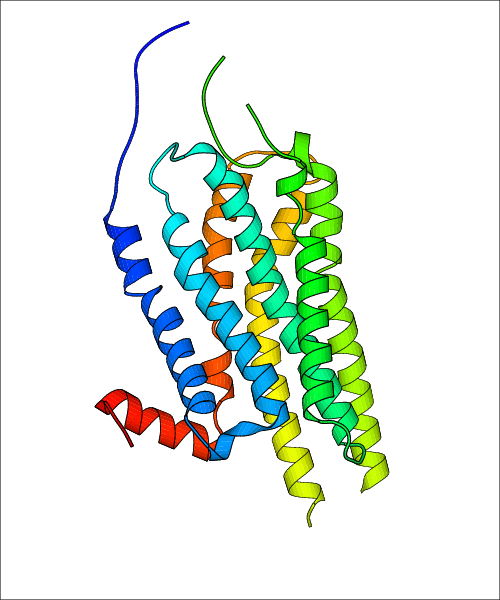 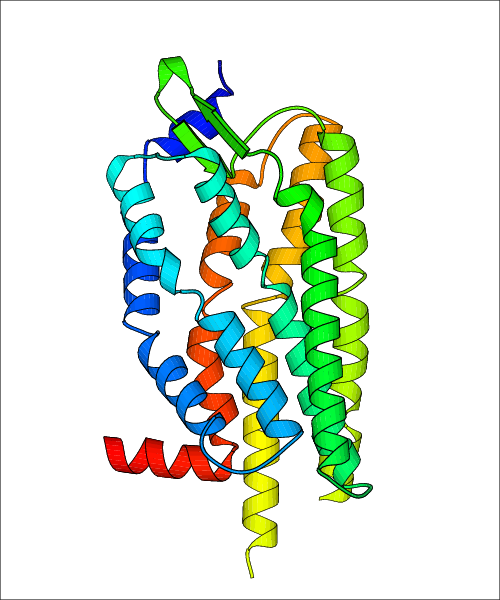 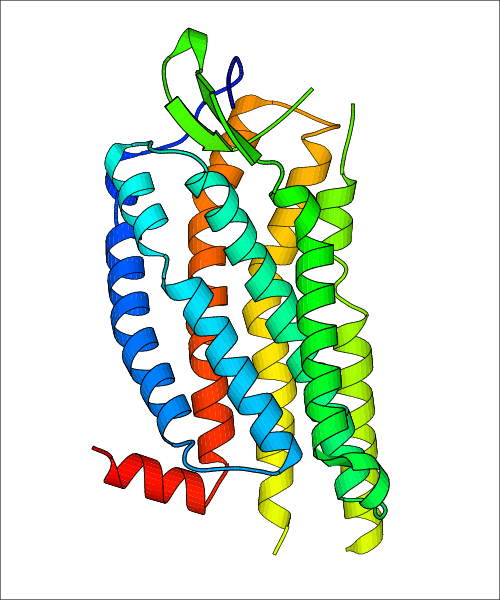 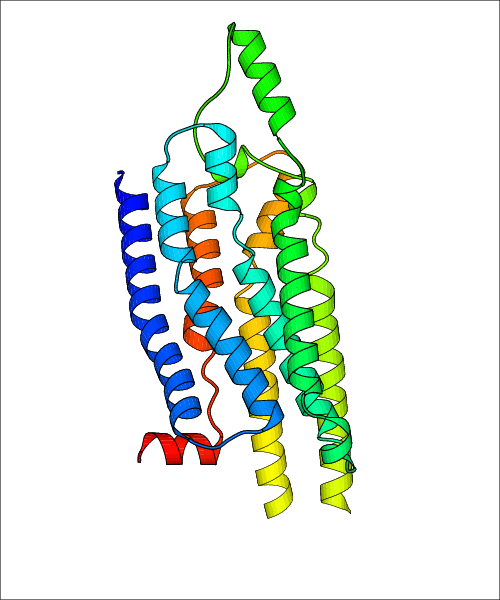 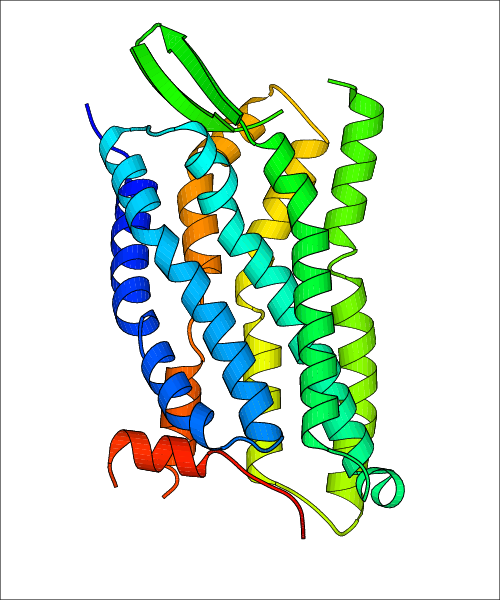 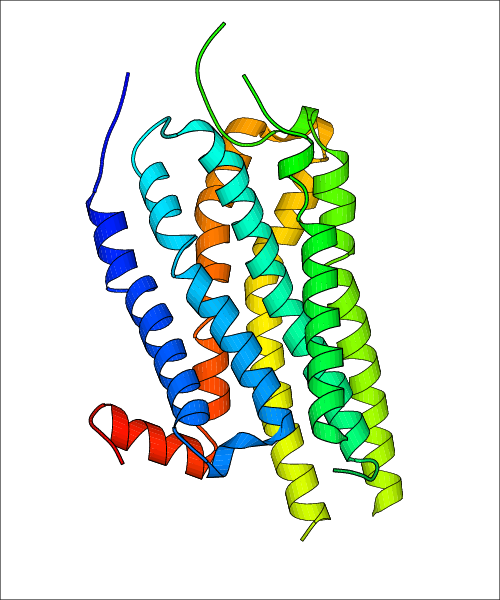 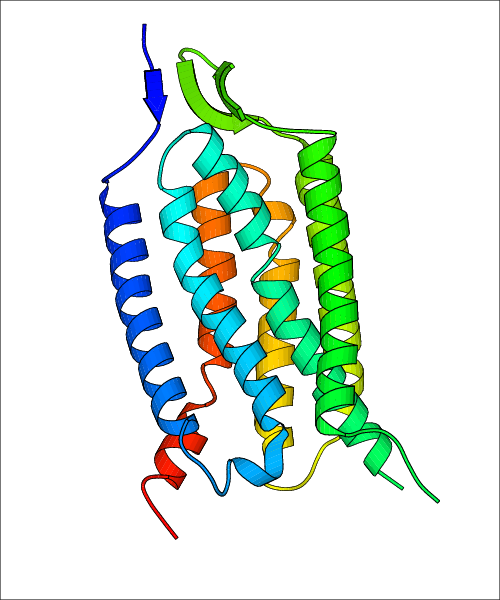 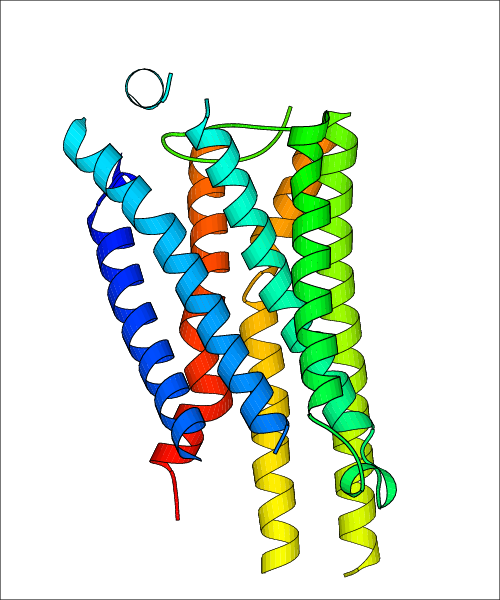 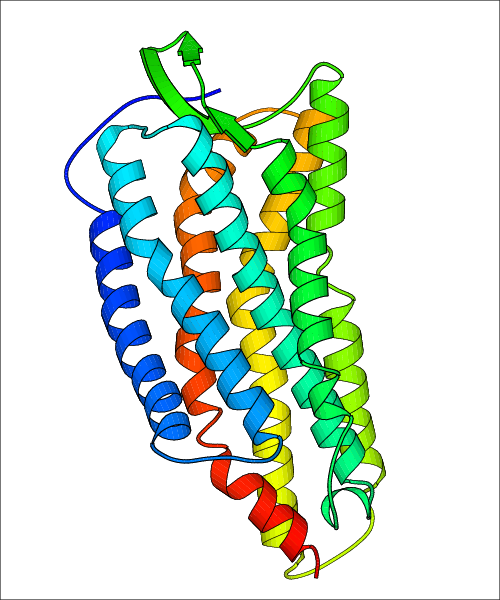 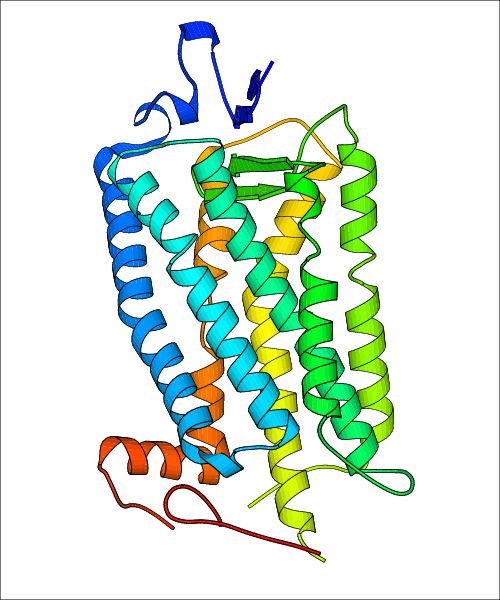 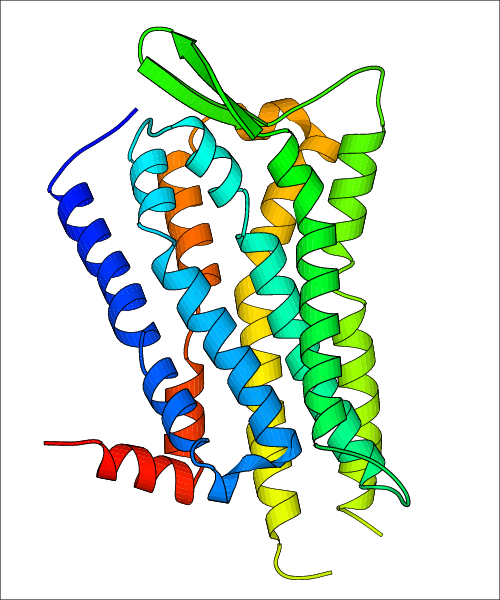 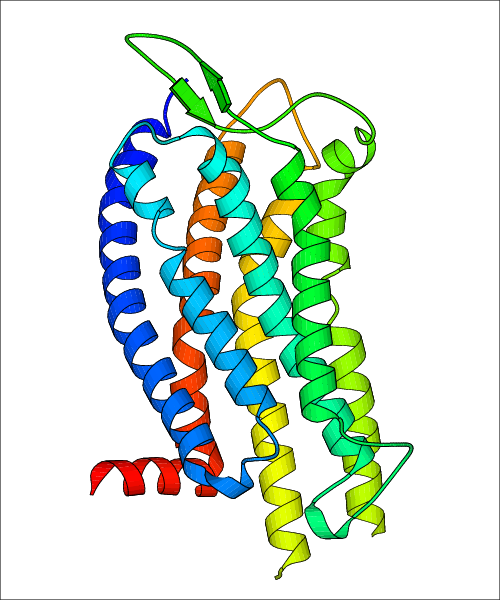 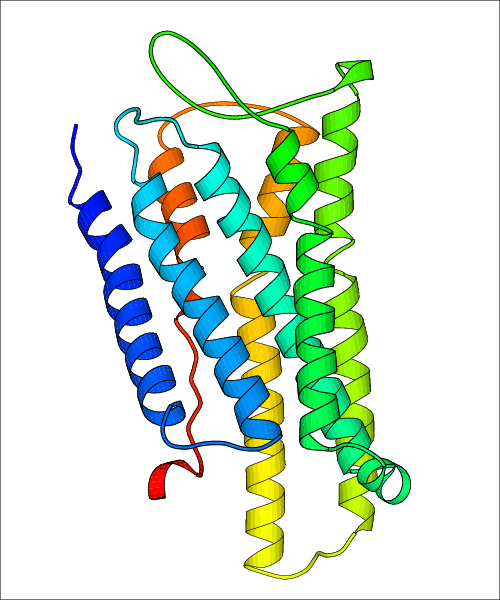 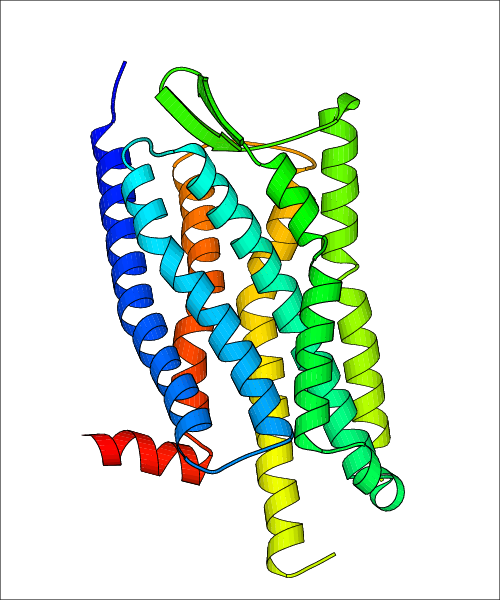 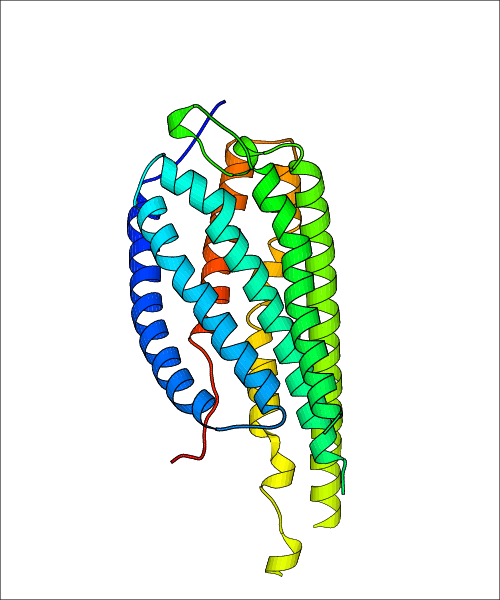 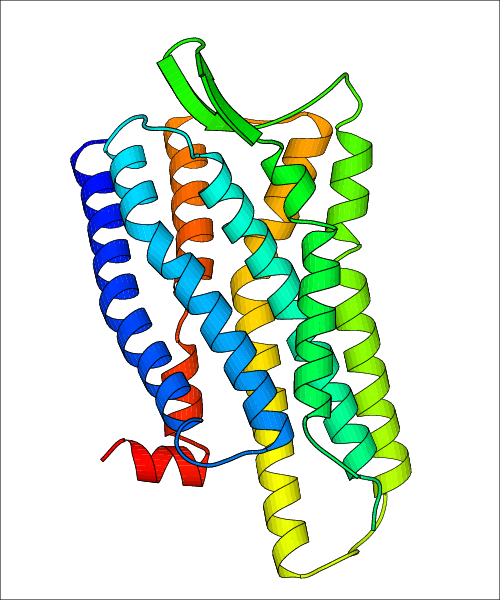 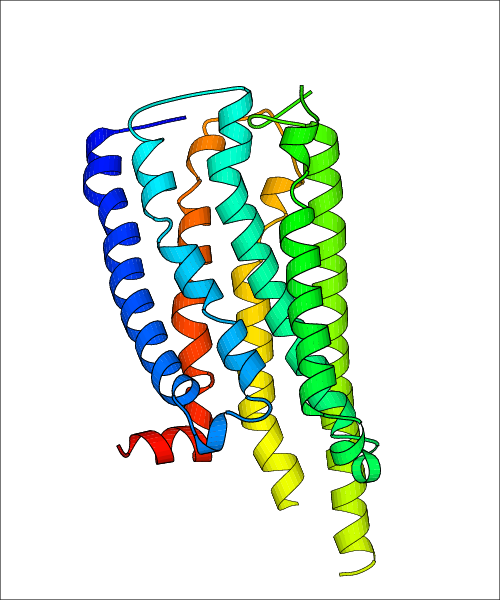 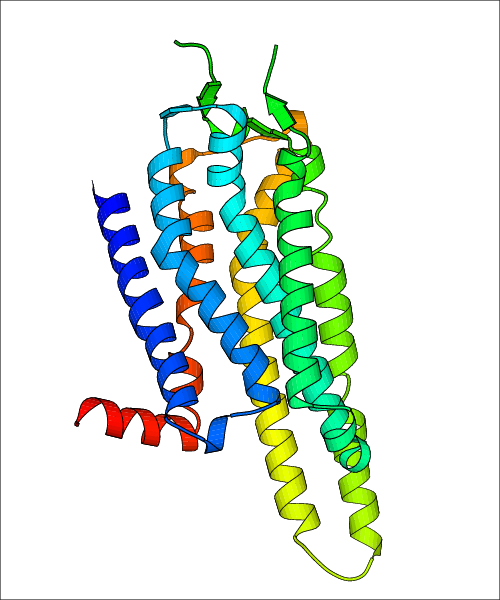 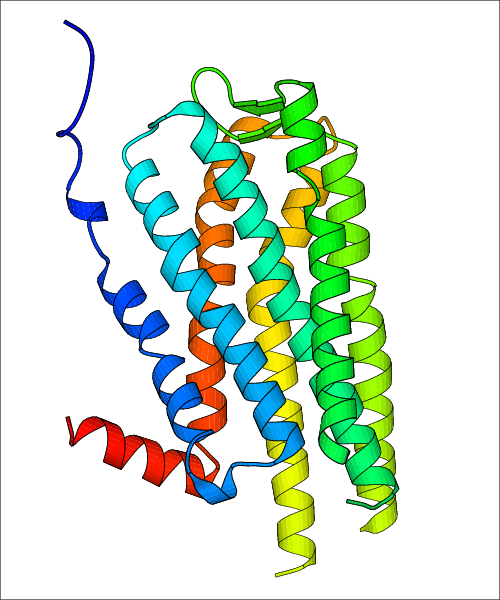 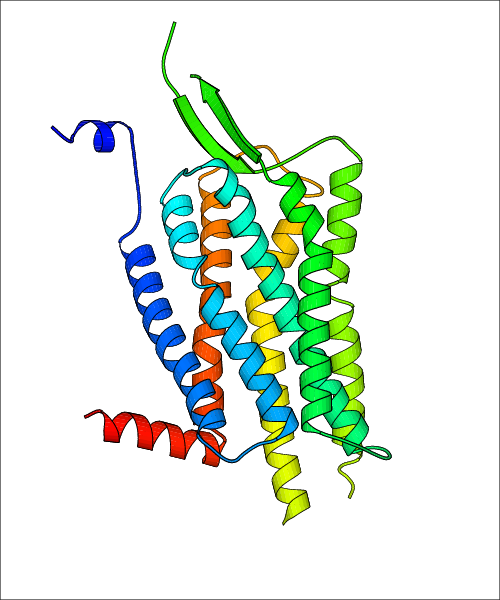 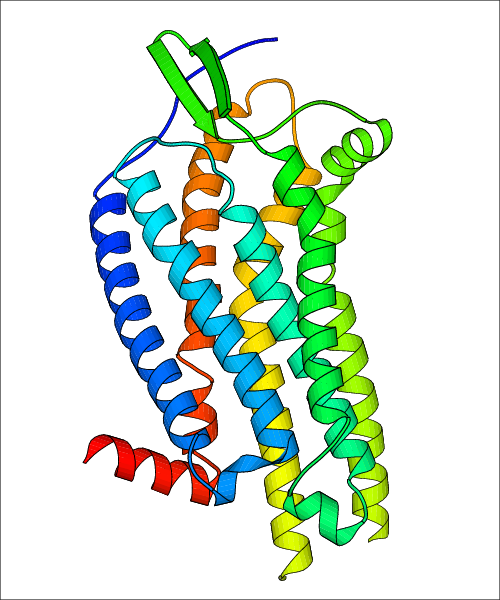 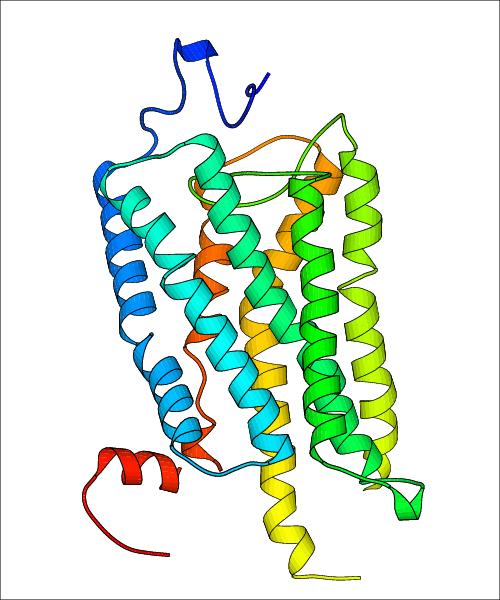 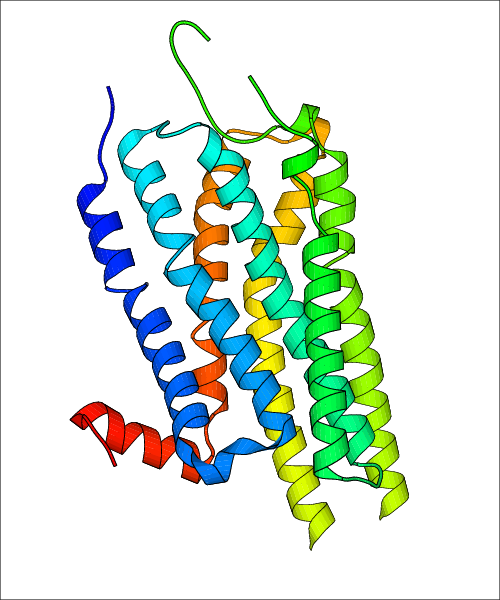 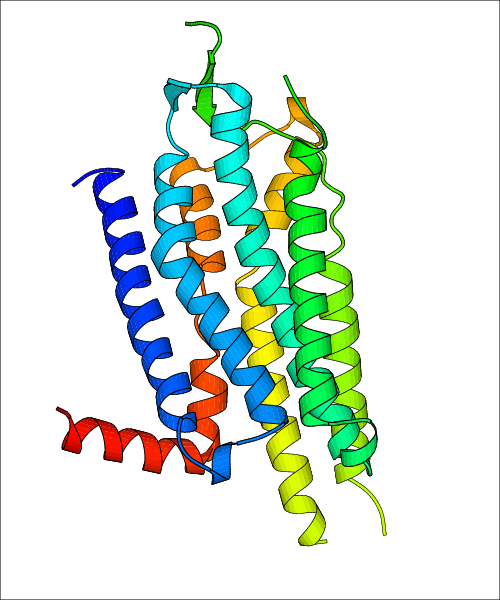 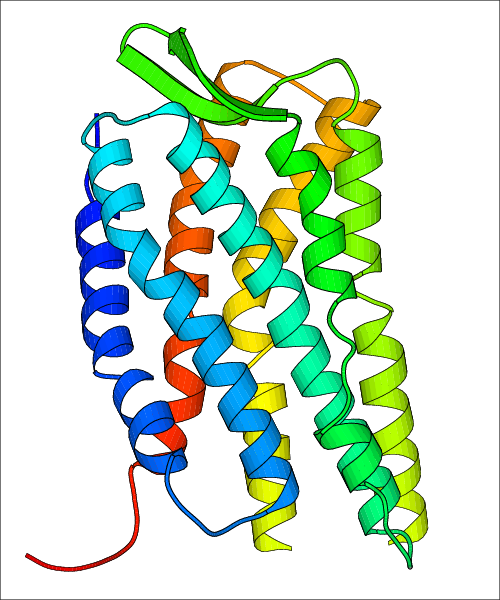 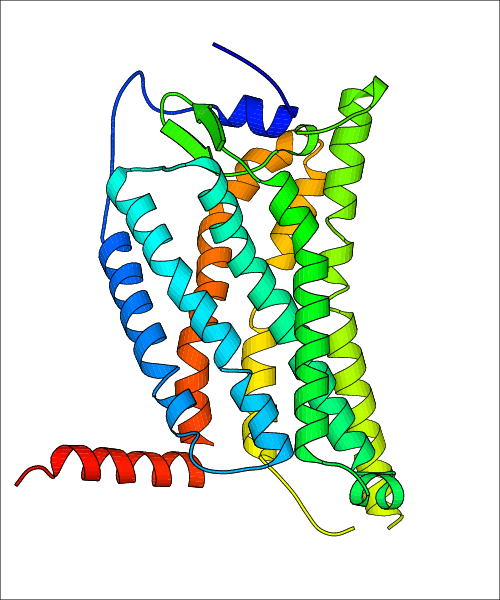 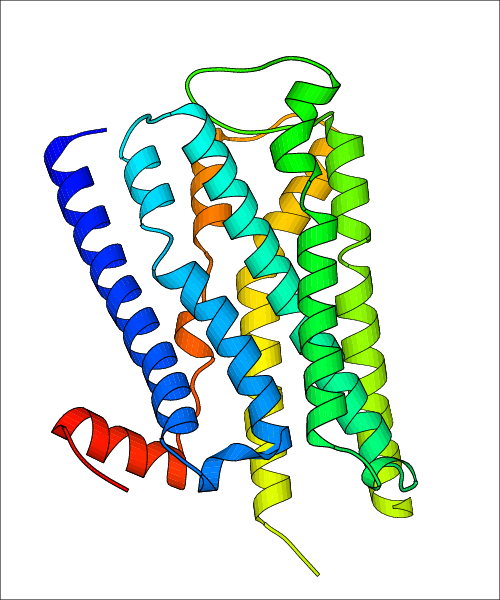 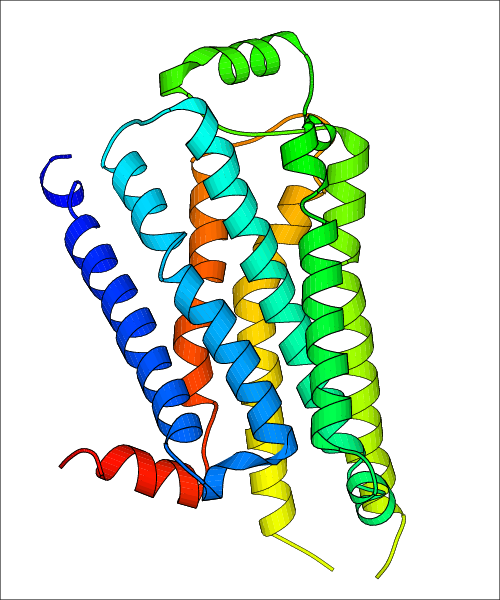 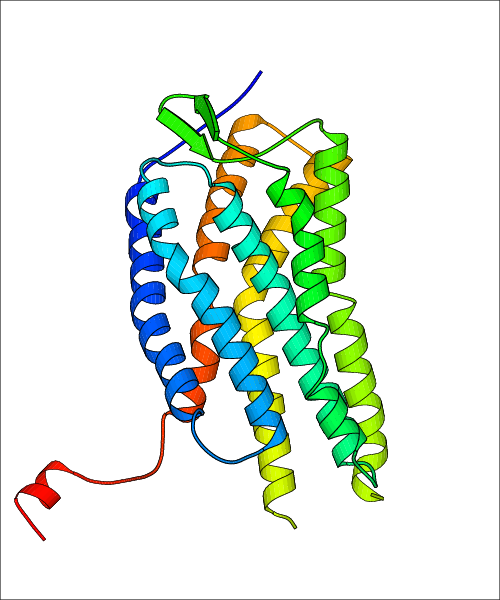 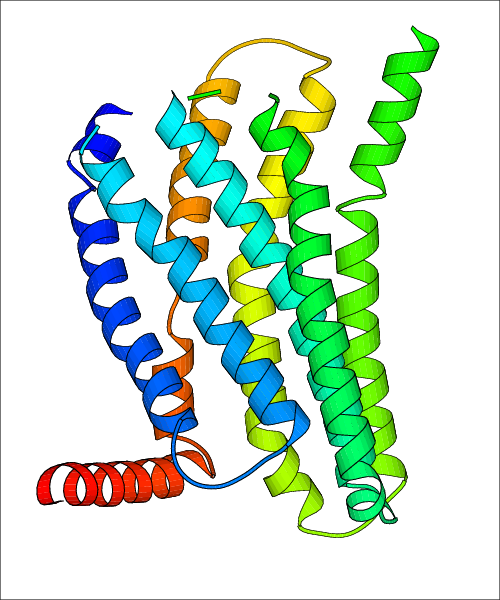 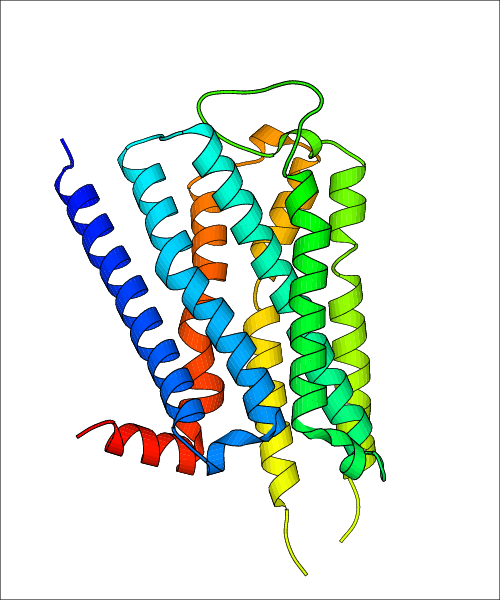 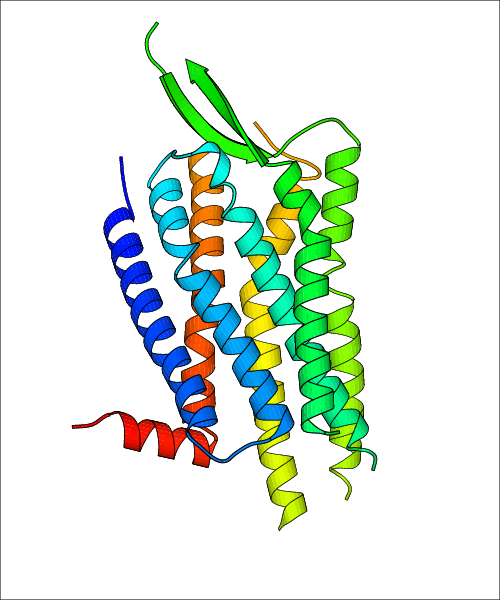 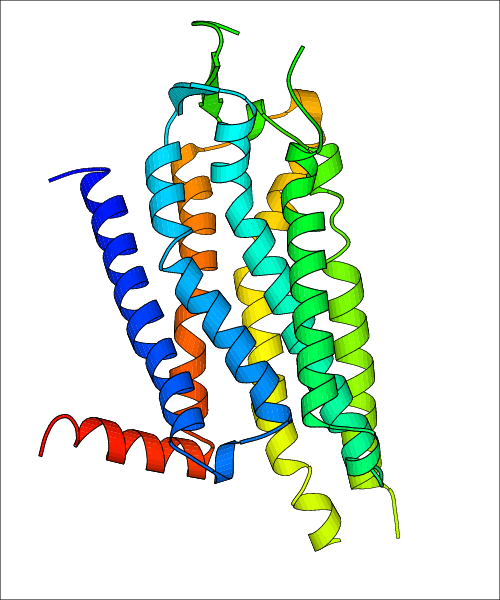 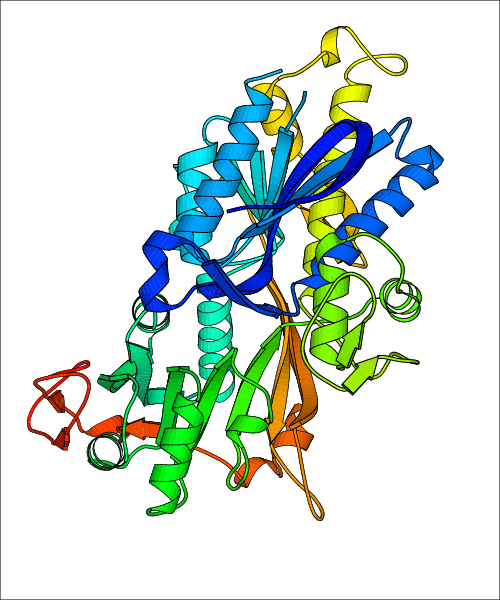 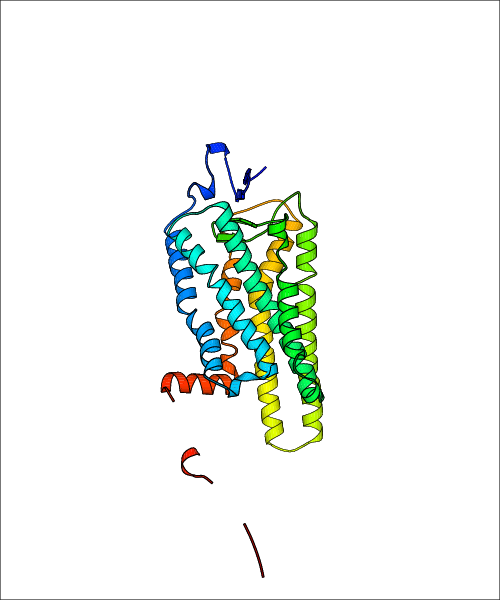 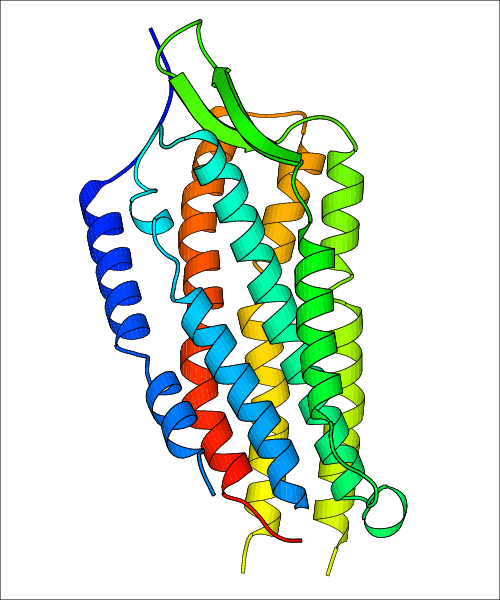 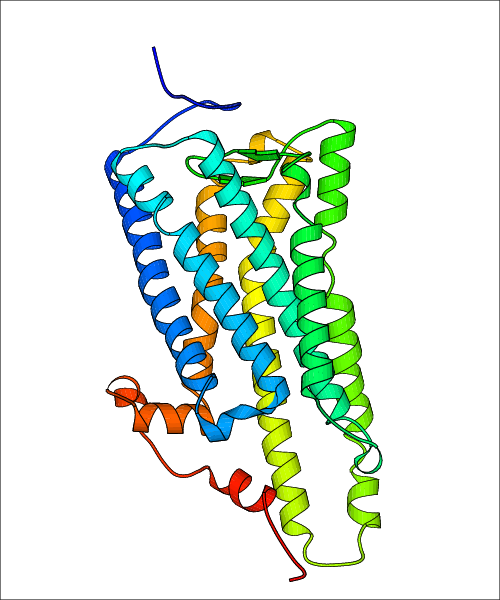 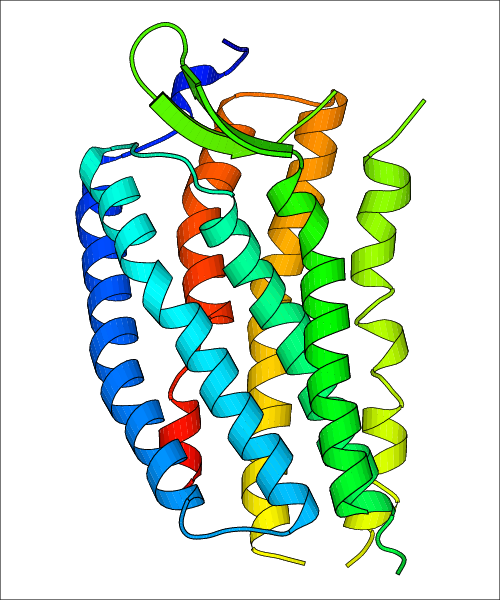 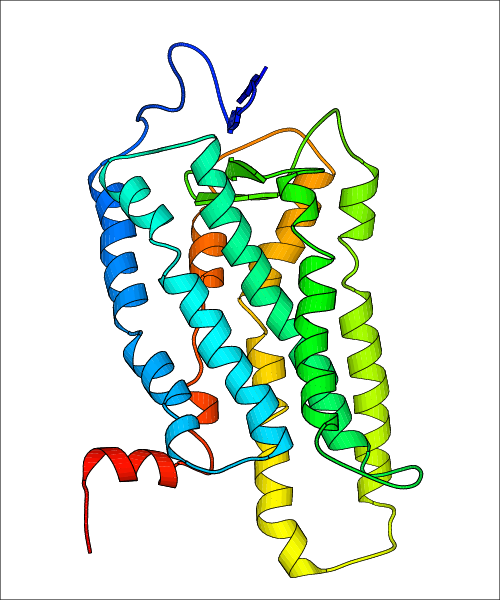 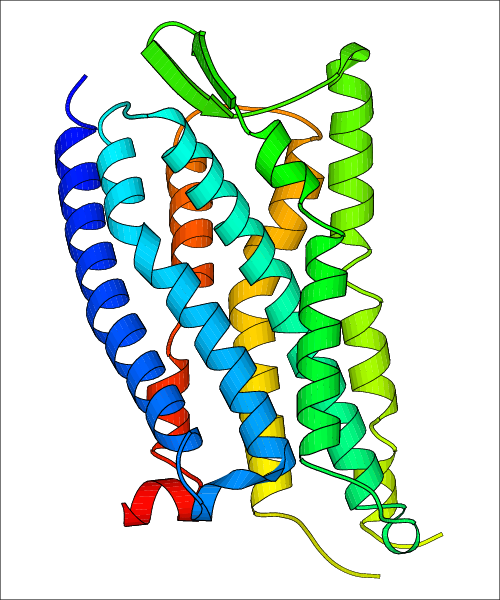 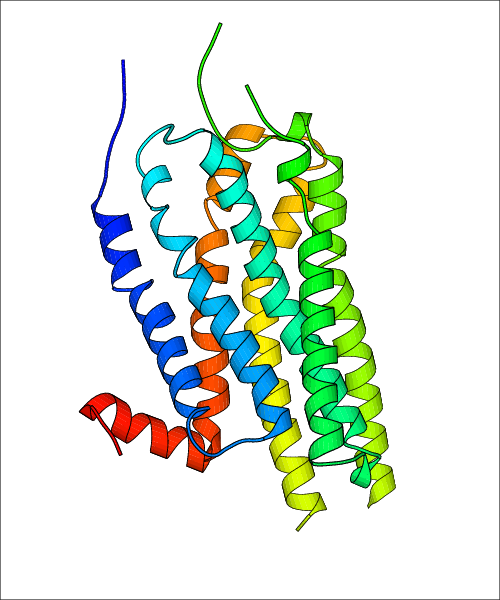 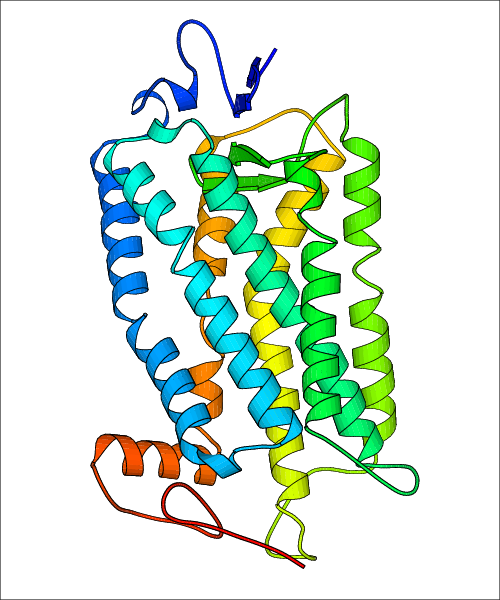 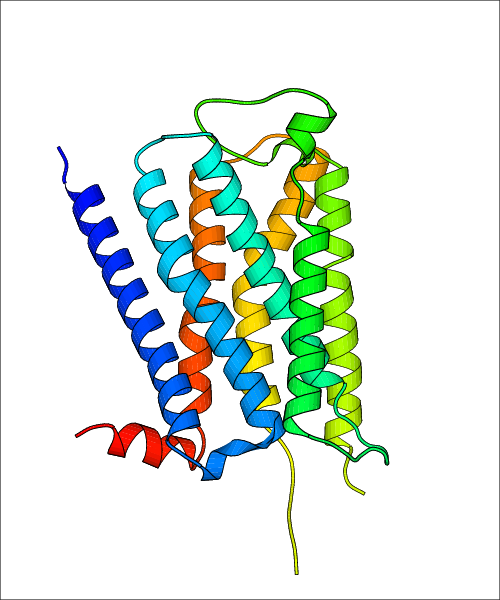 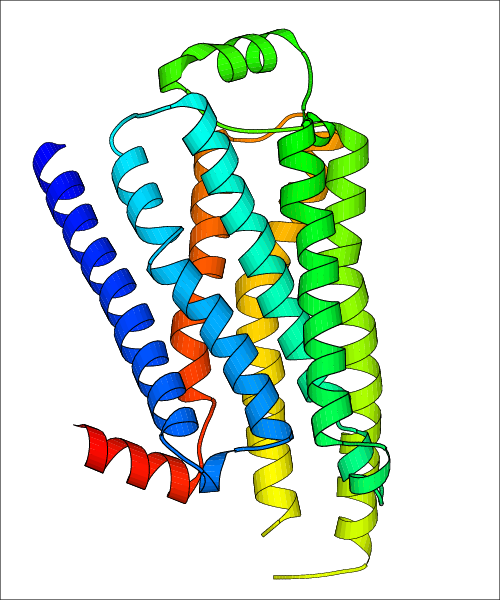 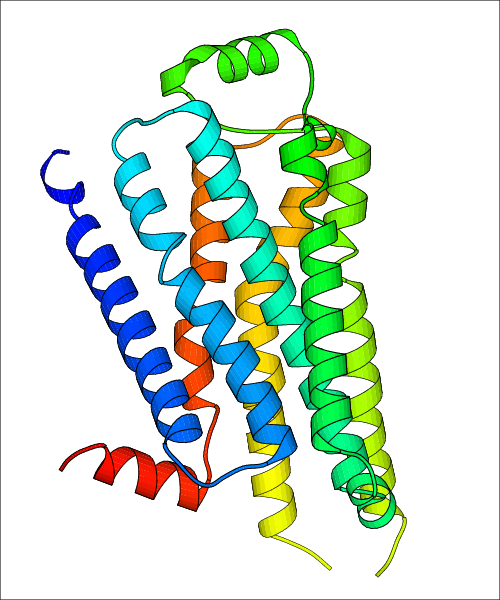 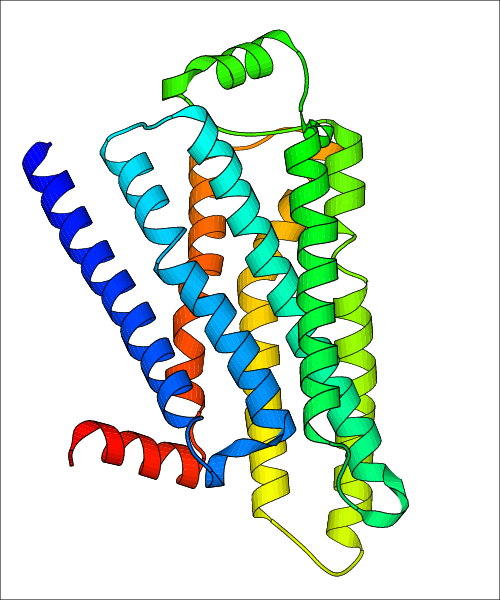 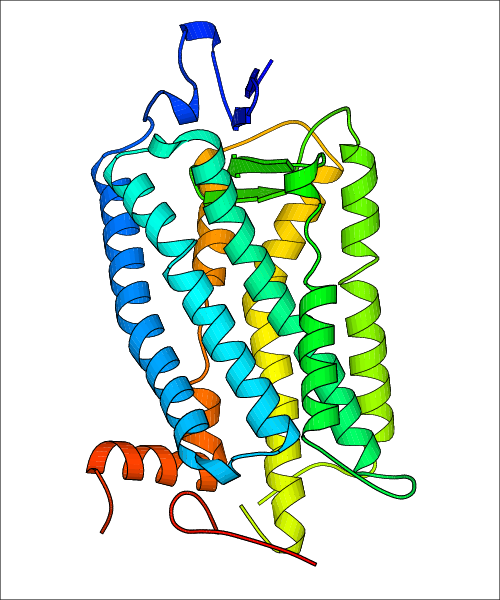 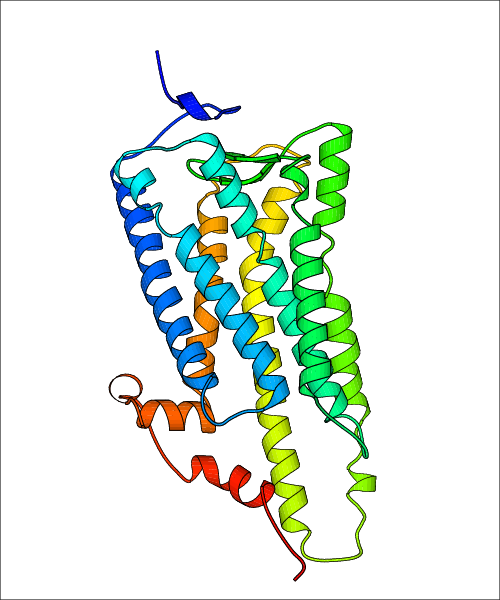 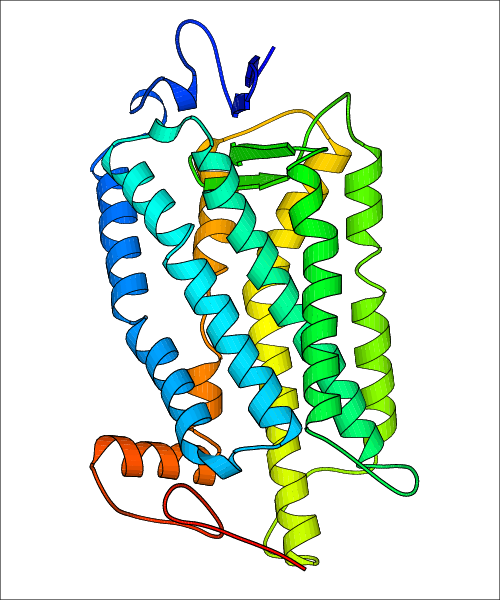 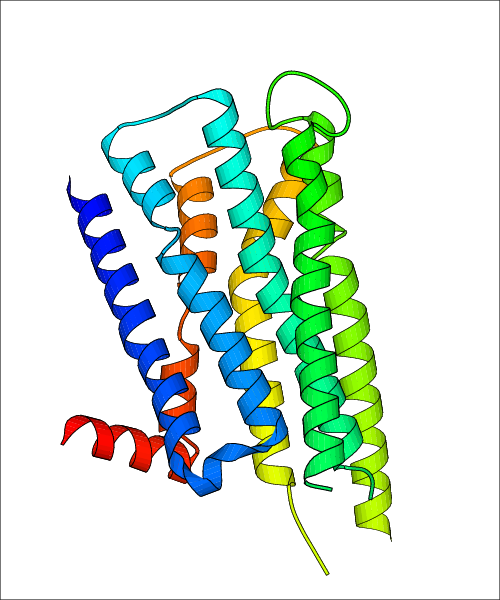 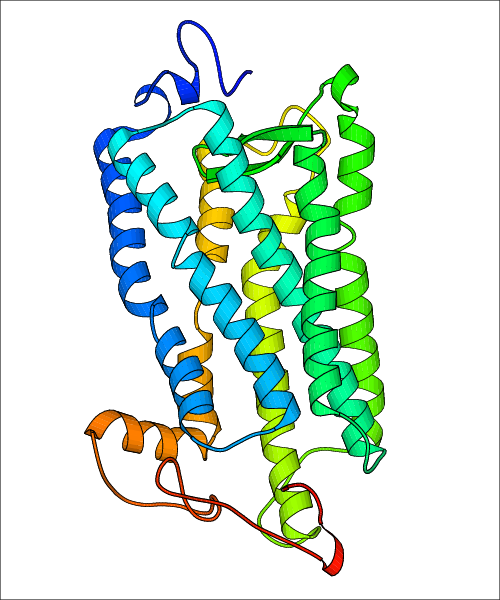 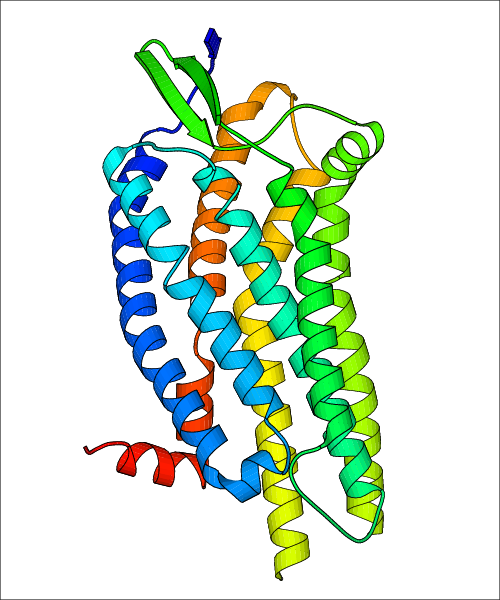 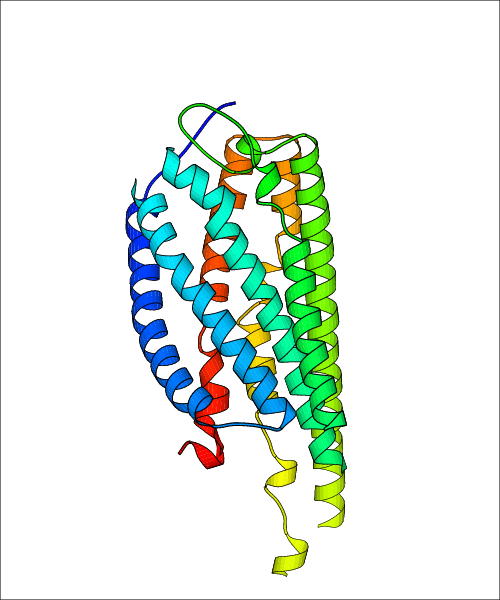 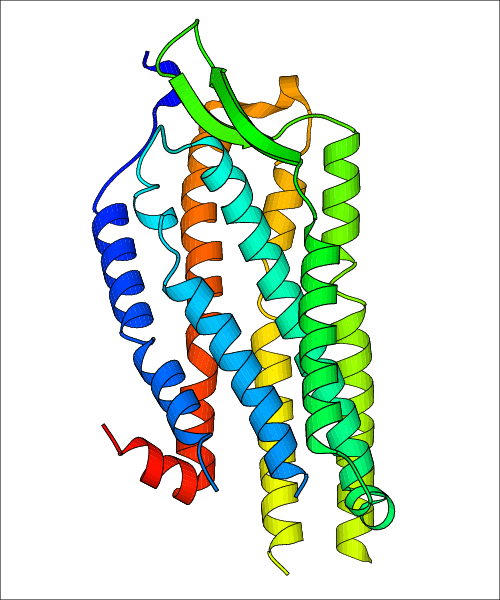 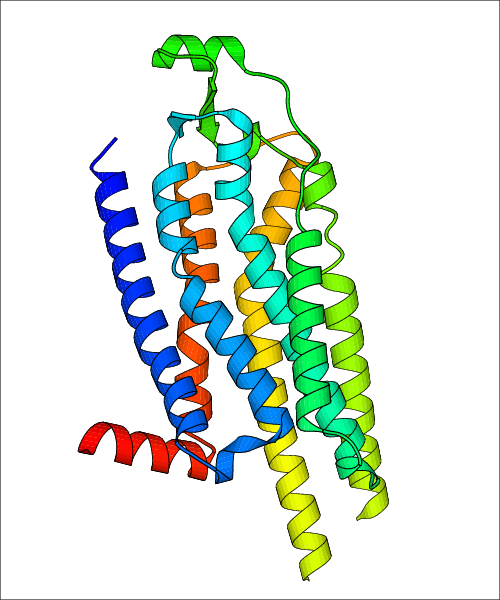 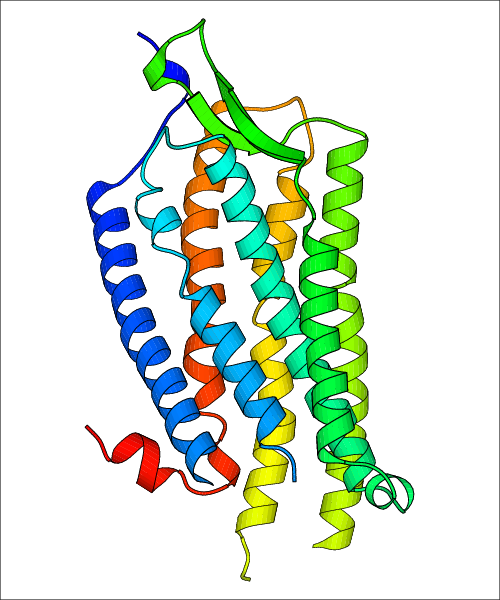 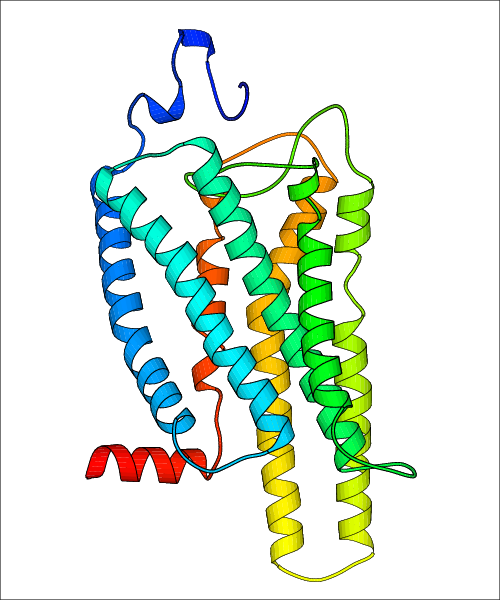 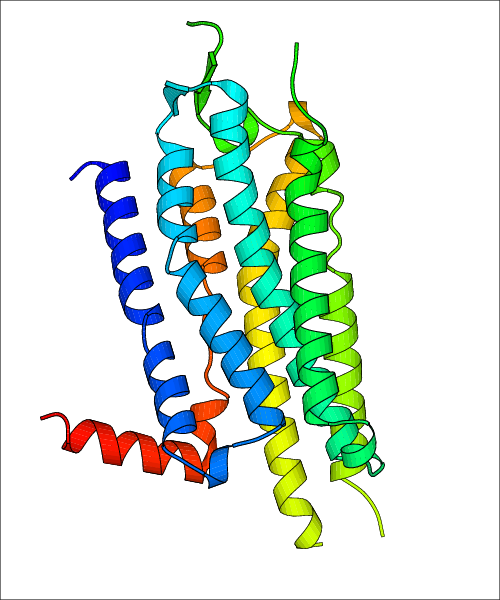 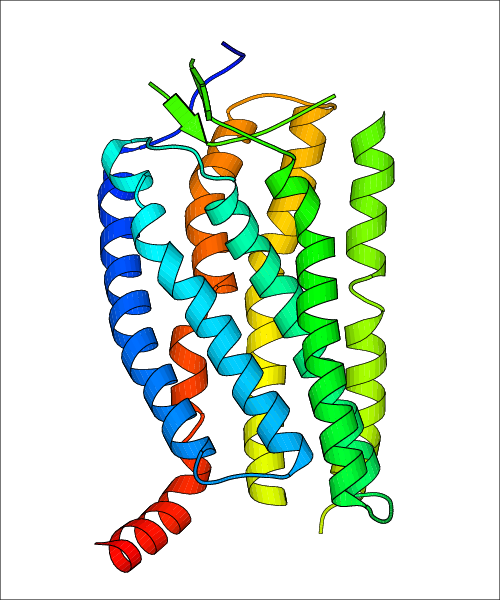 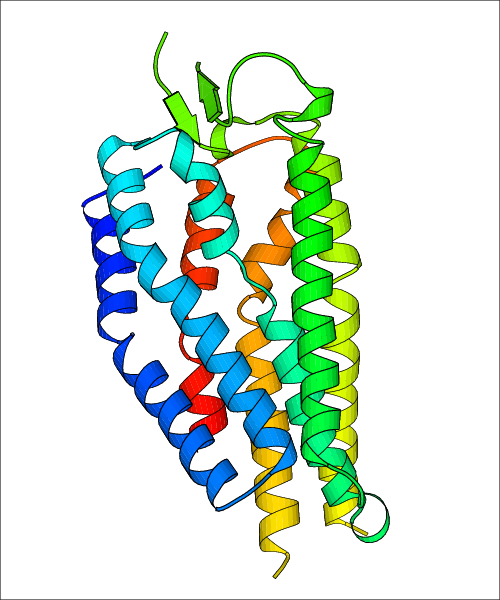 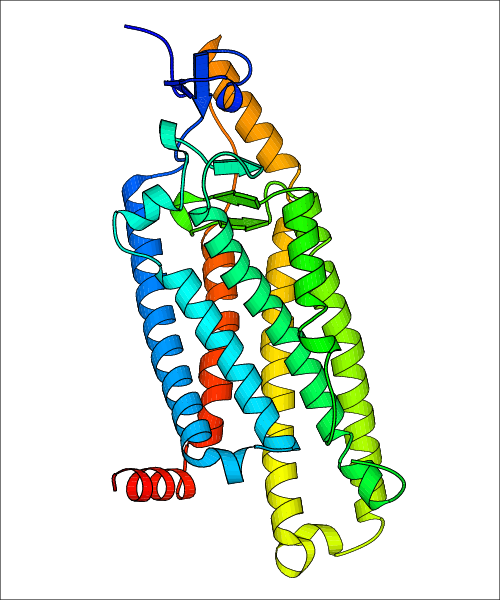 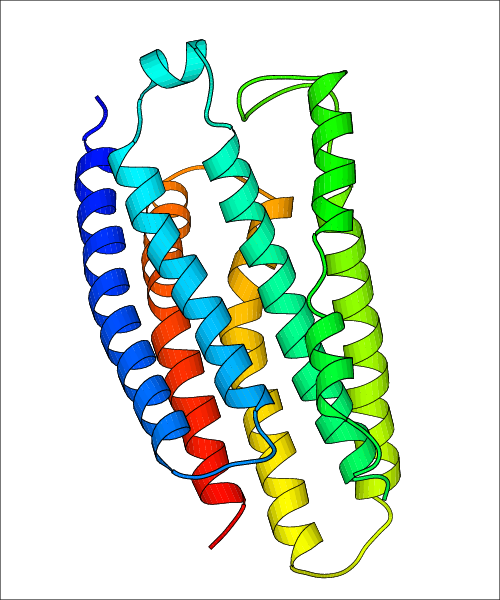 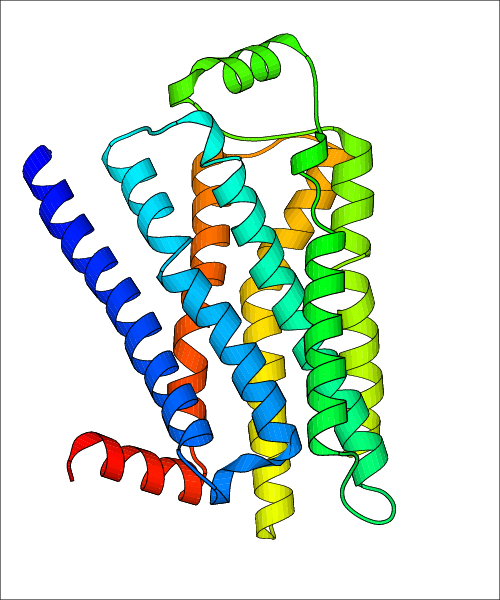 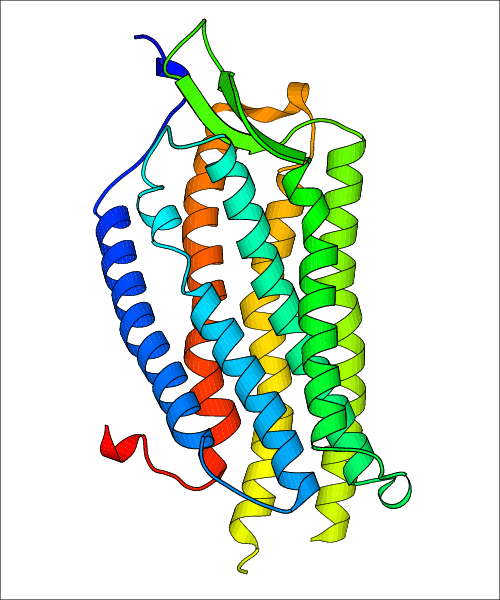 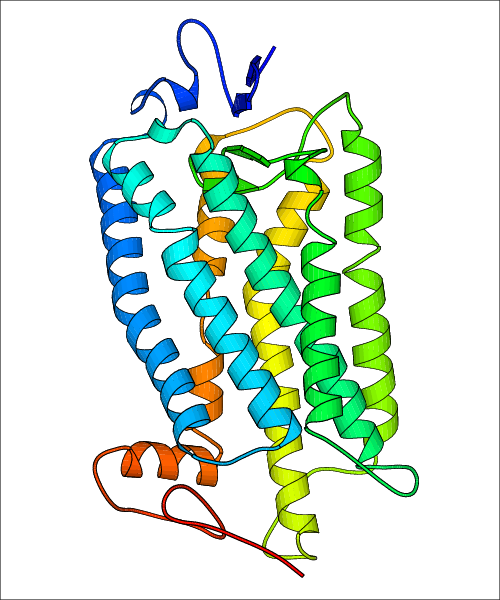 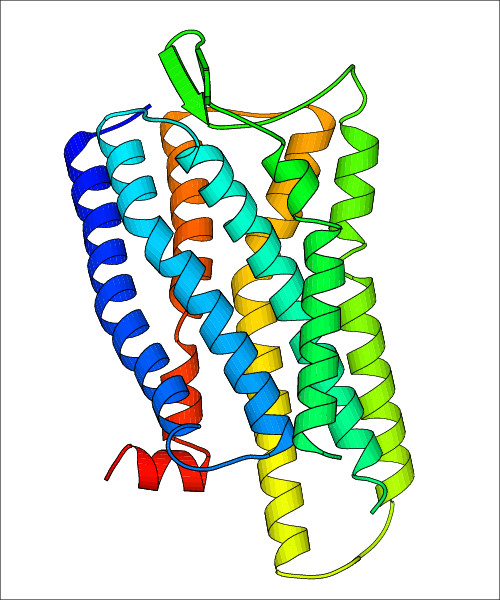 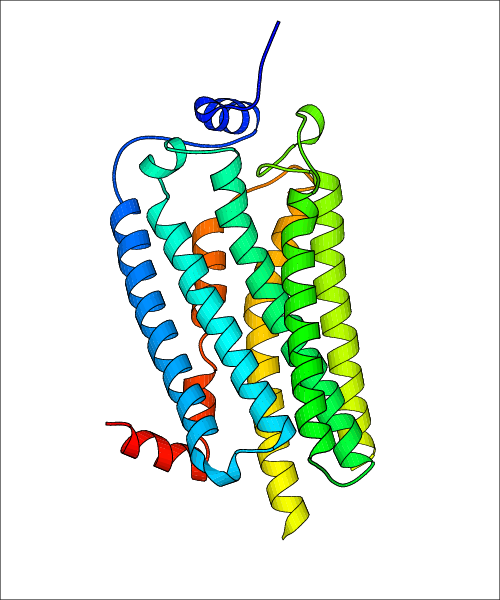 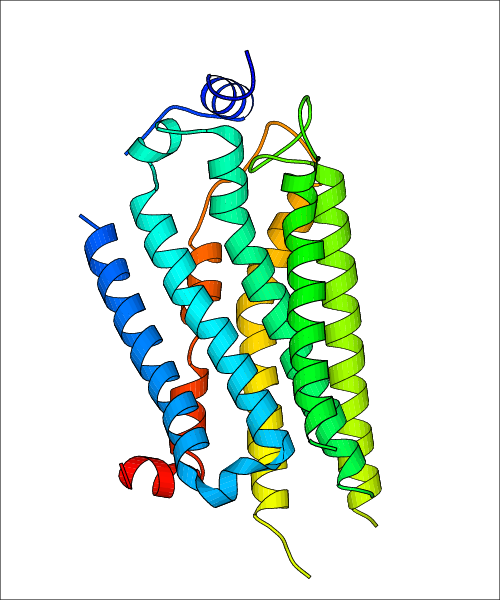 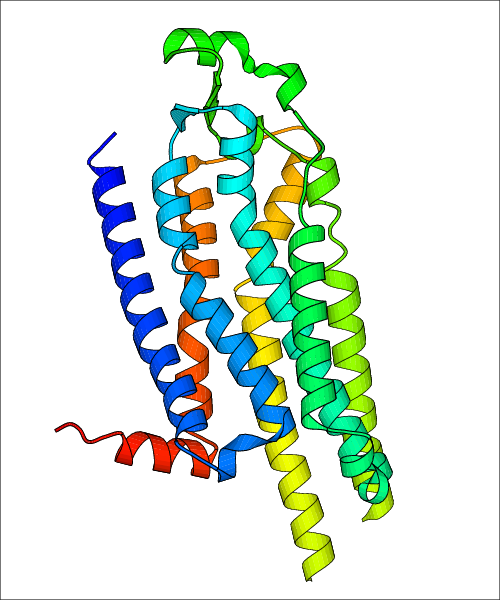 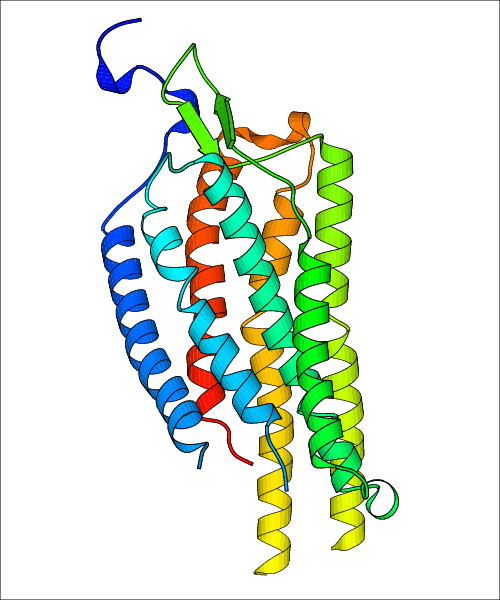 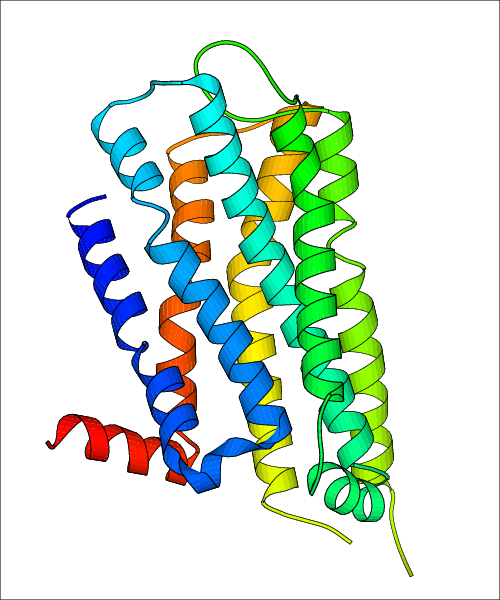 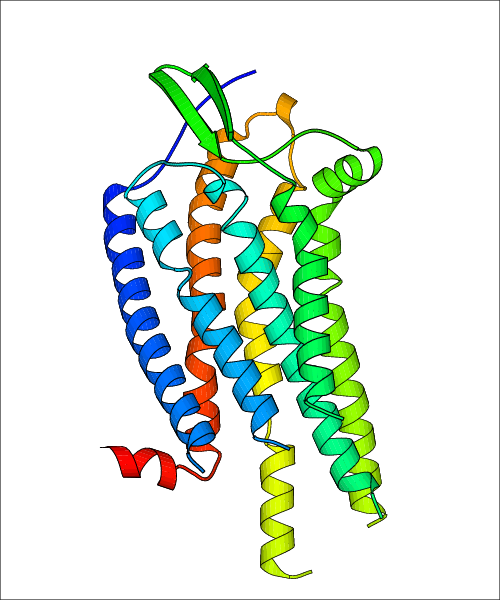 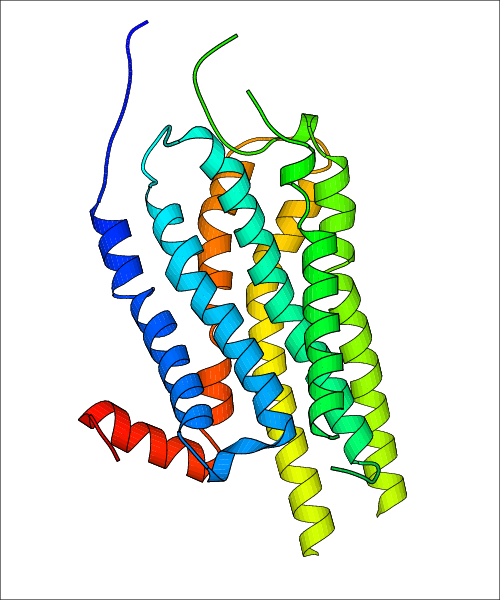 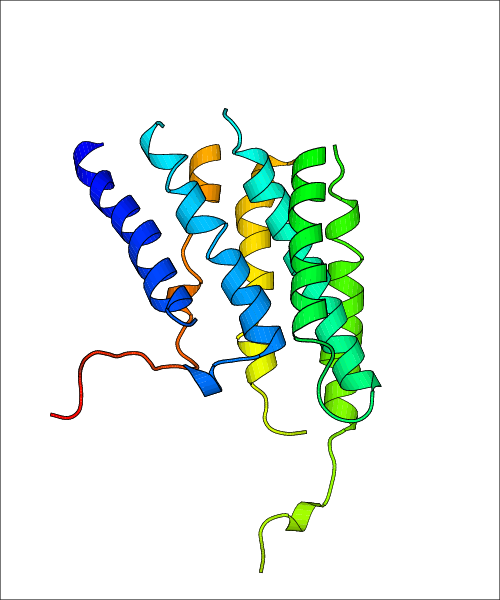 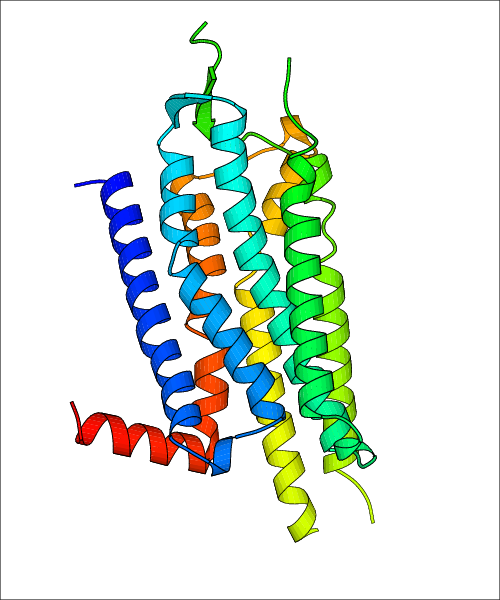 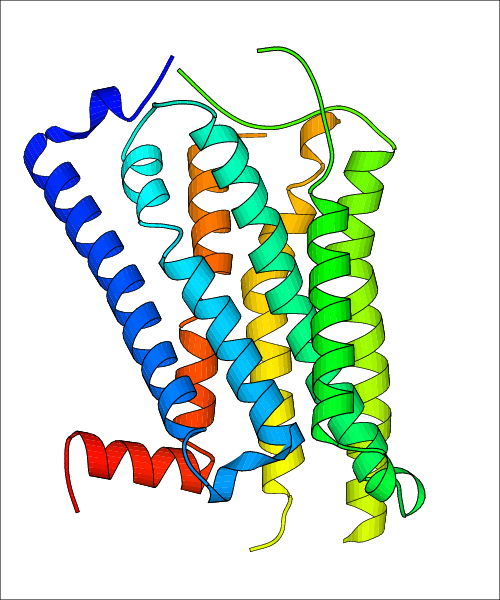 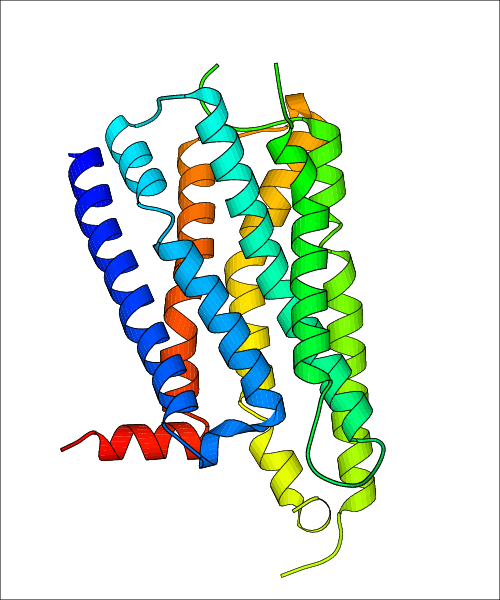 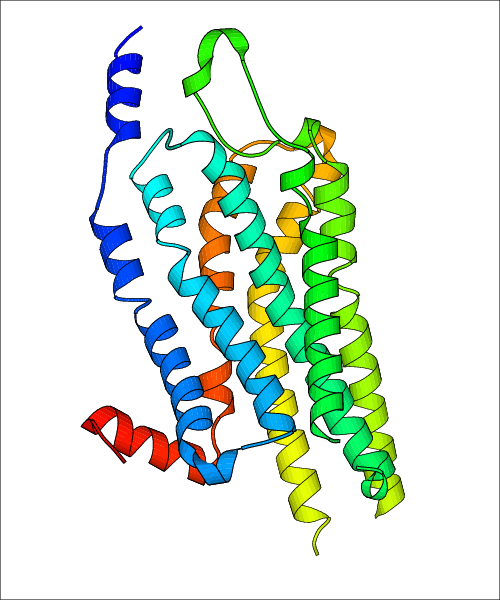 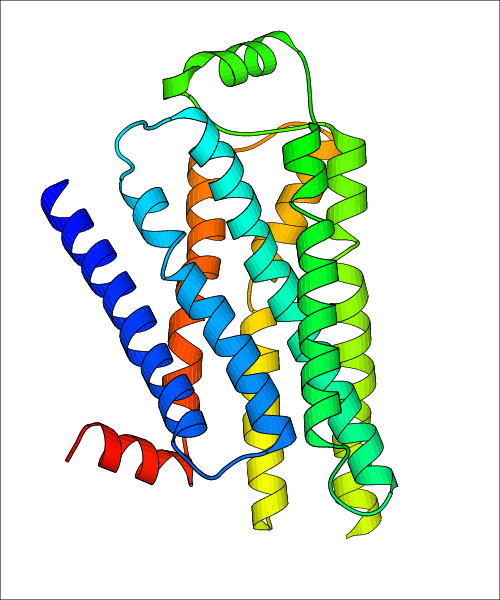 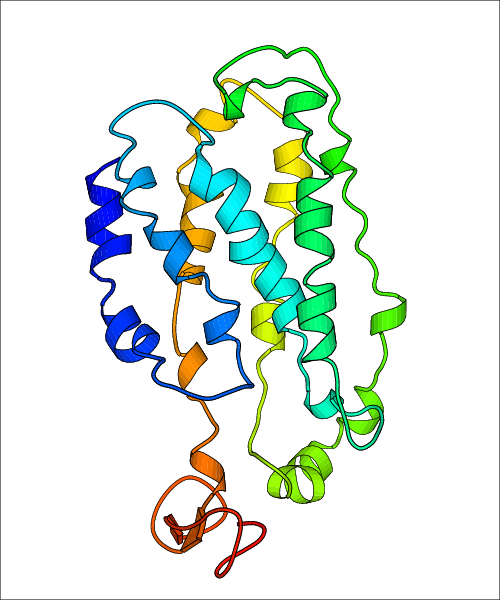 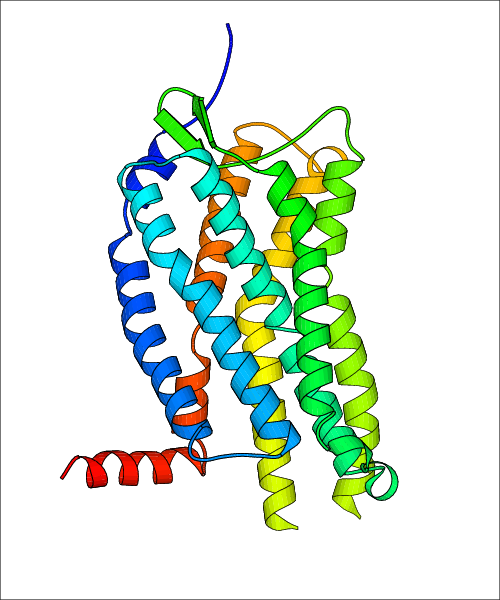 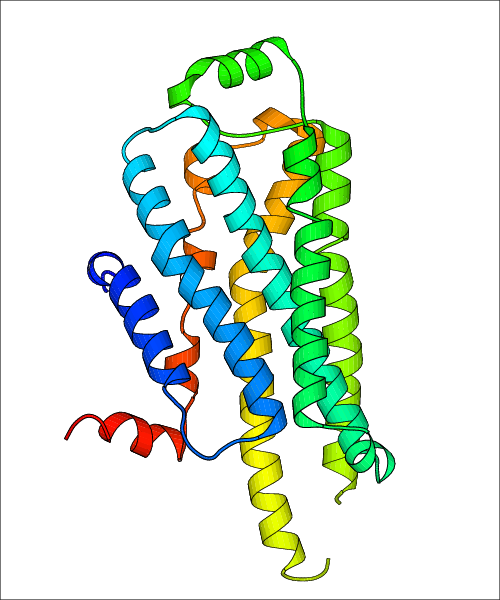 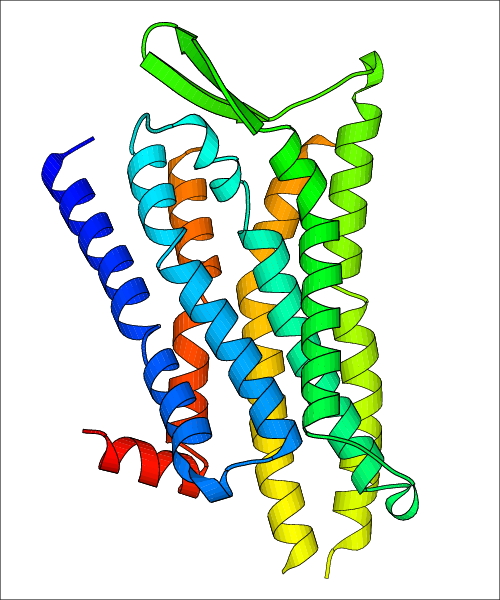 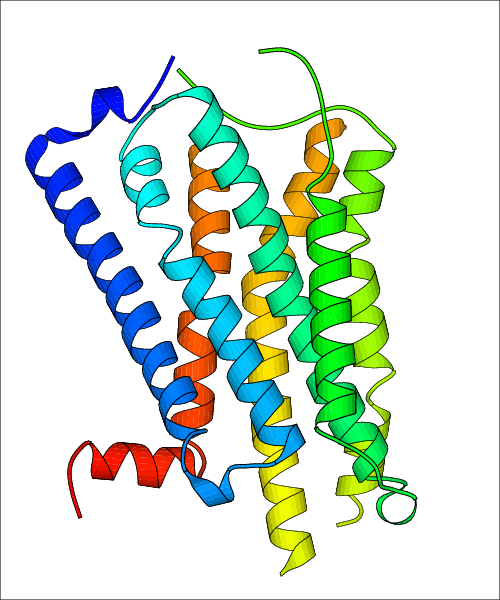 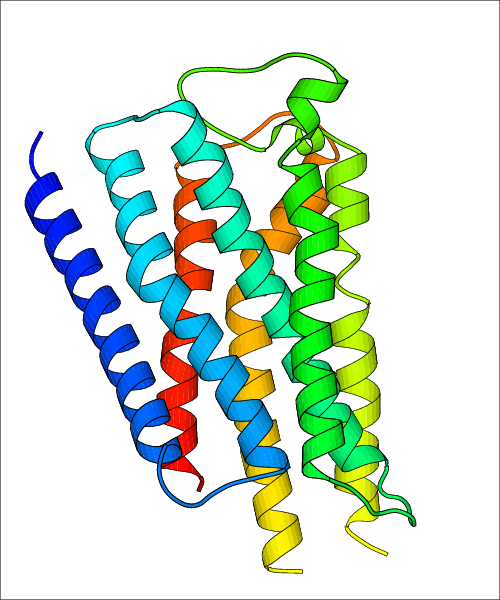 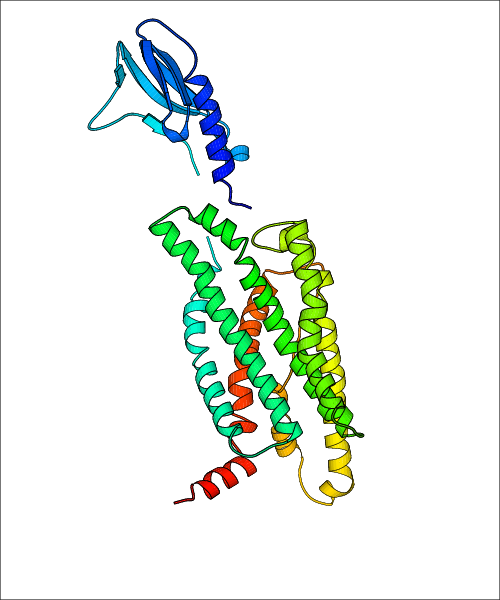 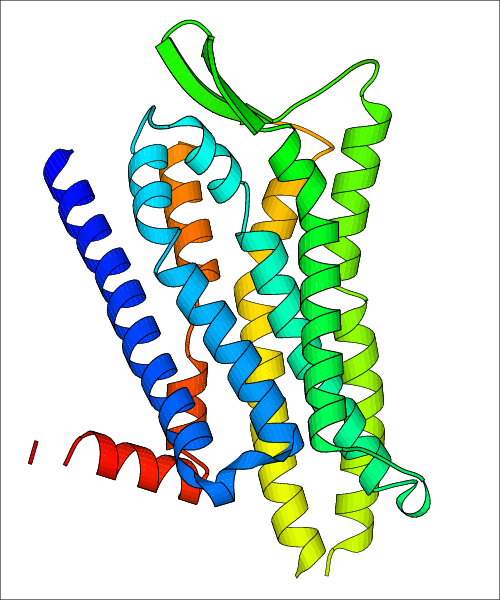 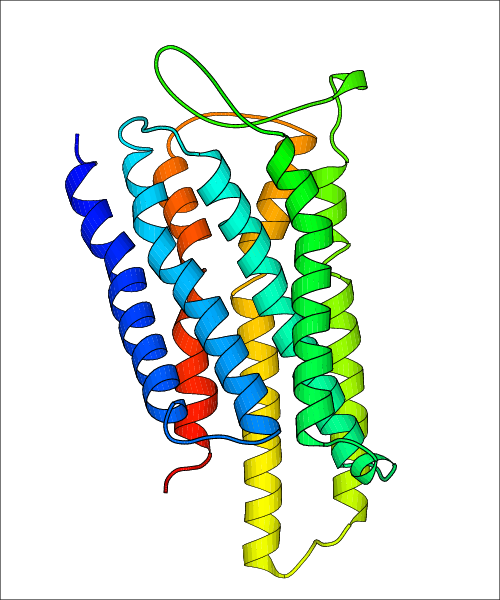 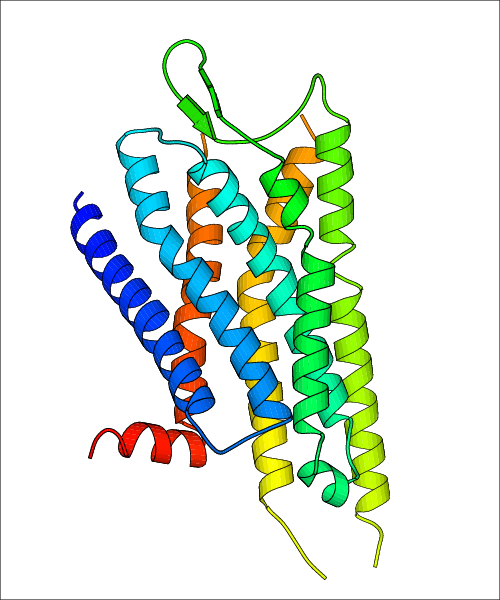 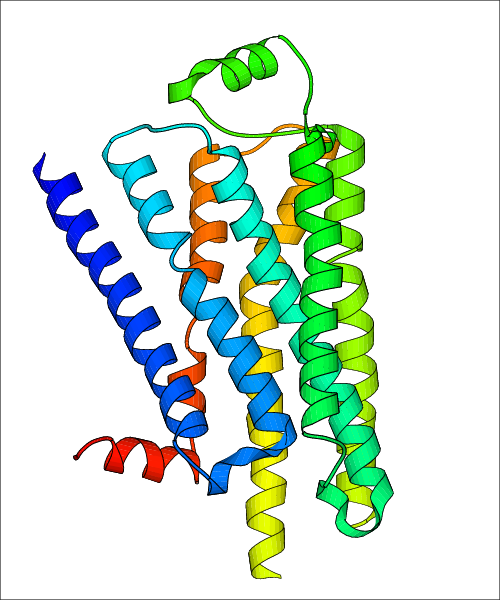 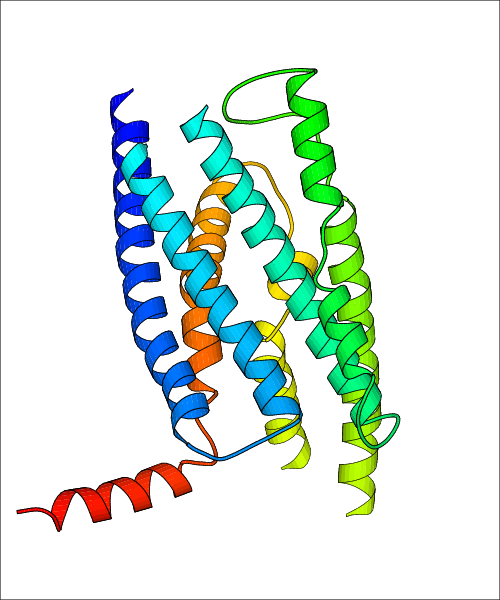 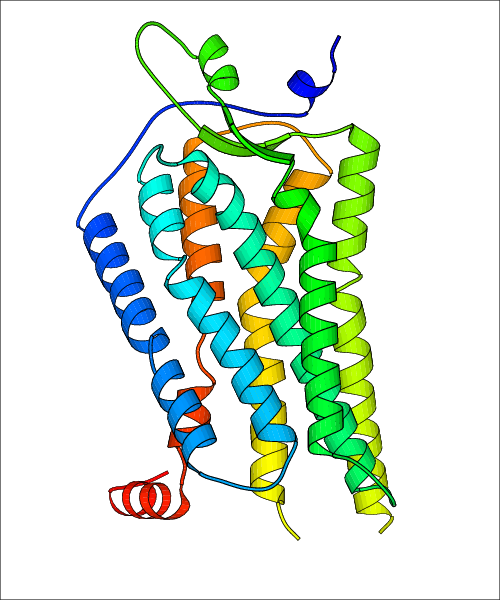 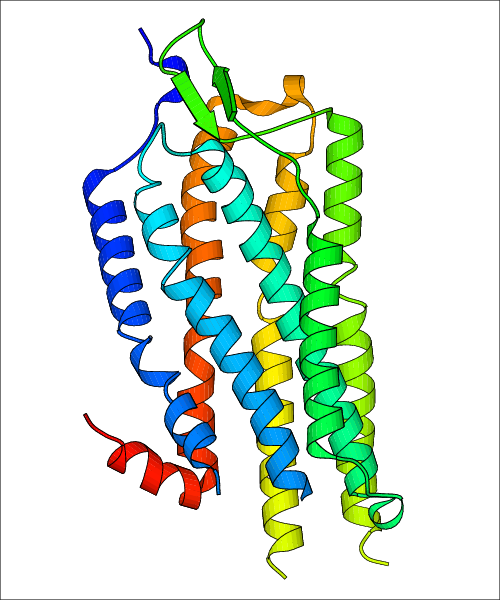 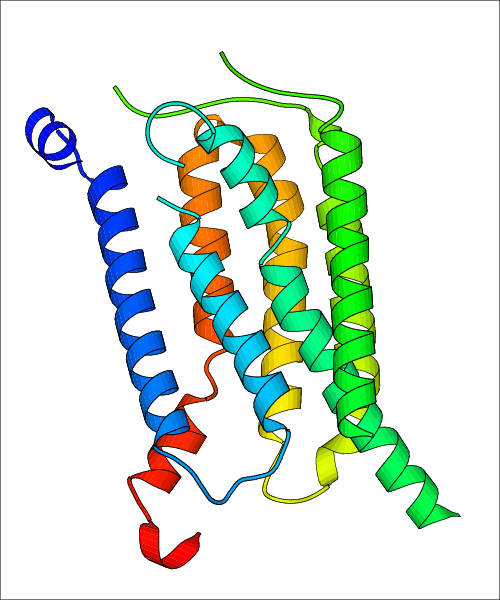 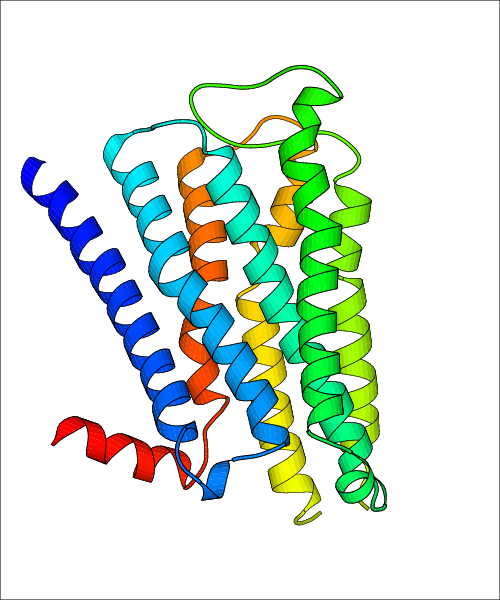 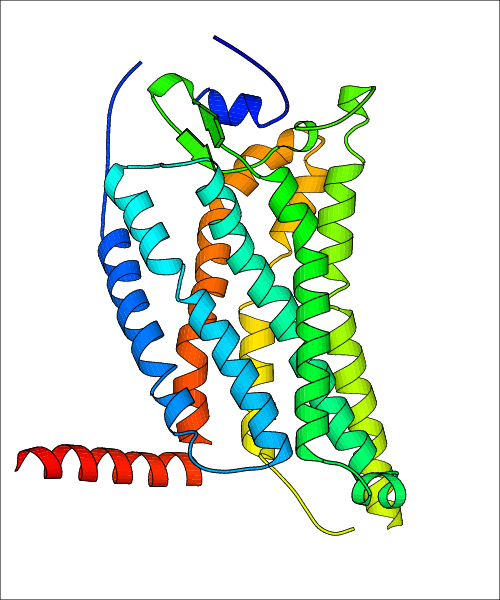 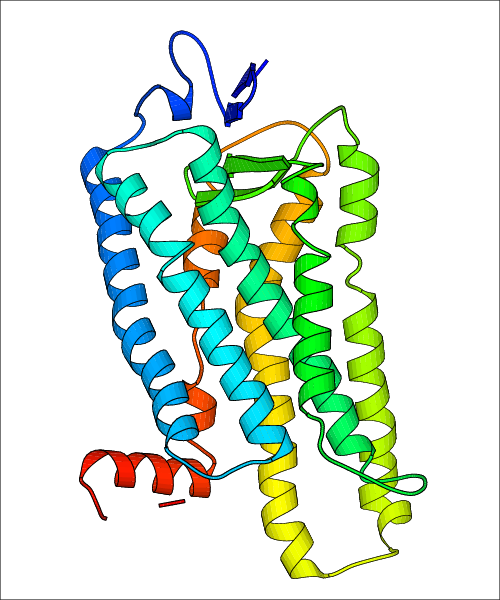 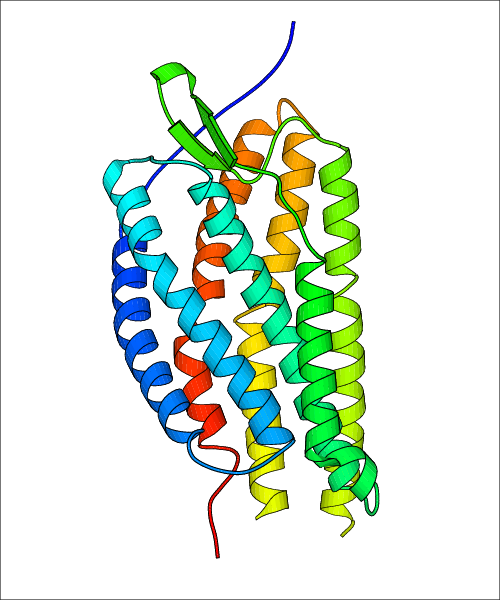 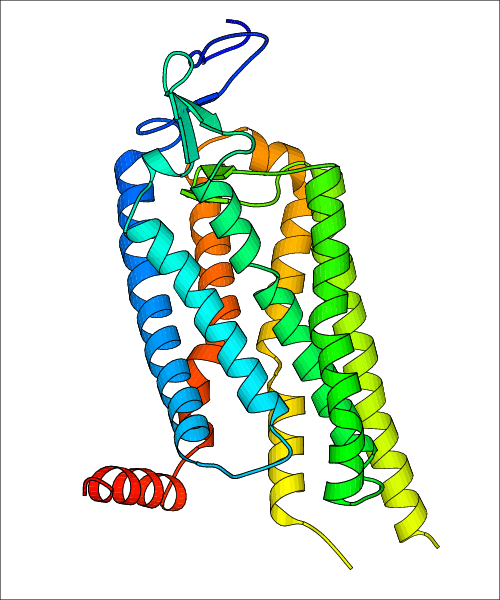 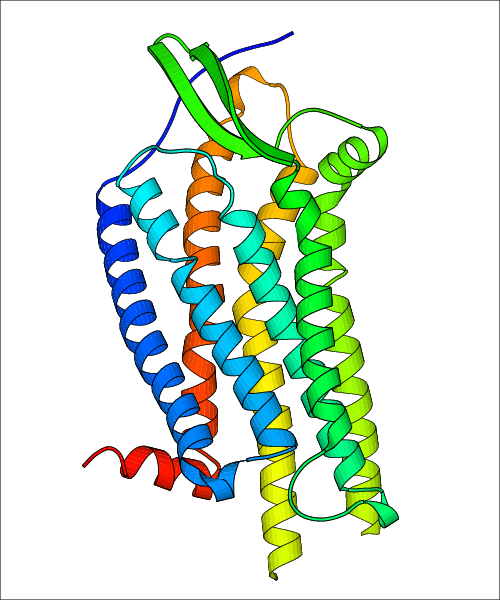 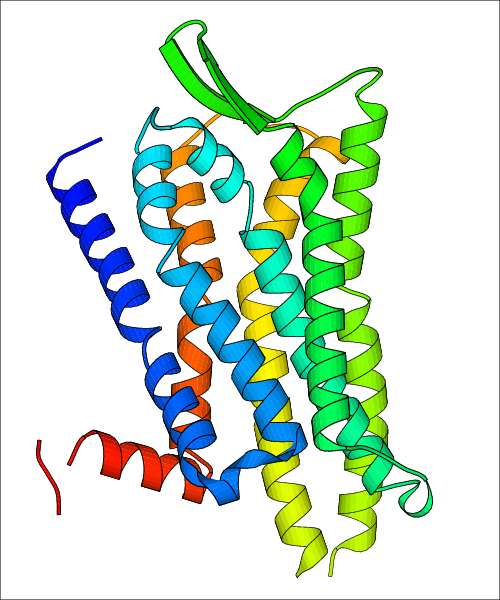 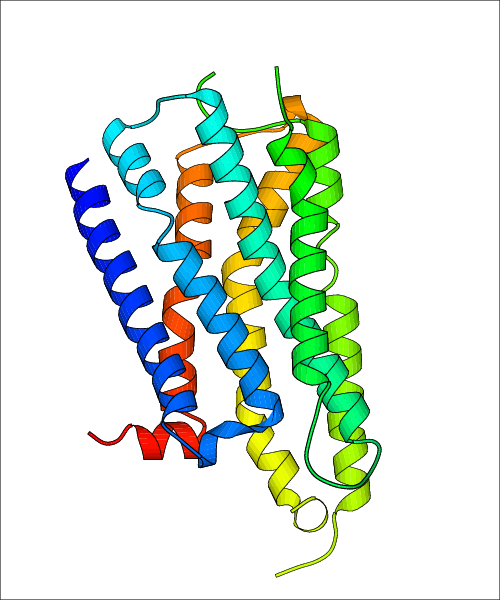 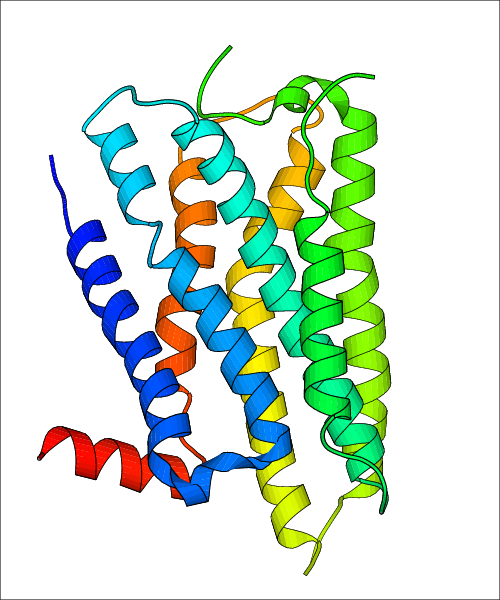 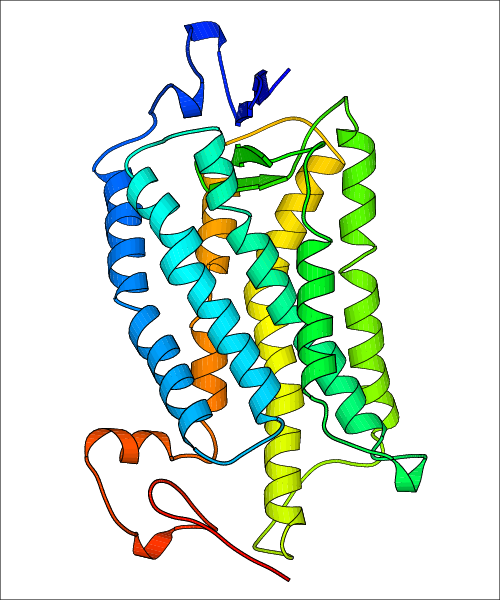 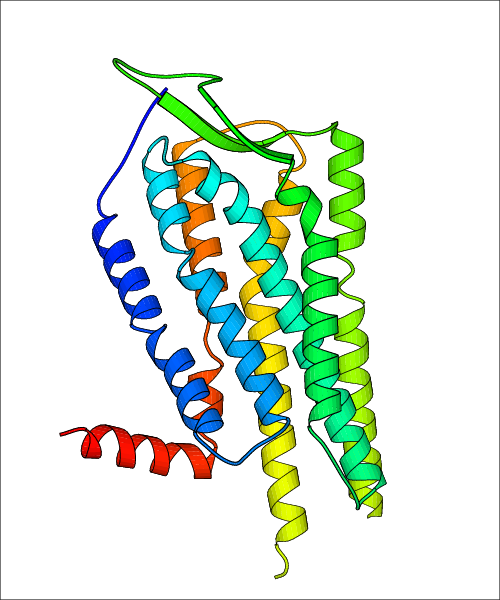 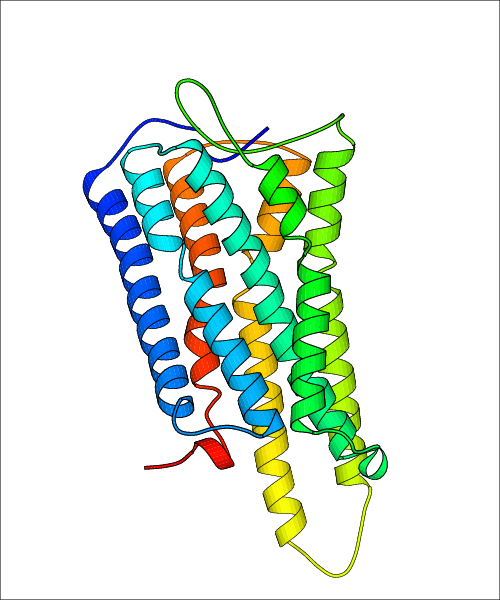 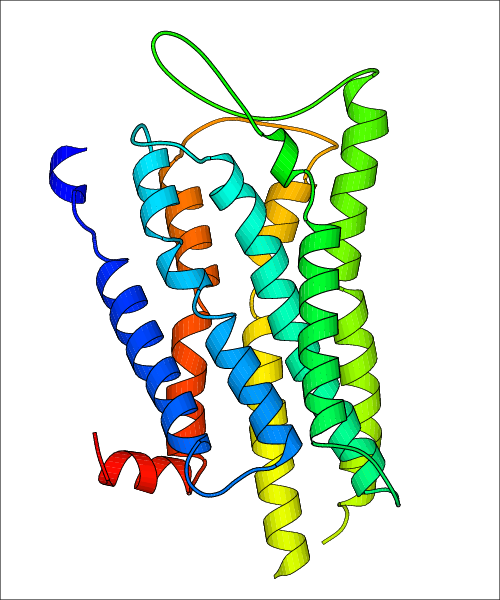 5WQC Homo sapiens (Human) (O43614) Crystal structure of human orexin 2 receptor bound to the selective antagonist EMPA determined by the synchrotron light source at SPring-8. 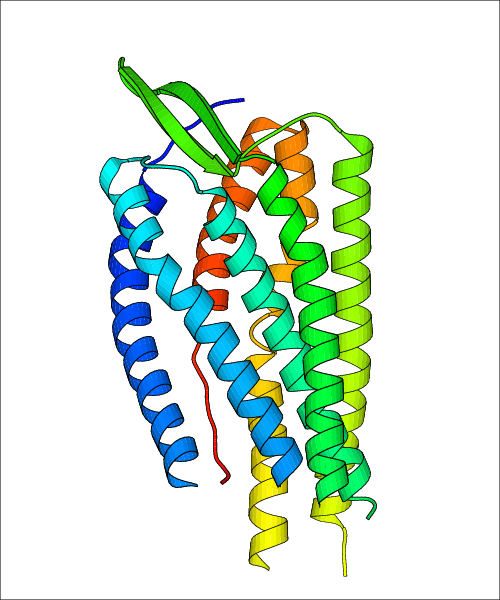 2X72 Bos taurus (Bovine) (P02699) CRYSTAL STRUCTURE OF THE CONSTITUTIVELY ACTIVE E113Q,D2C,D282C RHODOPSIN MUTANT WITH BOUND GALPHACT PEPTIDE. 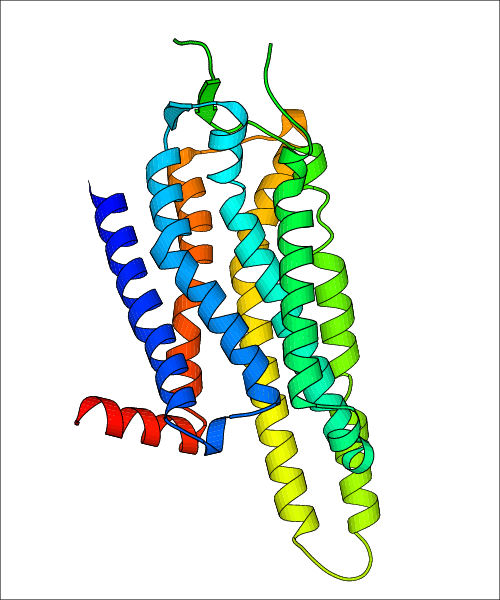 4ZUD Homo sapiens (Human) (P30556) Crystal Structure of Human Angiotensin Receptor in Complex with Inverse Agonist Olmesartan at 2.8A resolution. 6FJ3 Homo sapiens (Human) (Q03431) High resolution crystal structure of parathyroid hormone 1 receptor in complex with a peptide agonist. 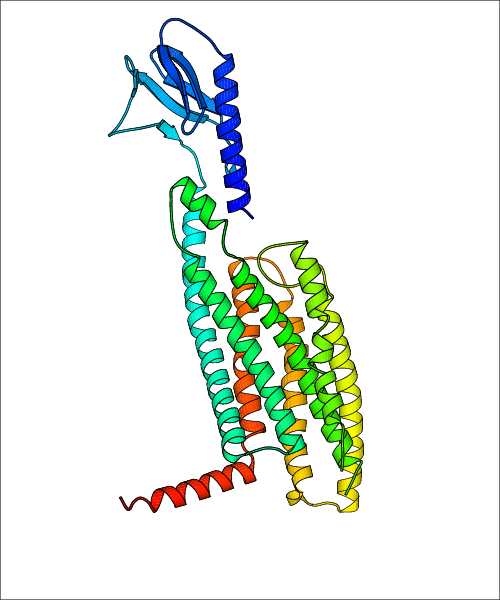 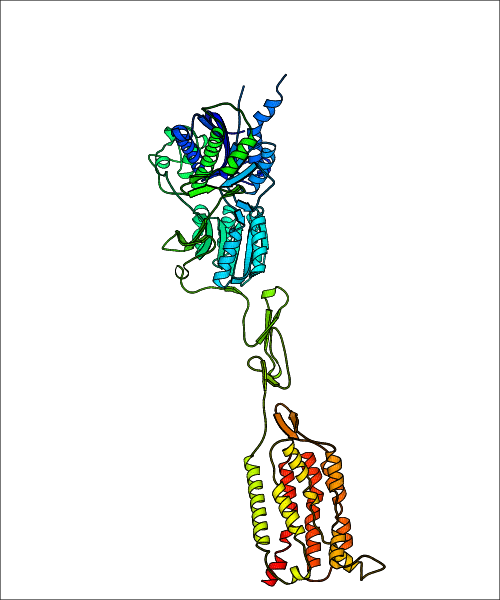 4N4W Homo sapiens (Human) (Q99835) Structure of the human smoothened receptor in complex with SANT-1.